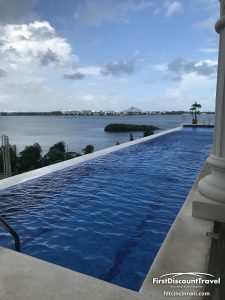 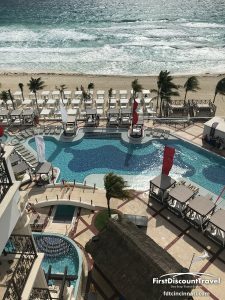 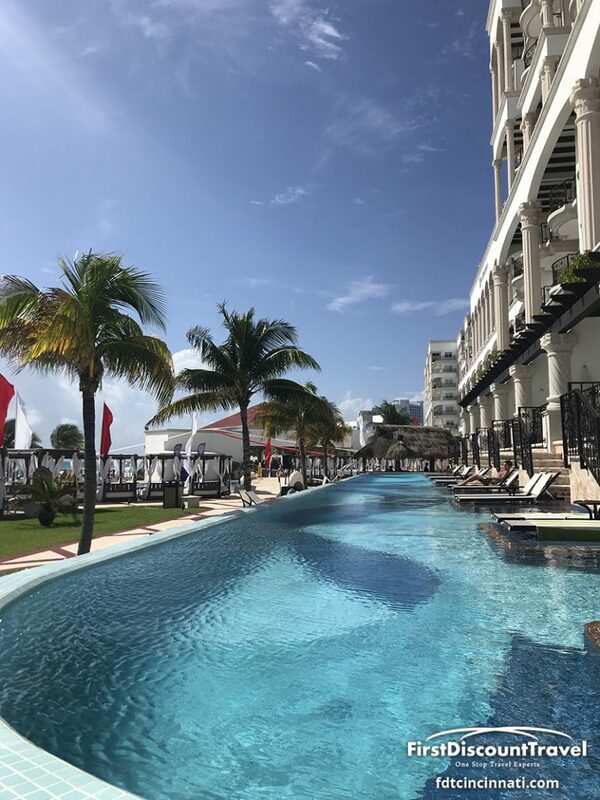 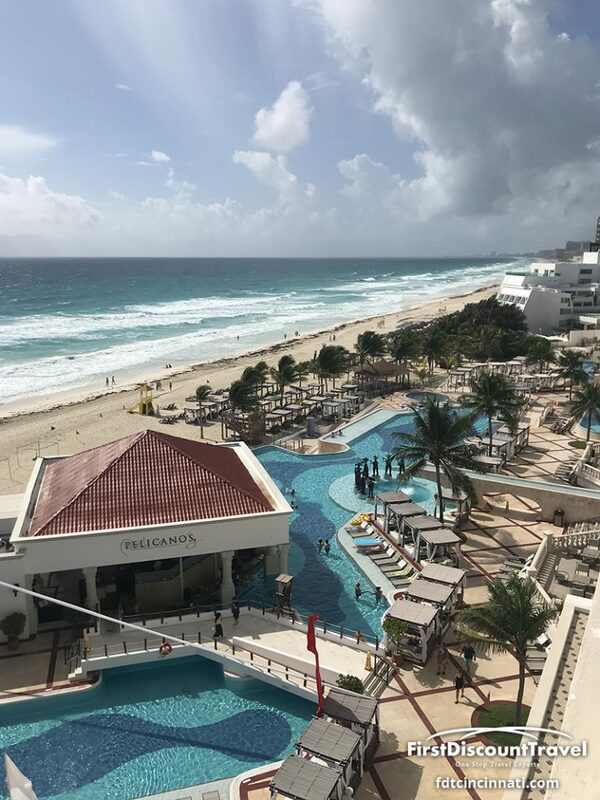 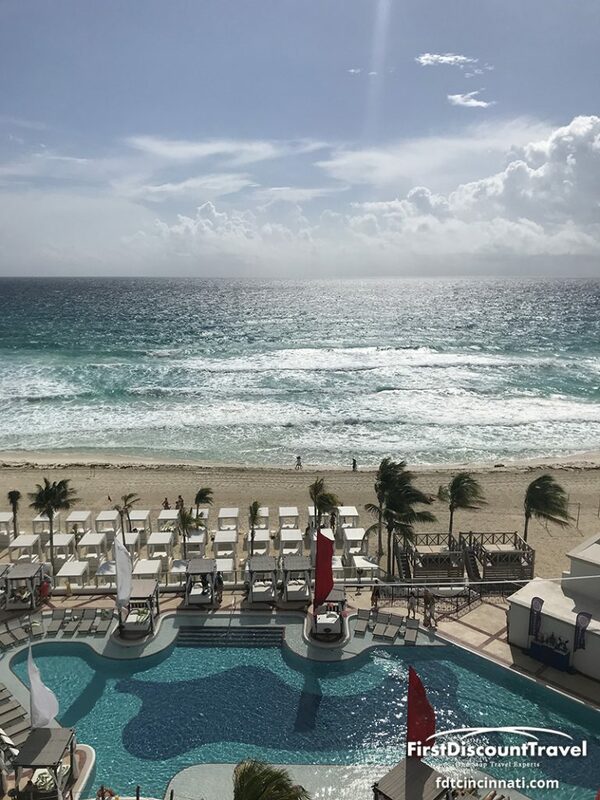 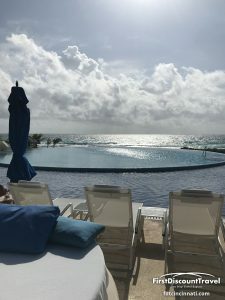 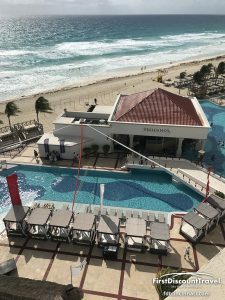 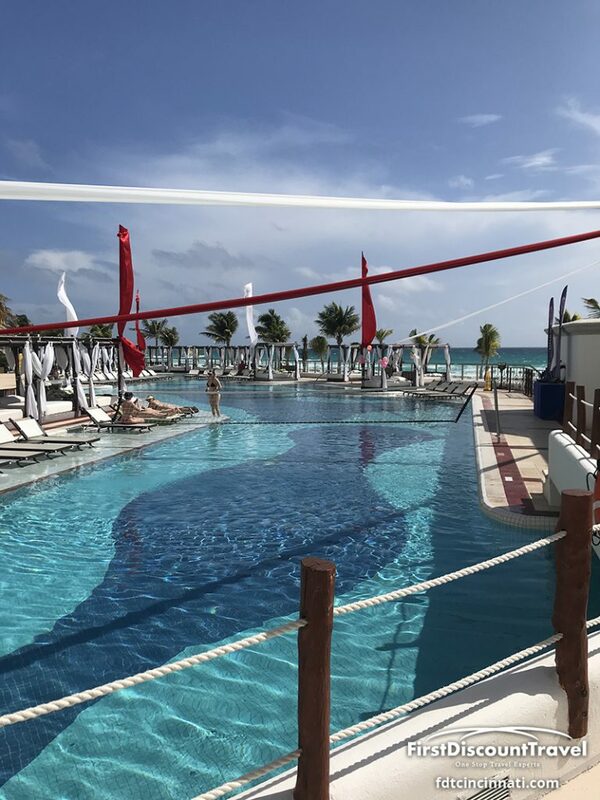 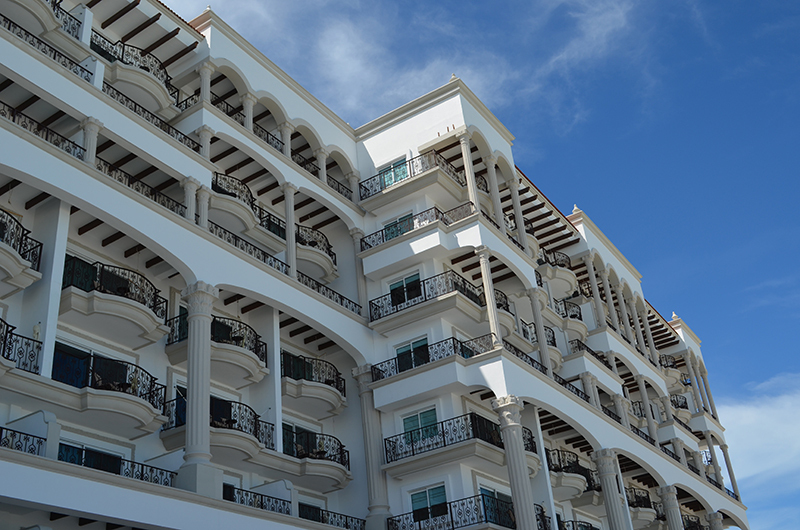 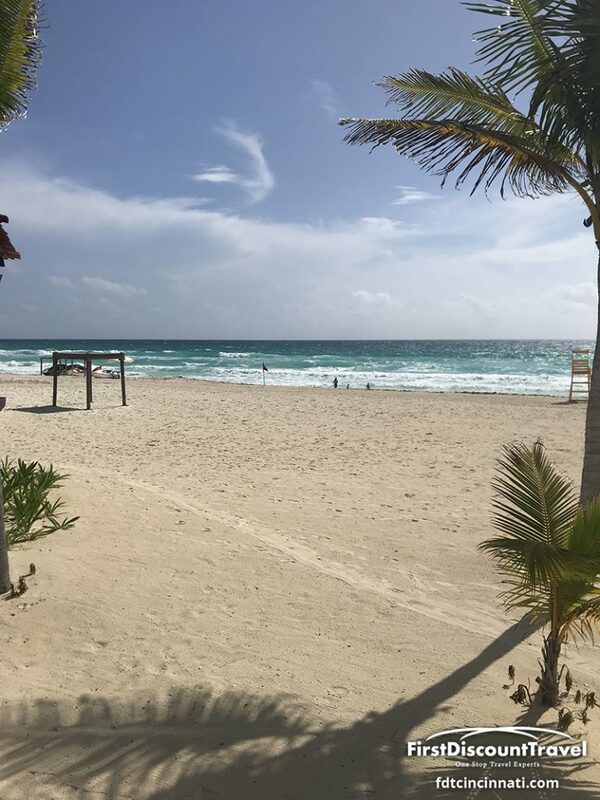 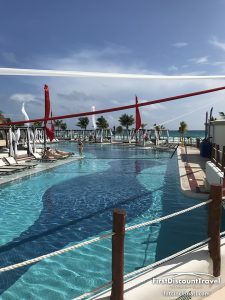 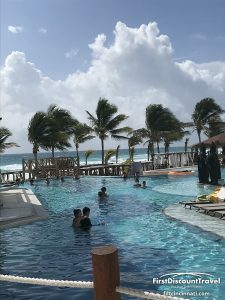 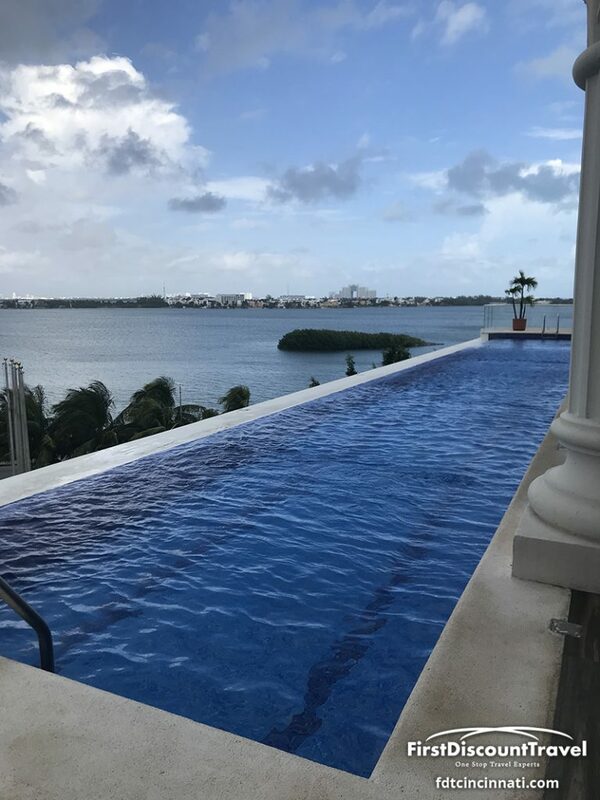 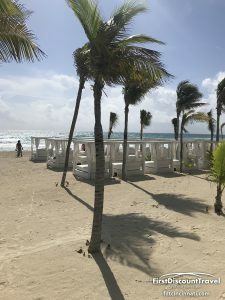 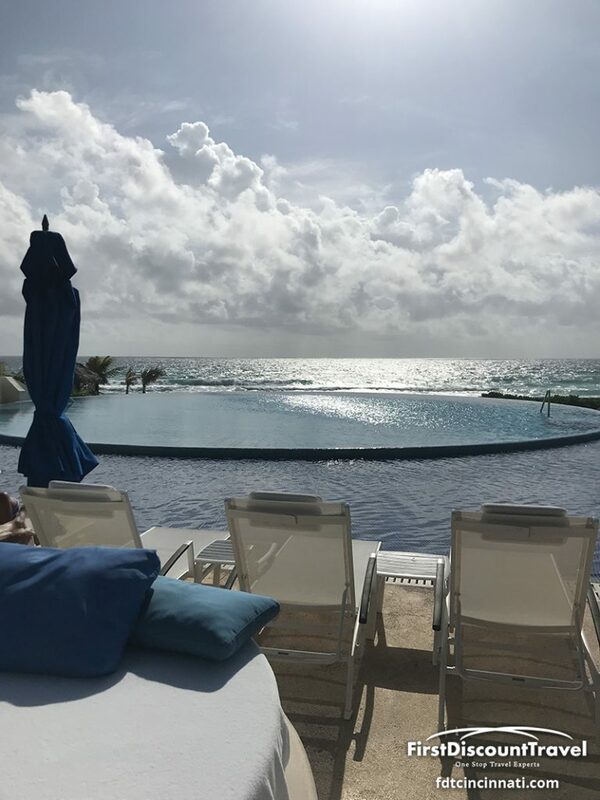 With a rich legacy of personalized service and hospitality, Real Resorts proudly presents the newest addition to its Royal brand of resorts THE Royal Cancun. 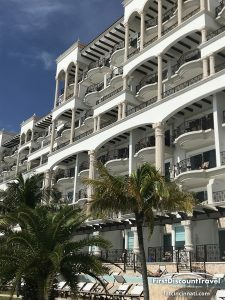 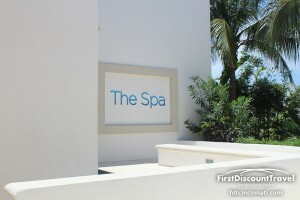 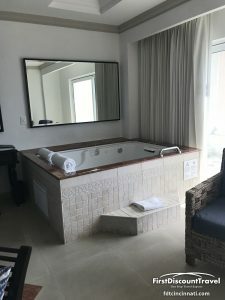 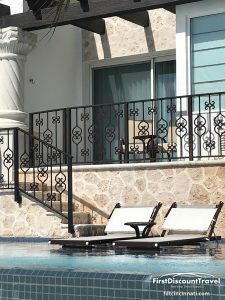 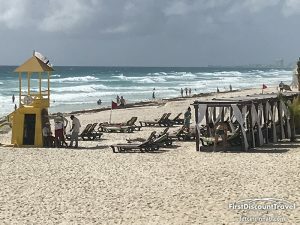 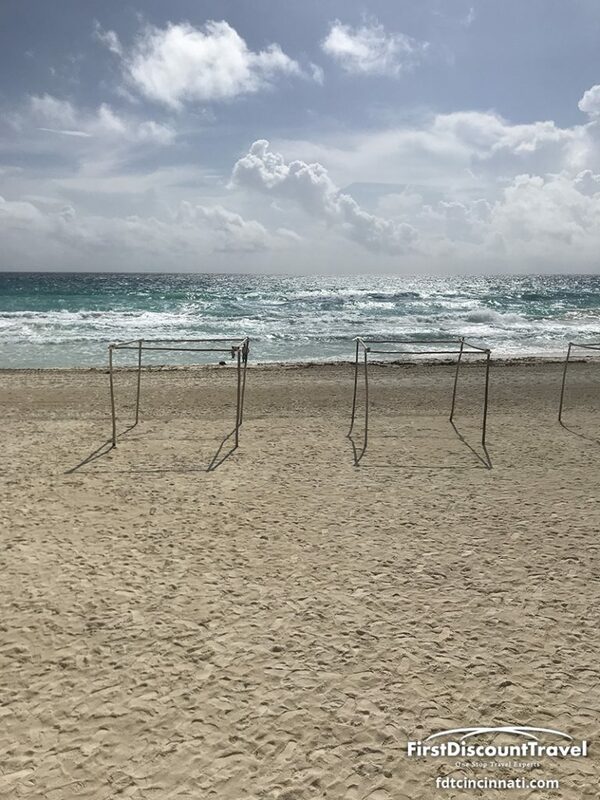 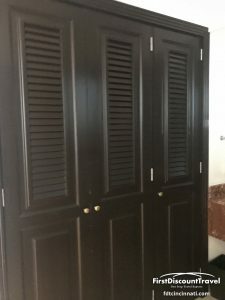 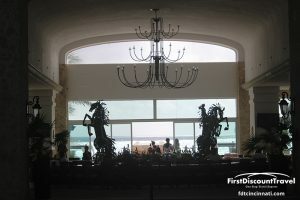 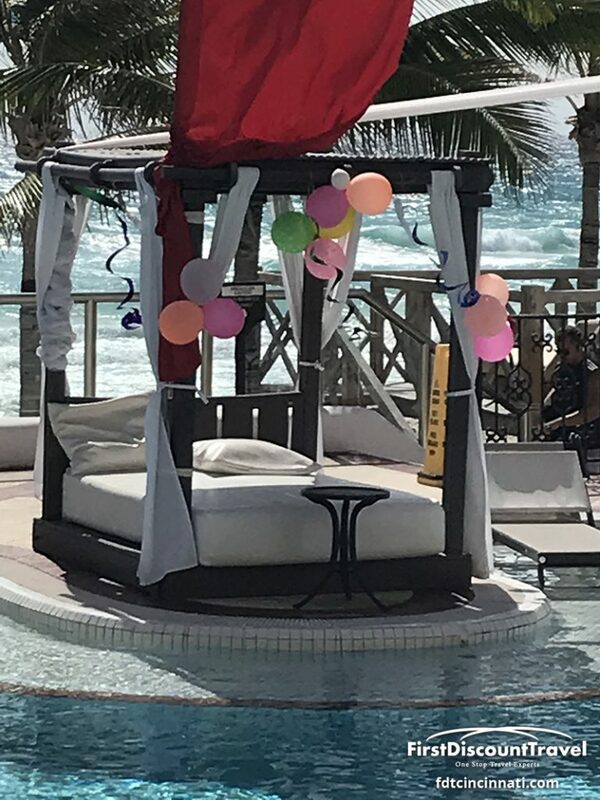 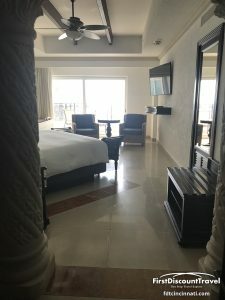 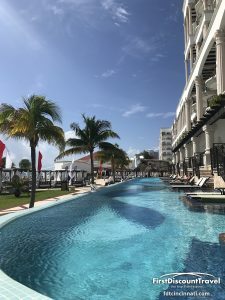 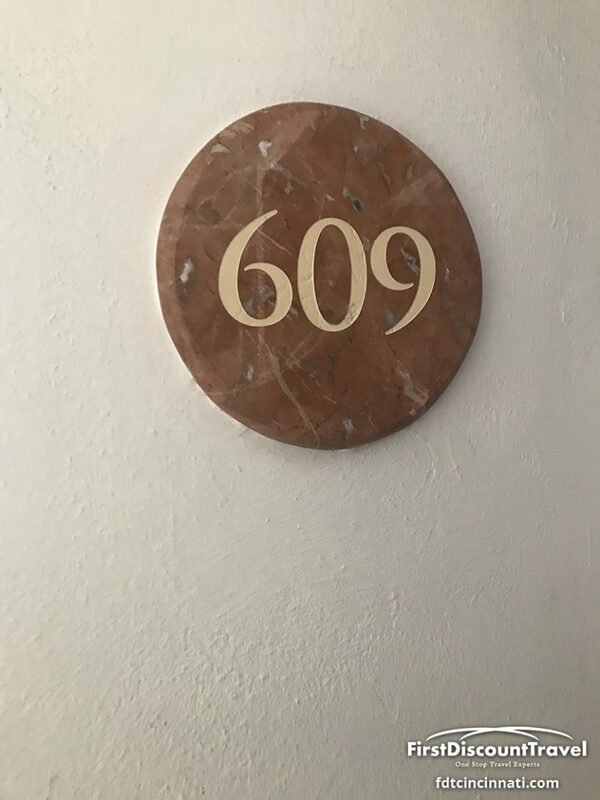 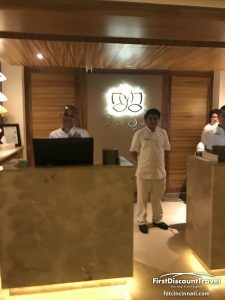 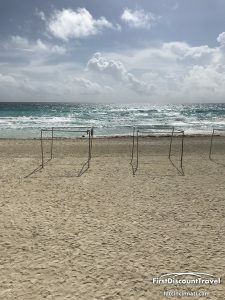 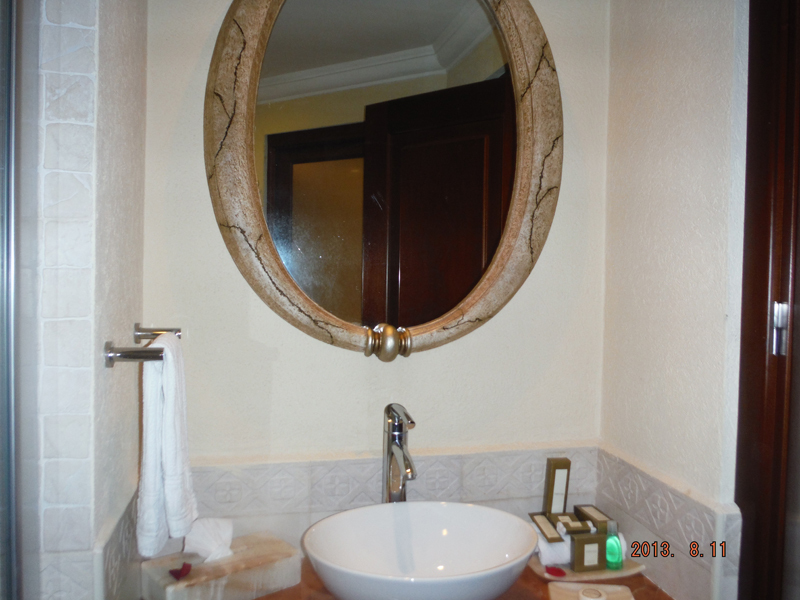 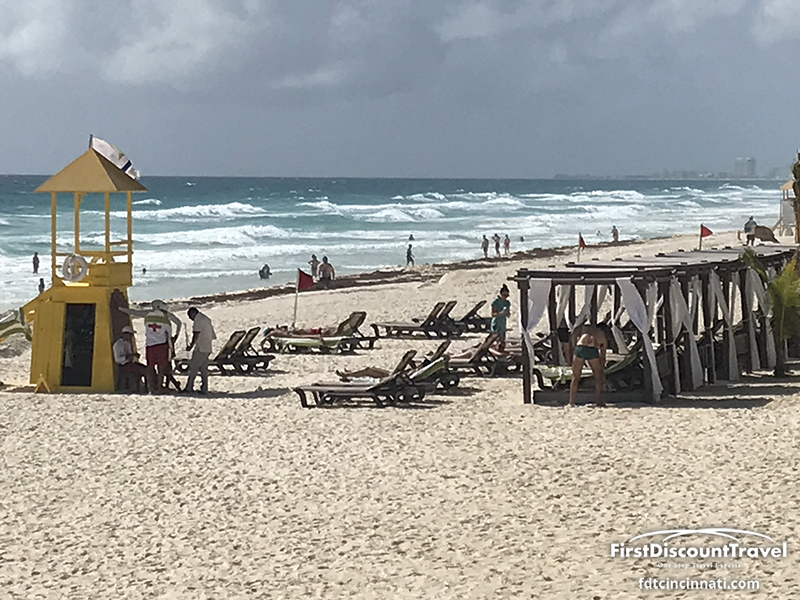 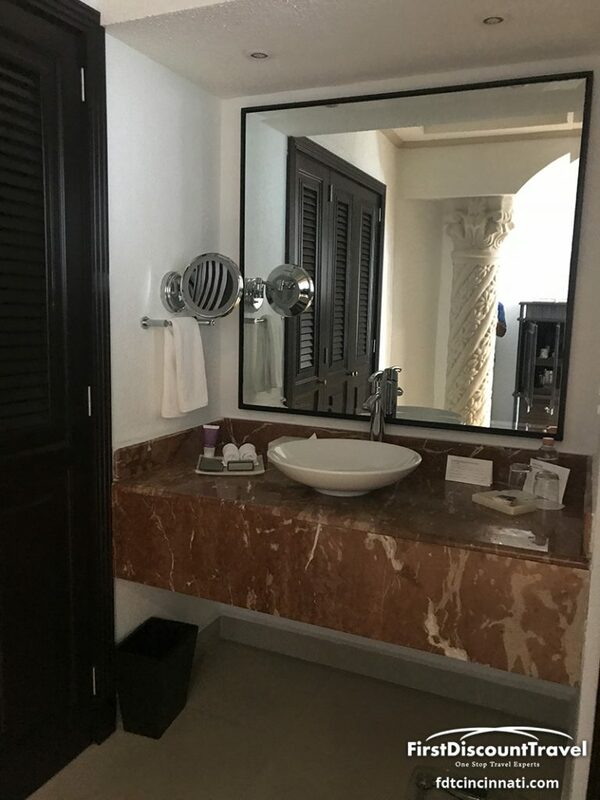 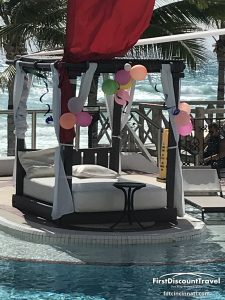 Opened in February 2007, Real’s flagship property, conveniently located next to the Gran Caribe Real in the best location in the heart of Cancun’s Hotel Zone, is a Luxurious Adults only, All-Suite, All-Inclusive resort where guests will experience a truly “Royal” escape. 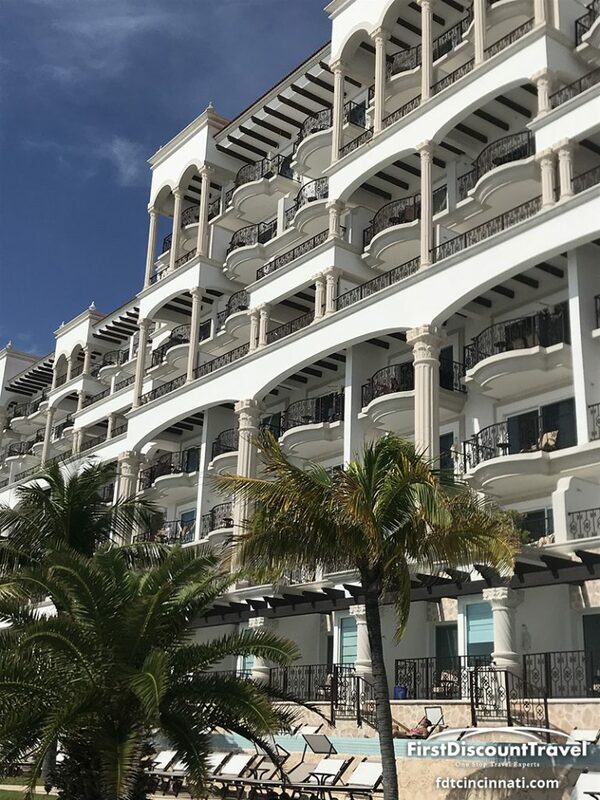 With an uncompromising commitment to luxury, THE Royal Cancun has been designed to provide a joyful ambiance of casual elegance. 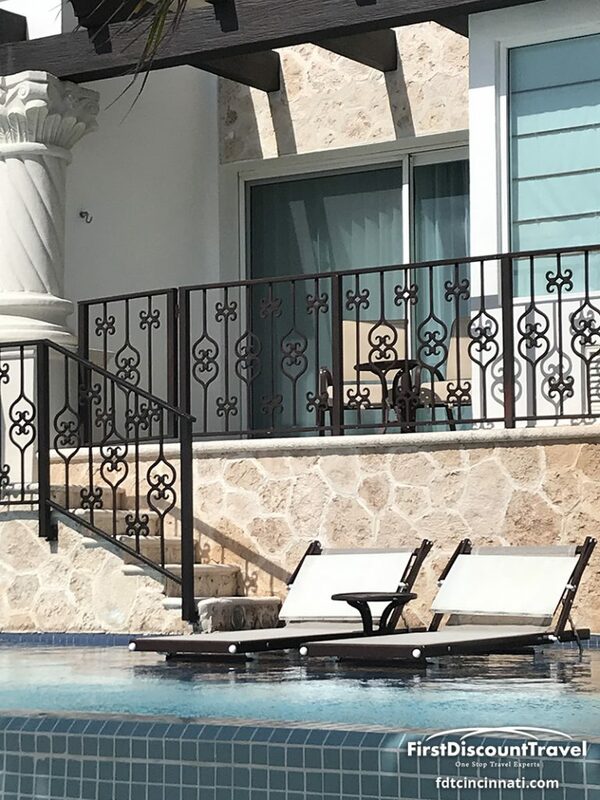 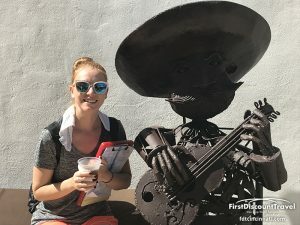 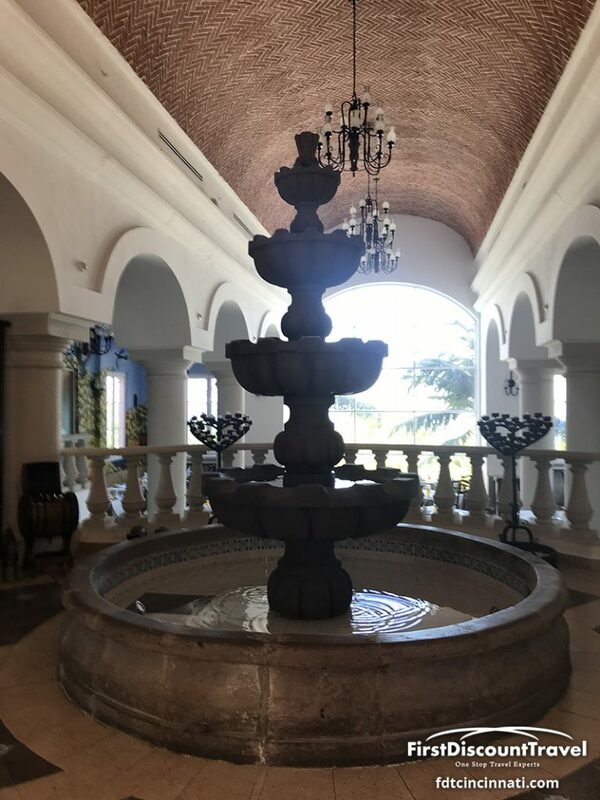 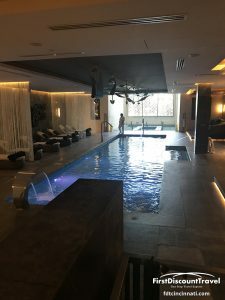 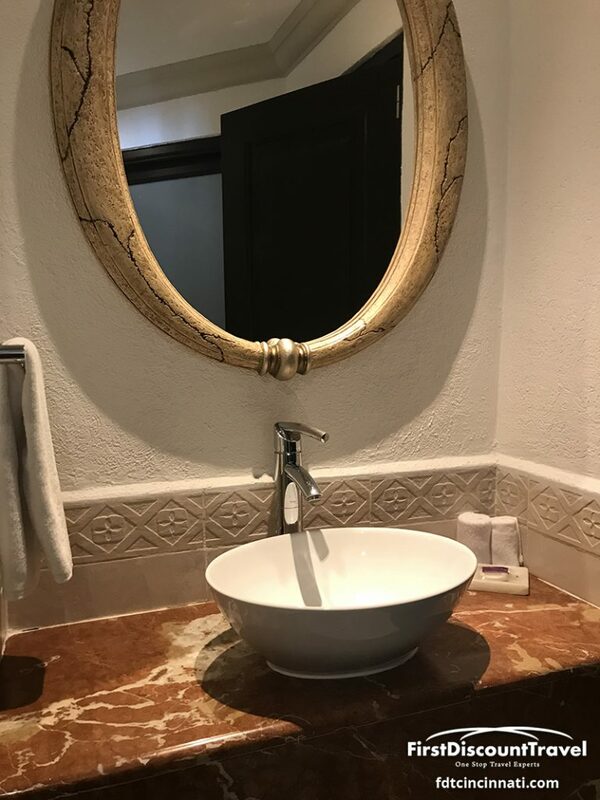 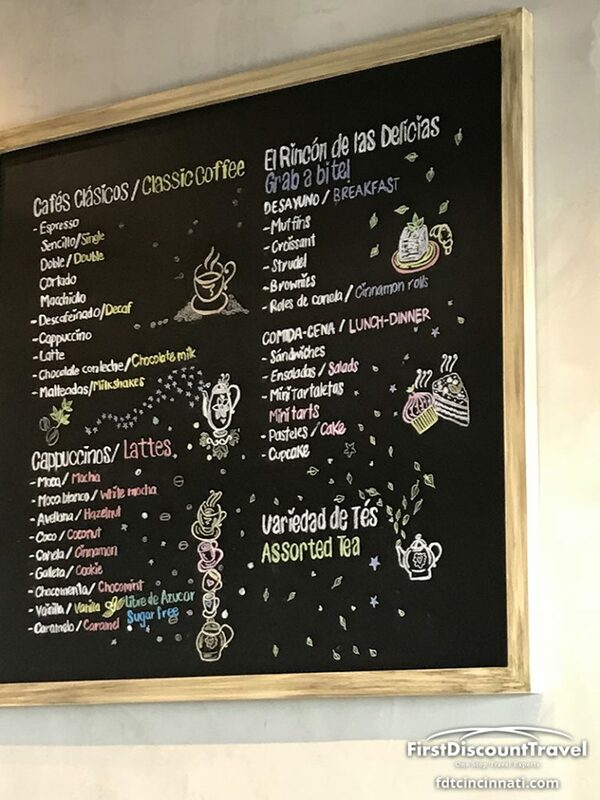 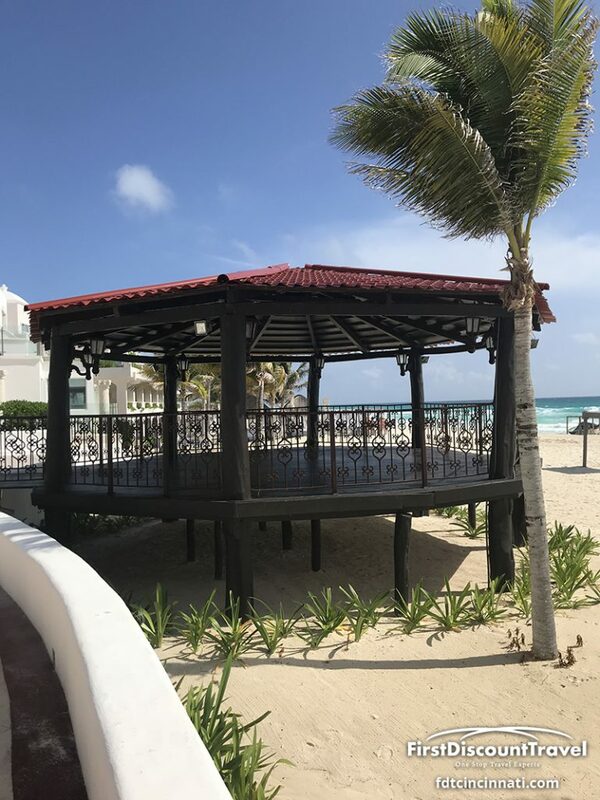 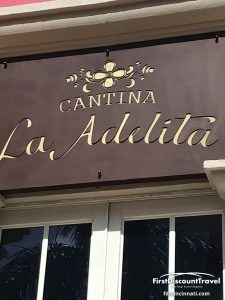 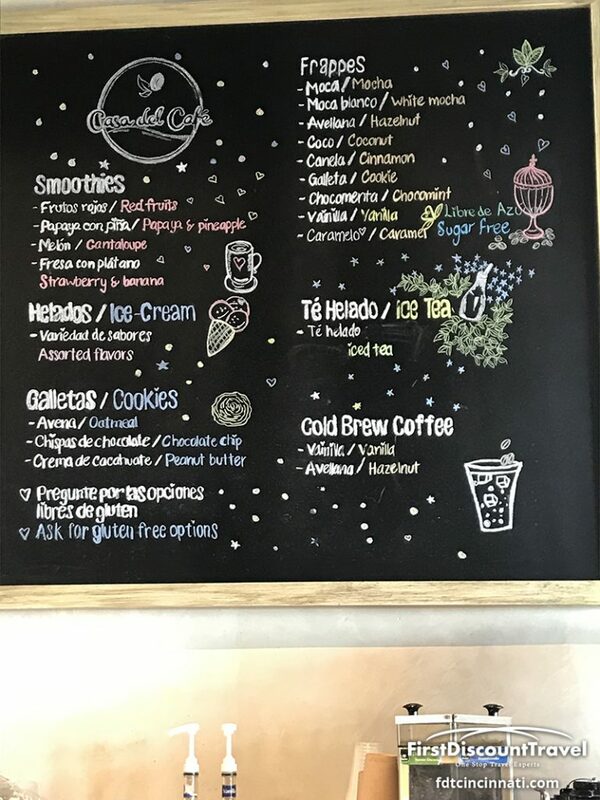 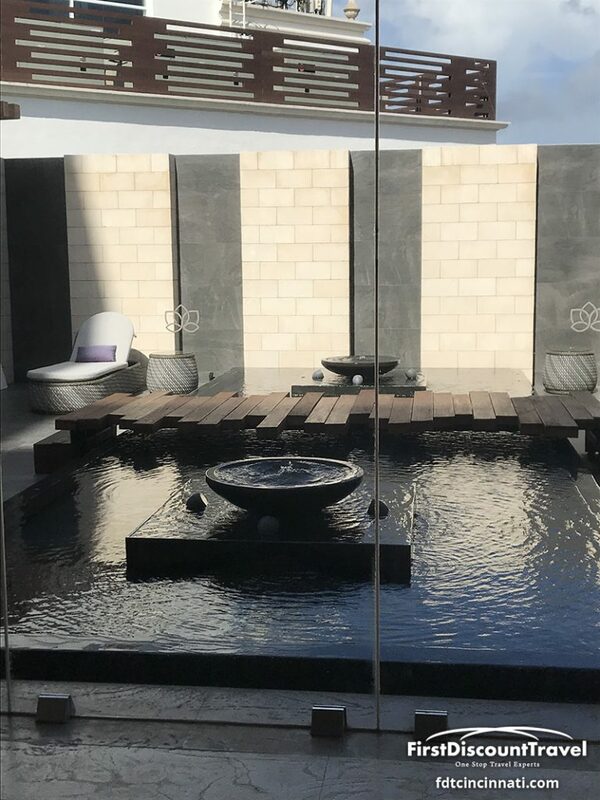 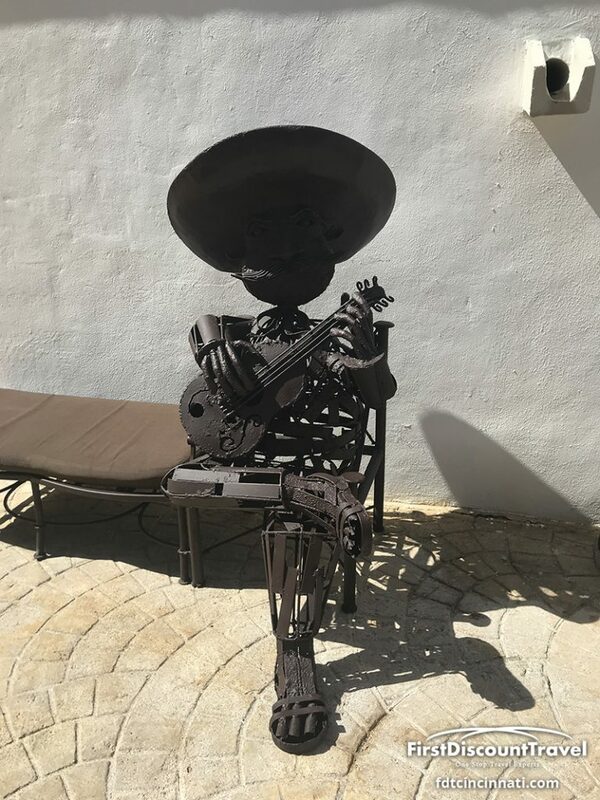 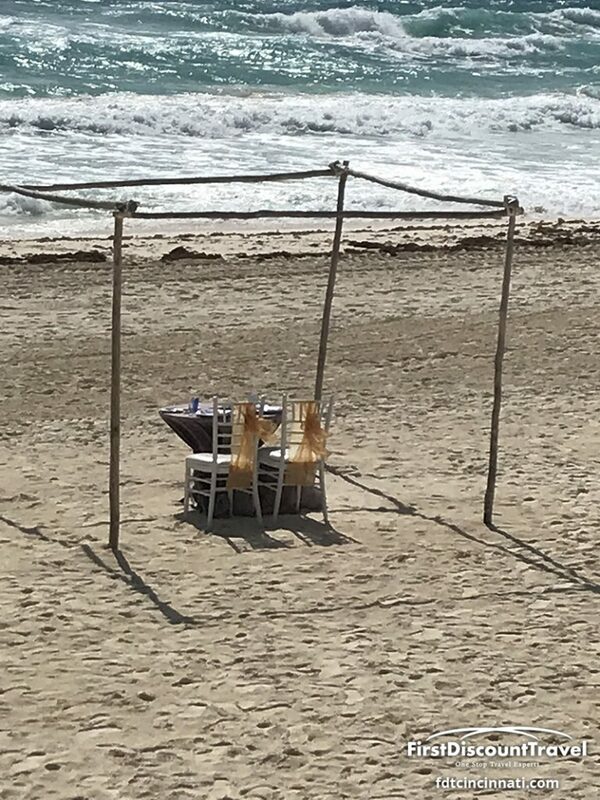 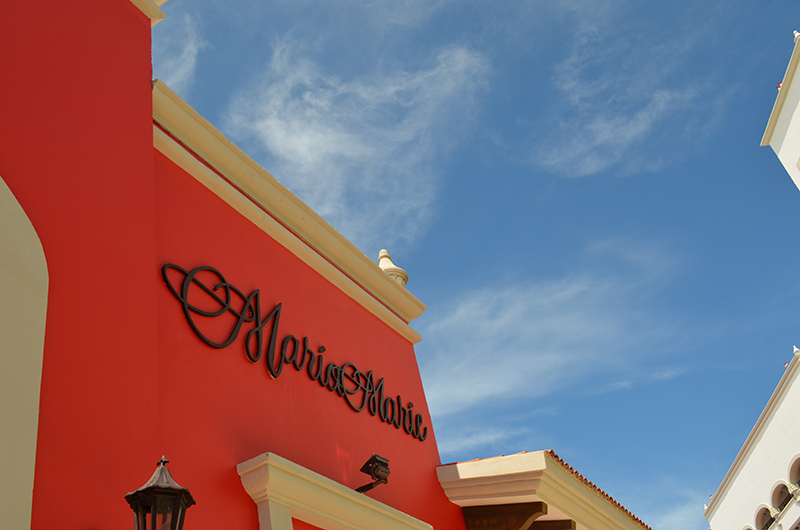 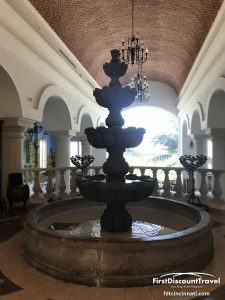 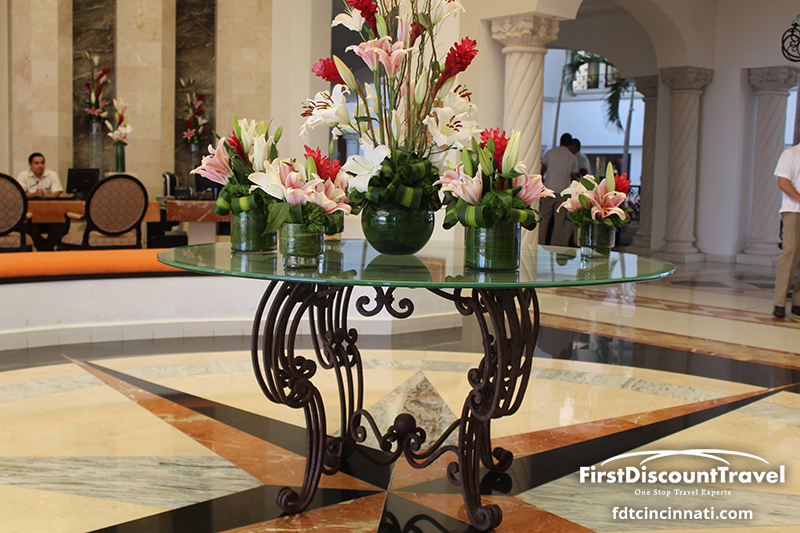 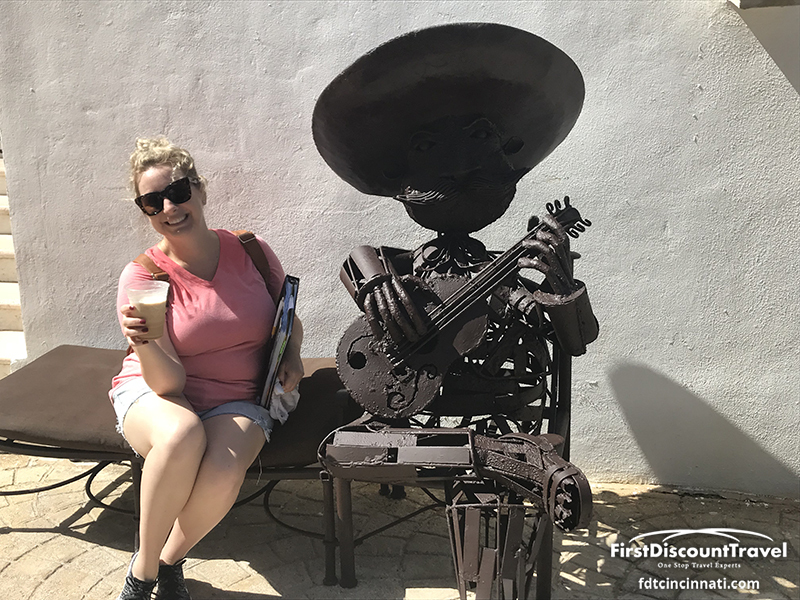 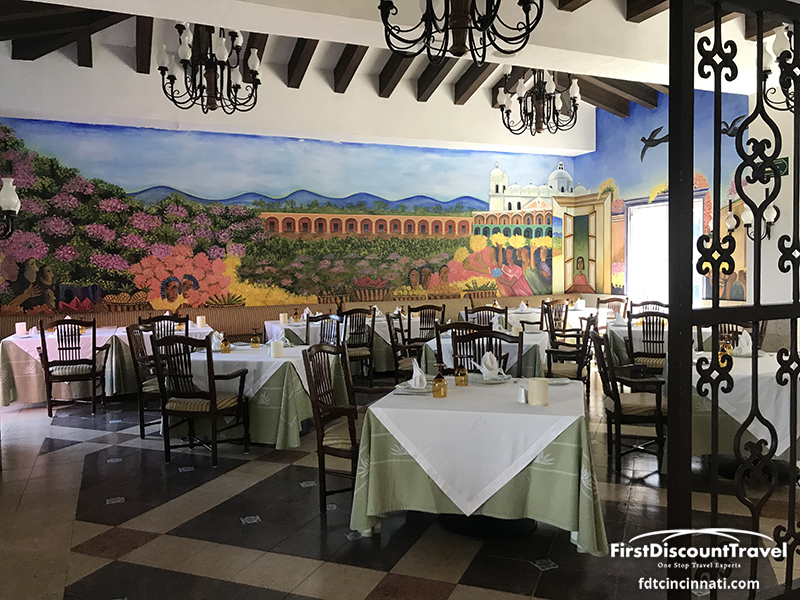 An intimate atmosphere, flawless service and traditional Mexican warmth and hospitality live up to Real Resorts’ guiding principle of “Exceeding Your Expectations”. 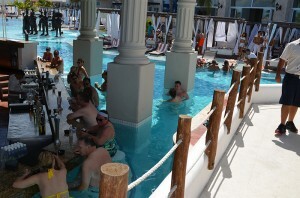 This adults-only resort opened in February 2007. 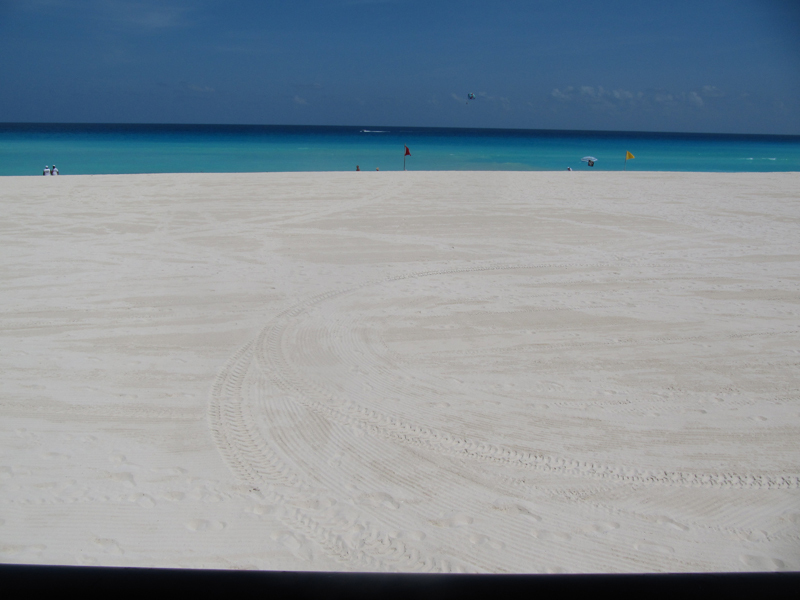 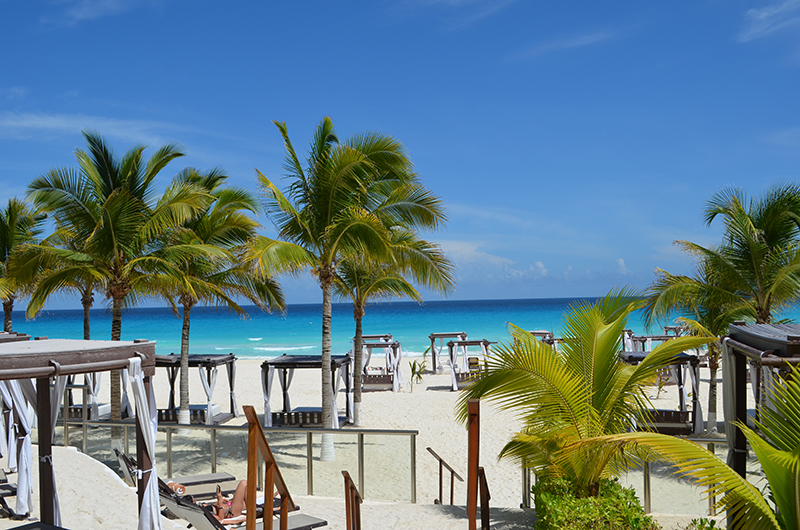 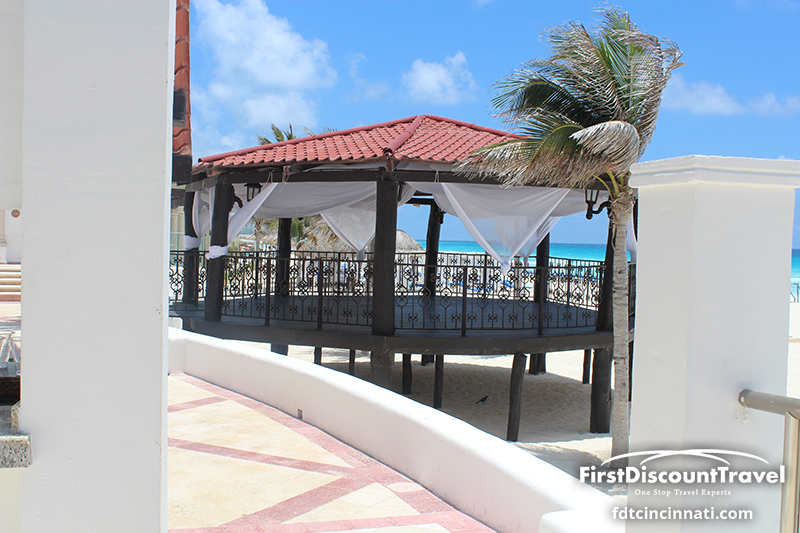 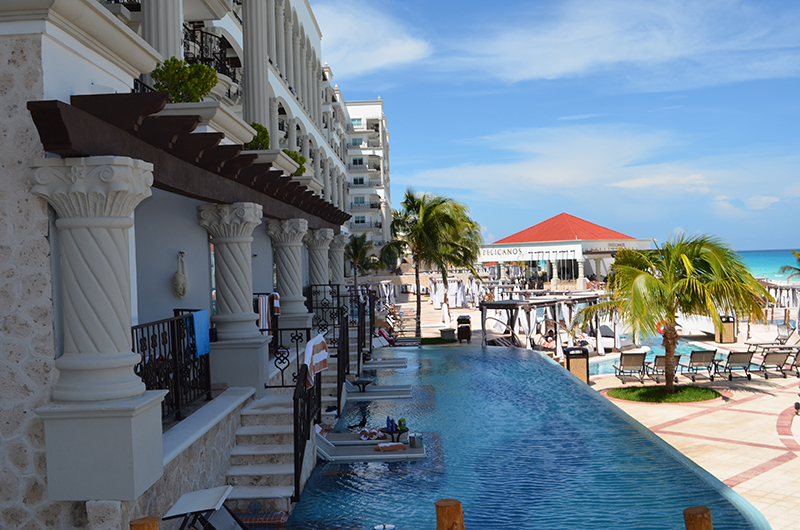 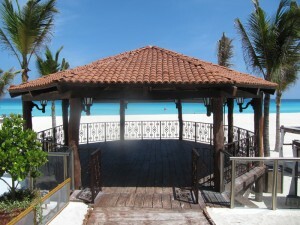 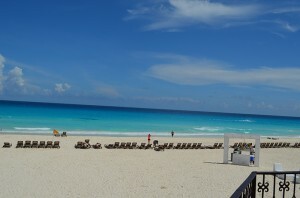 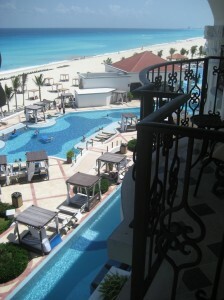 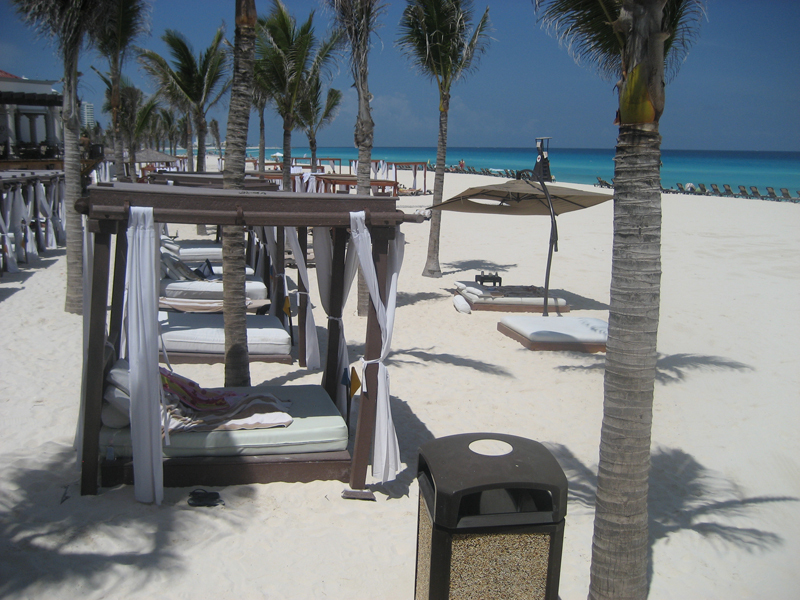 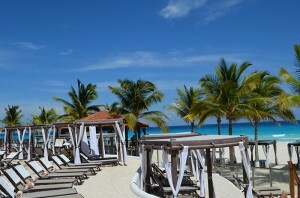 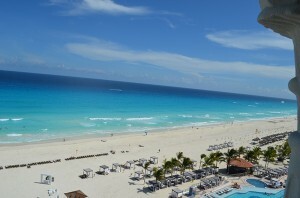 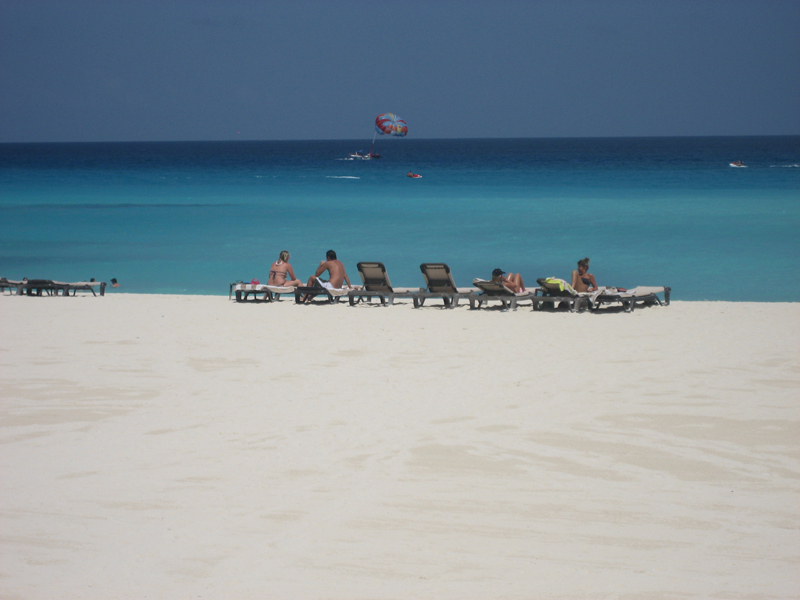 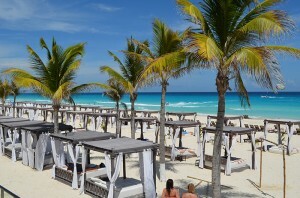 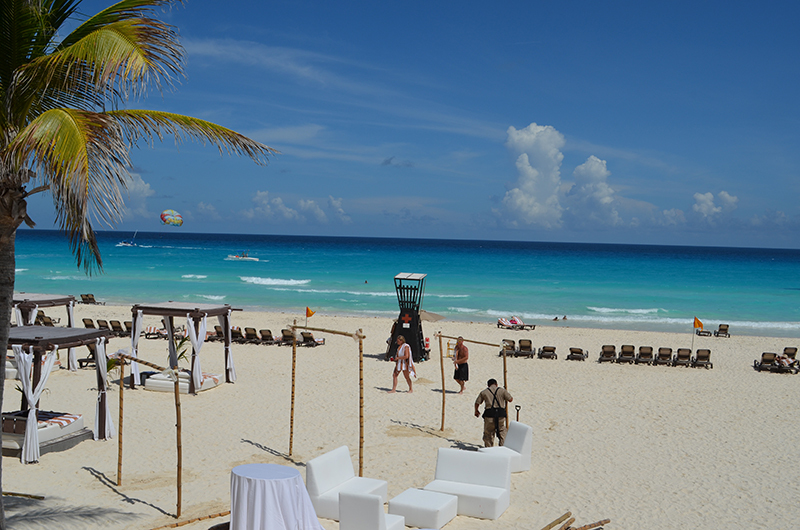 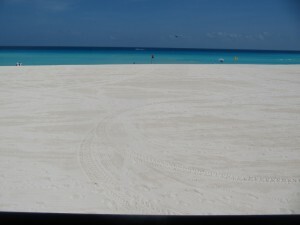 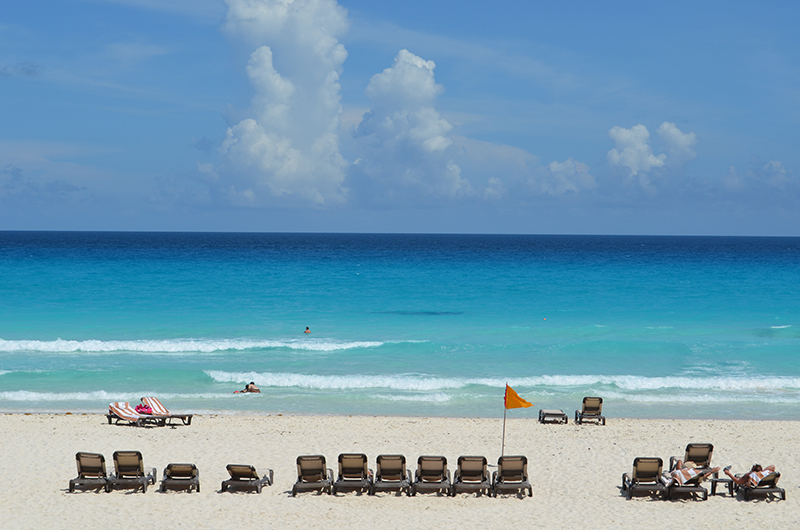 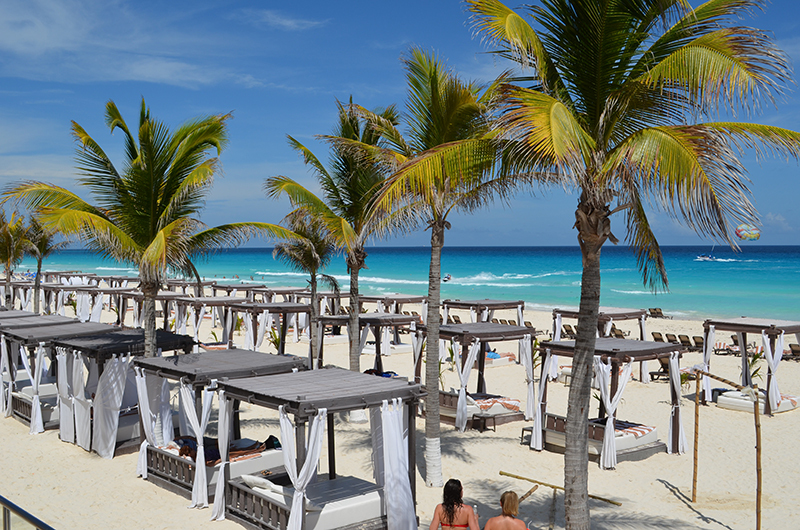 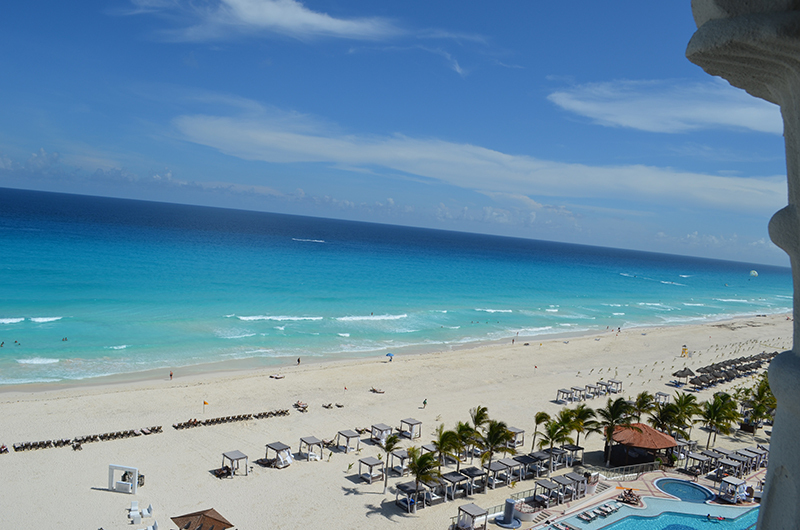 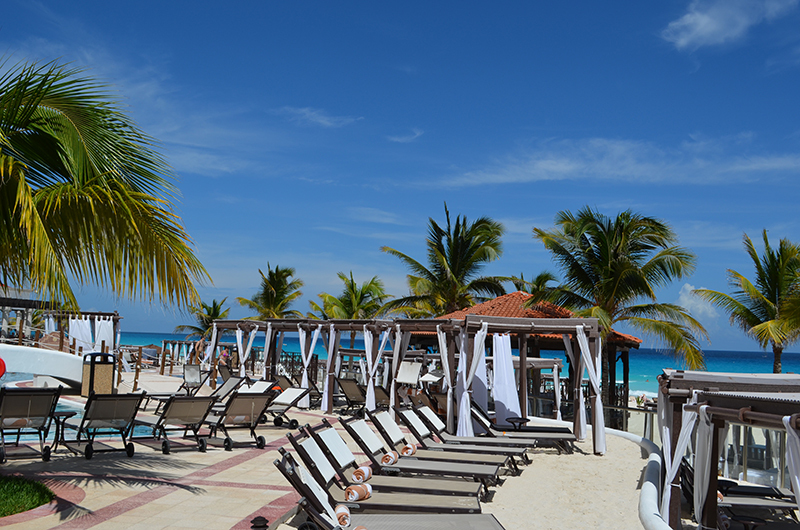 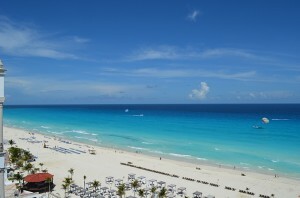 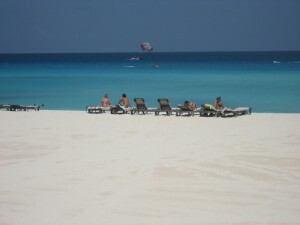 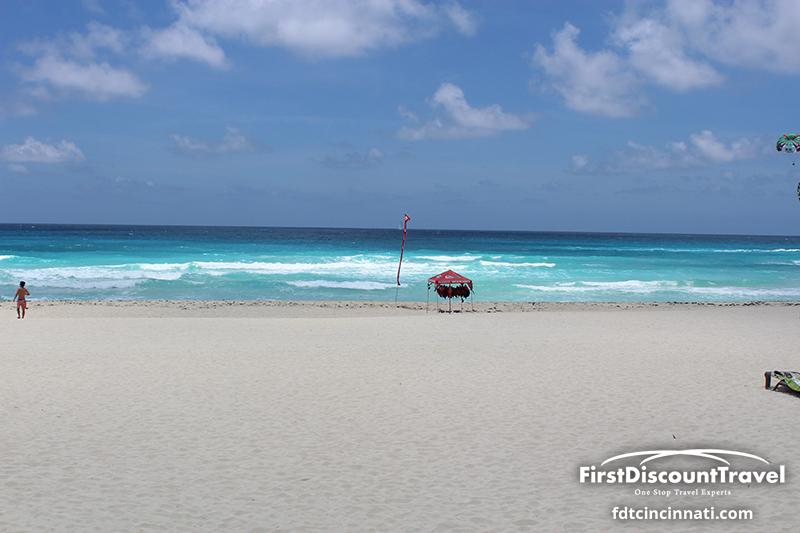 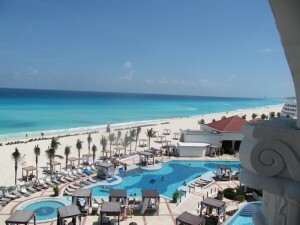 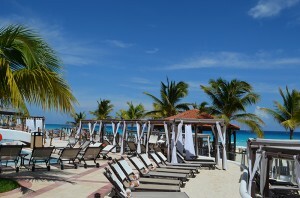 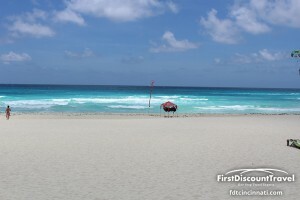 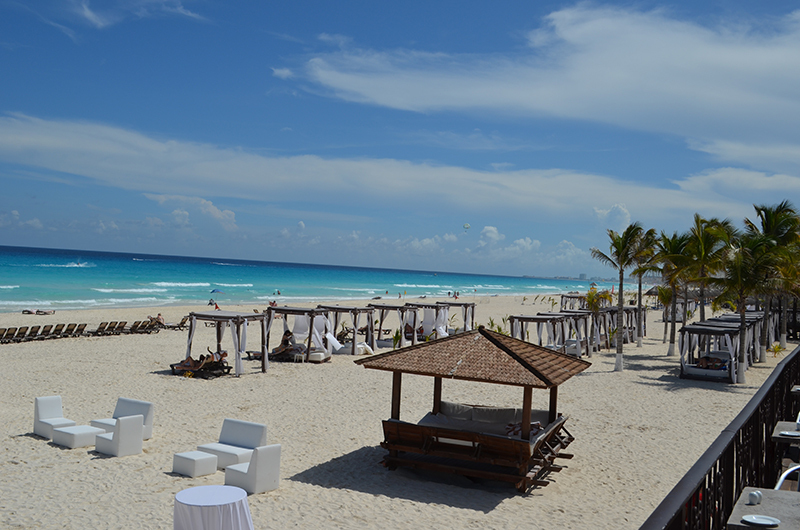 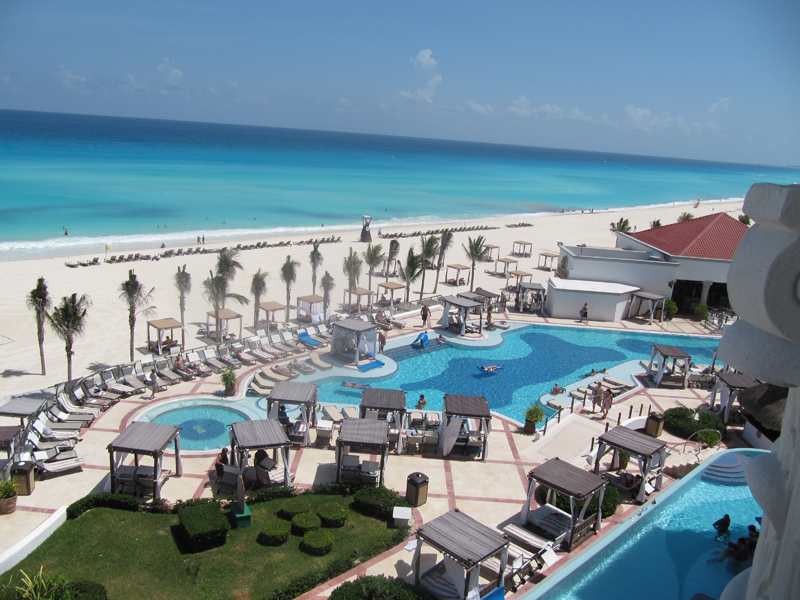 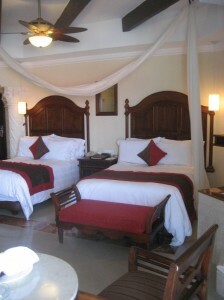 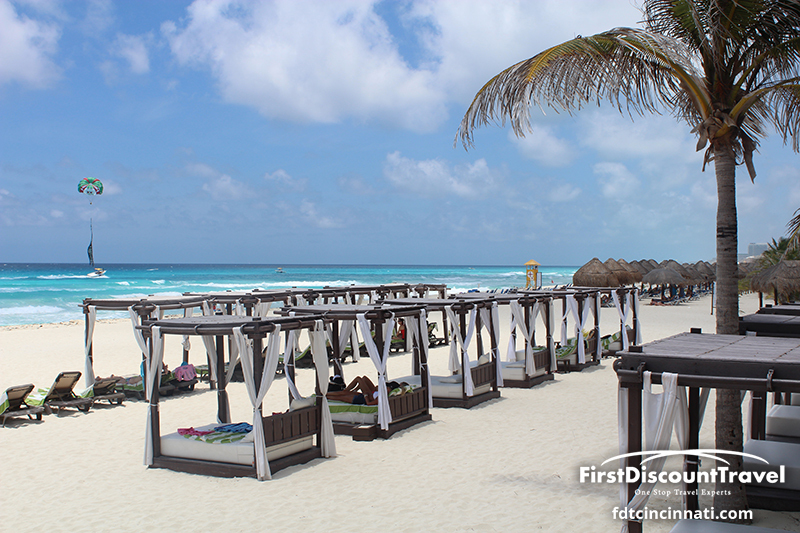 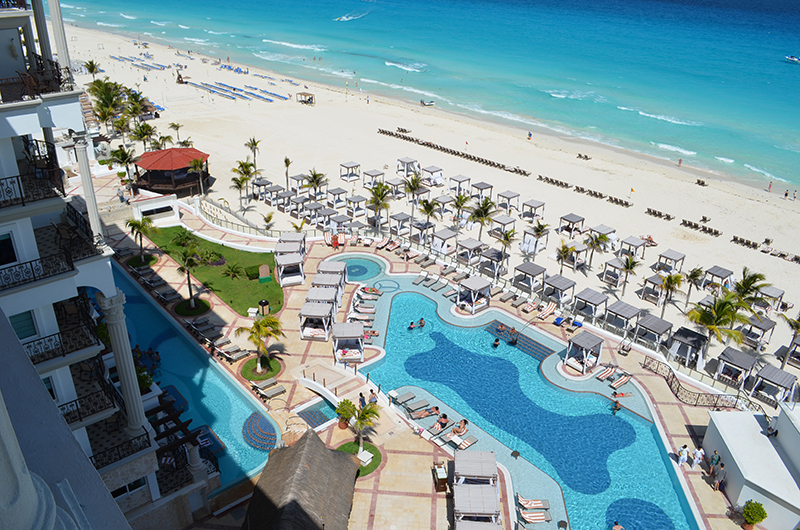 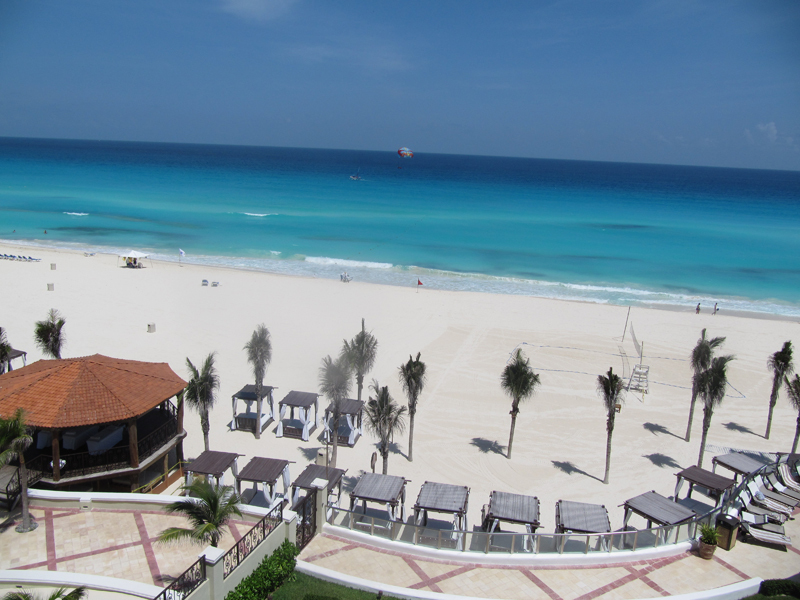 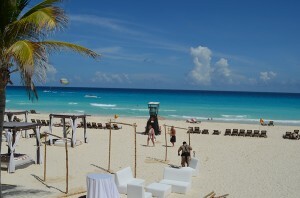 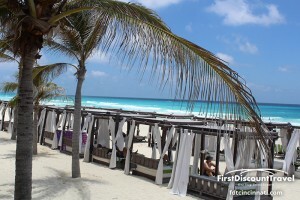 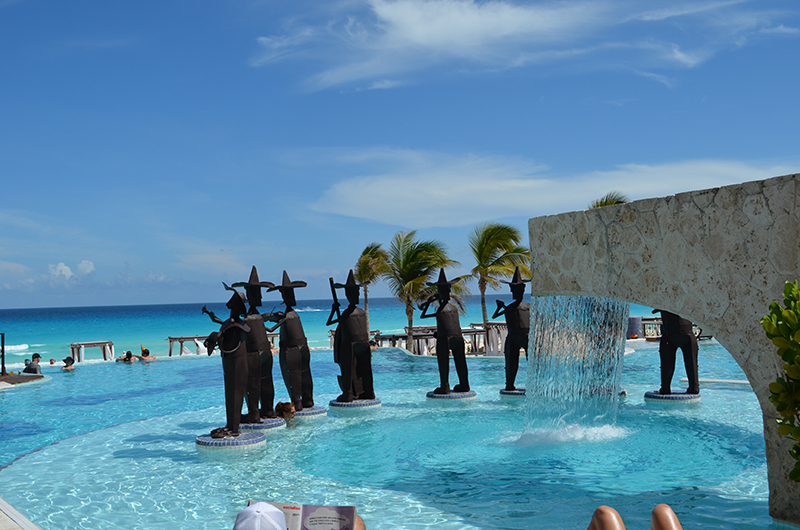 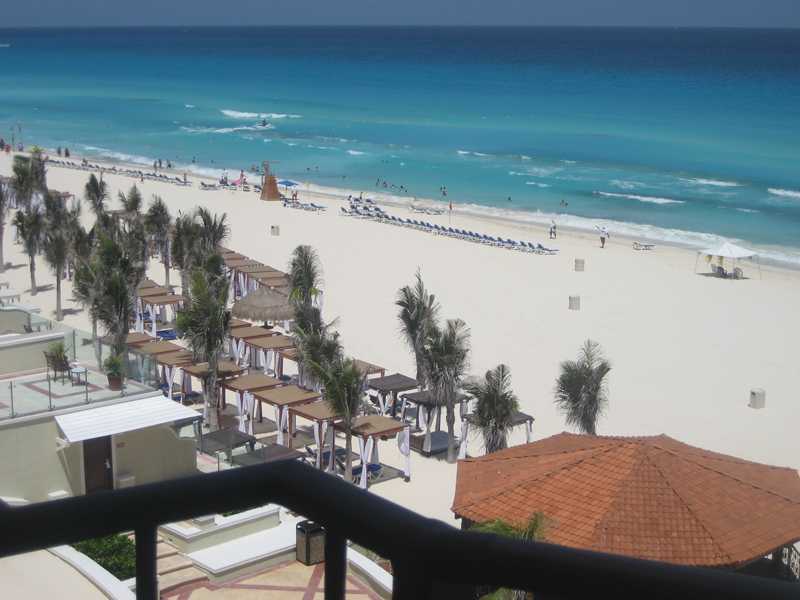 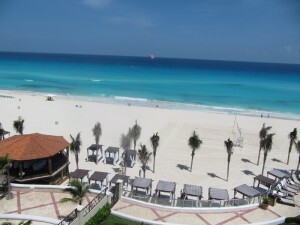 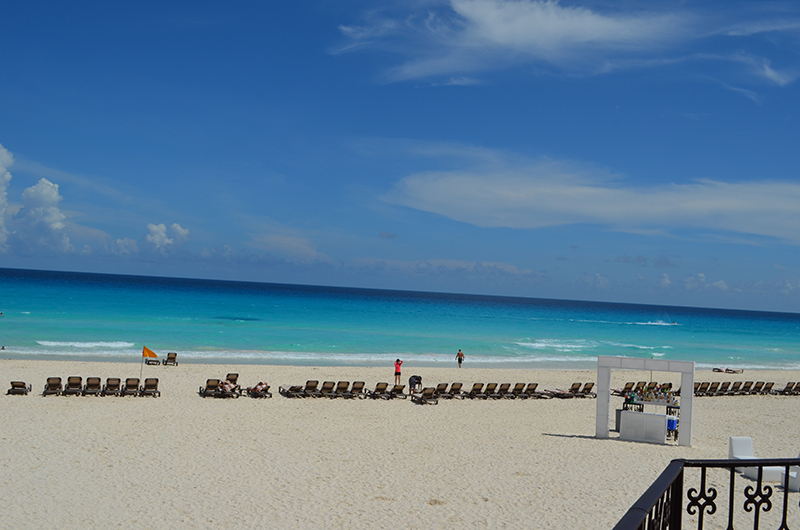 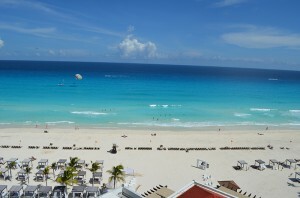 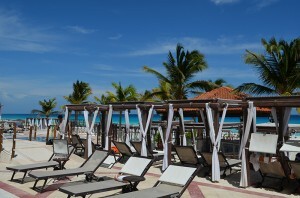 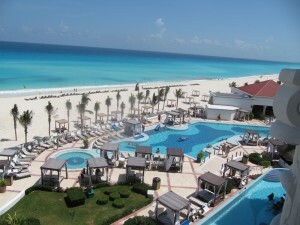 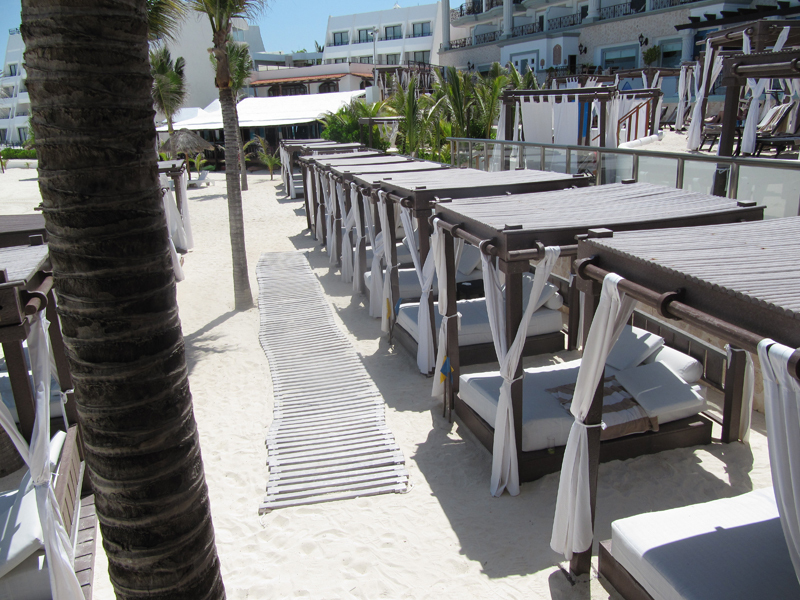 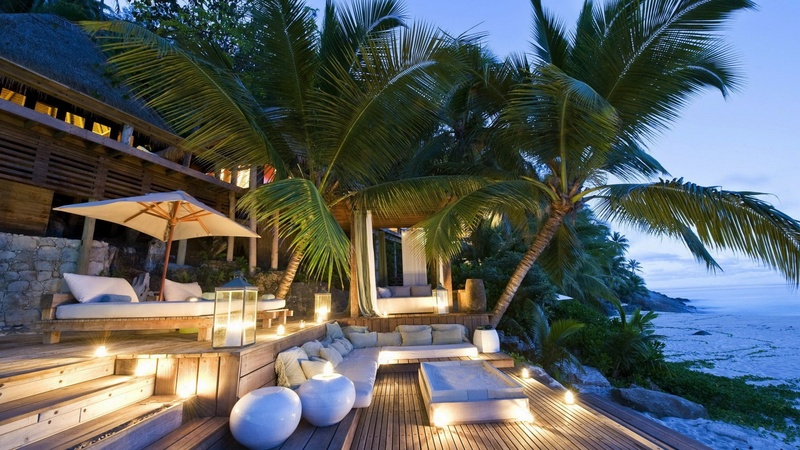 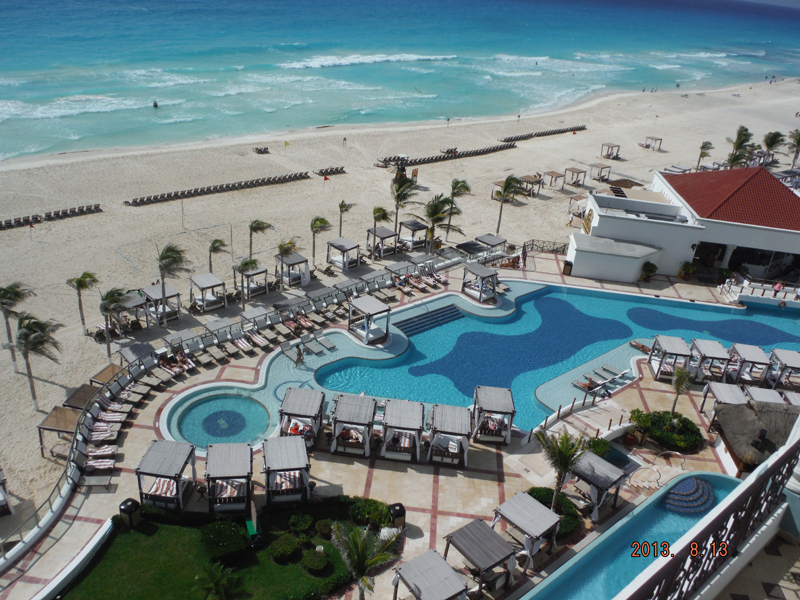 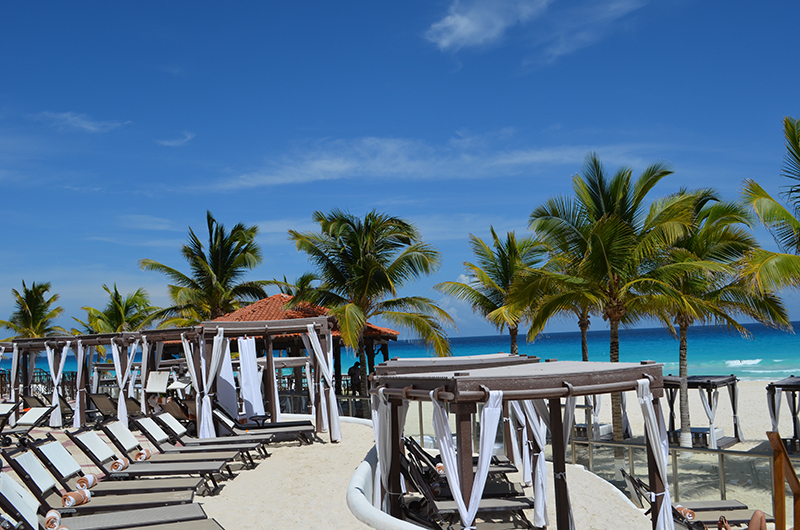 The Royal has a fantastic restored beach with thick spaces of white sand and turquoise water. 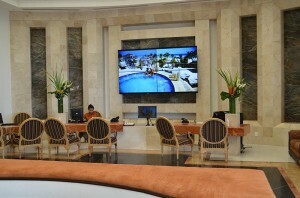 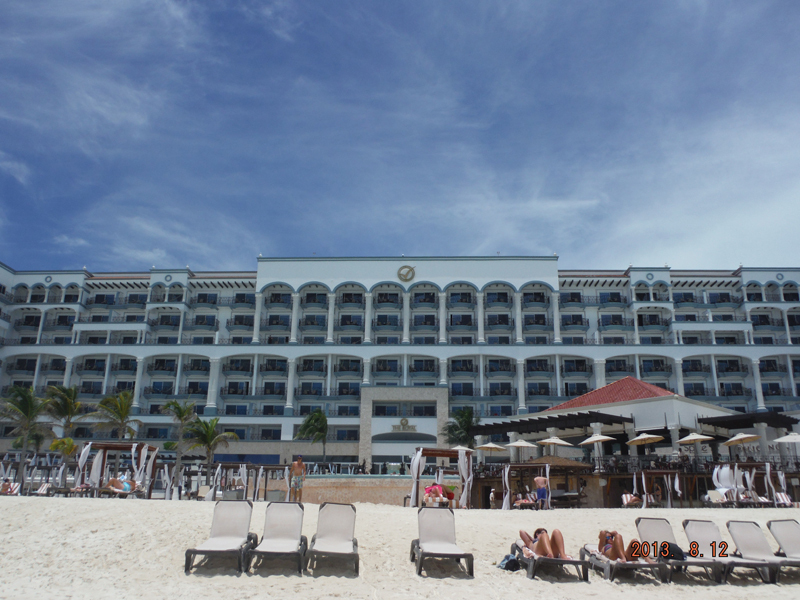 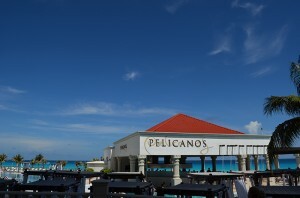 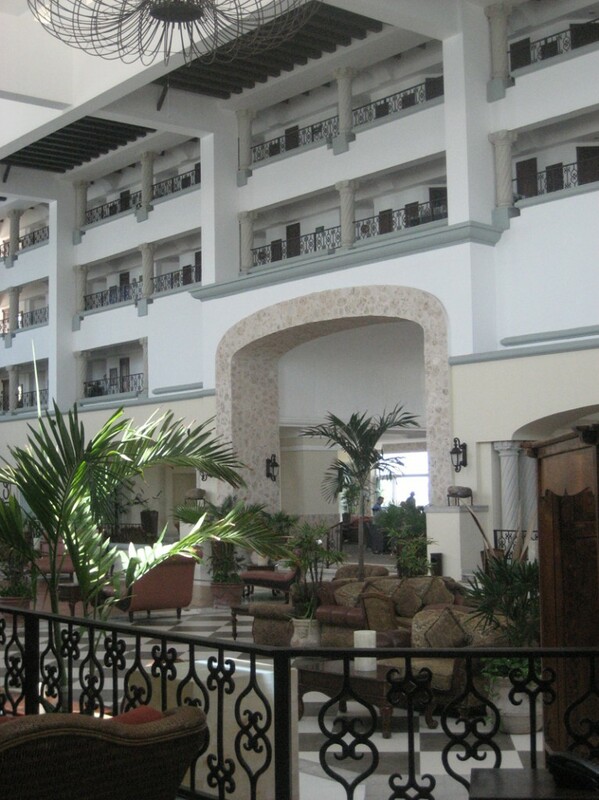 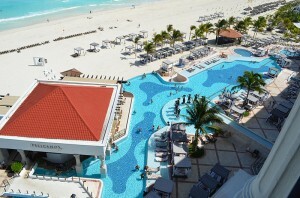 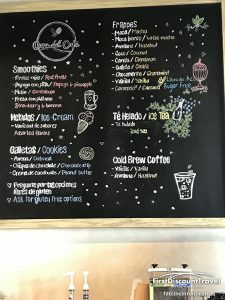 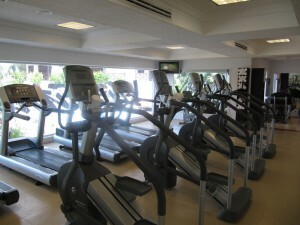 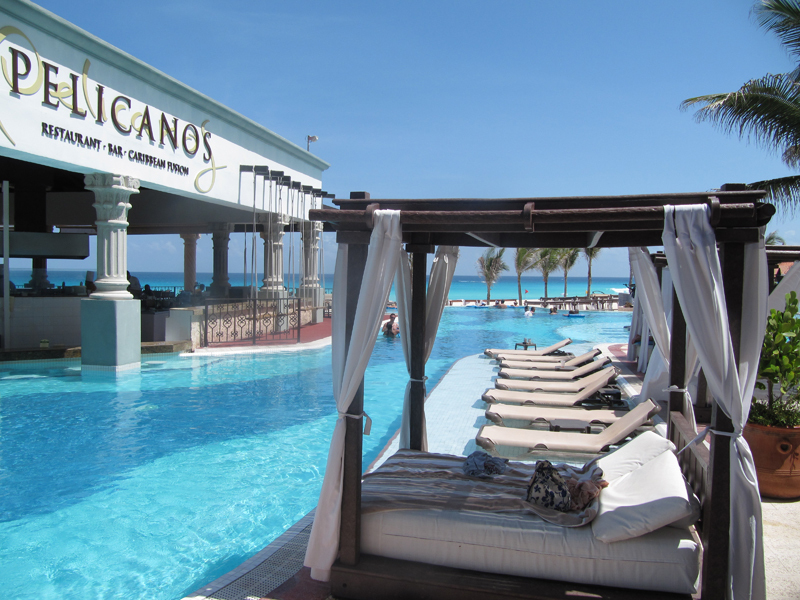 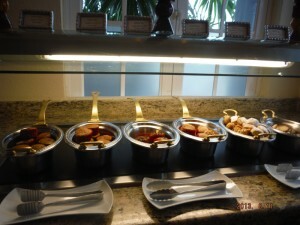 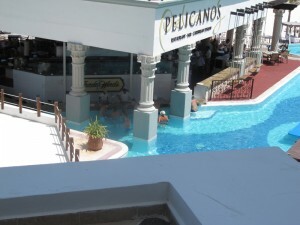 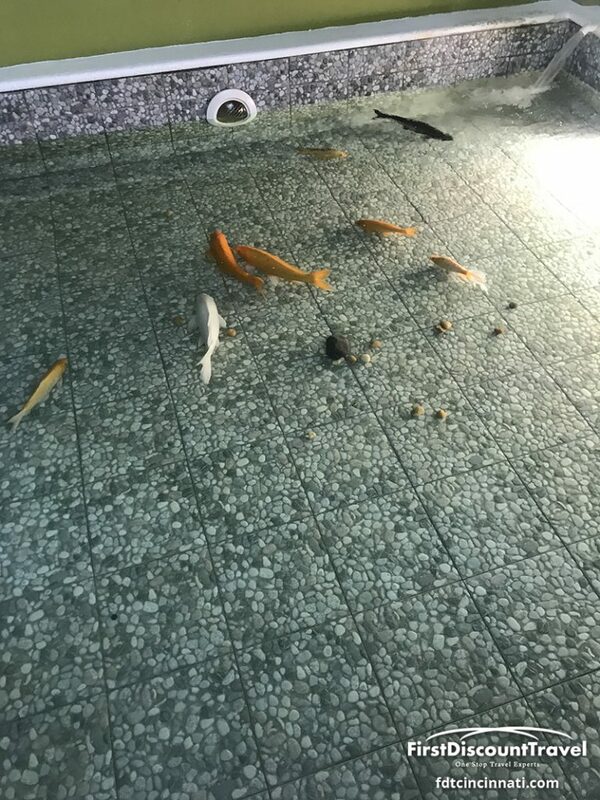 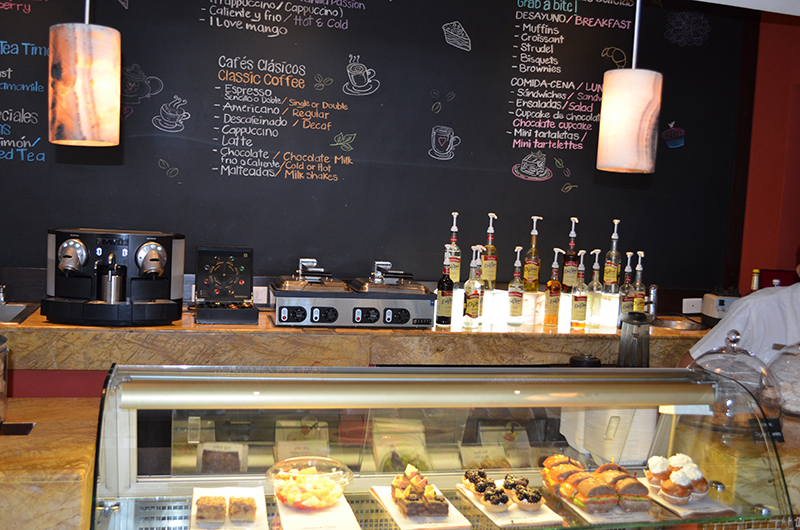 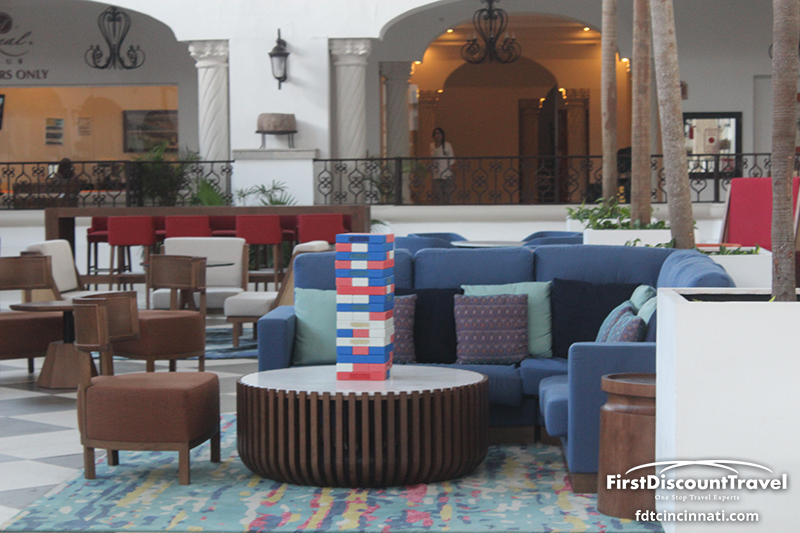 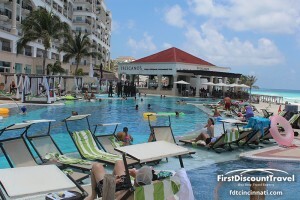 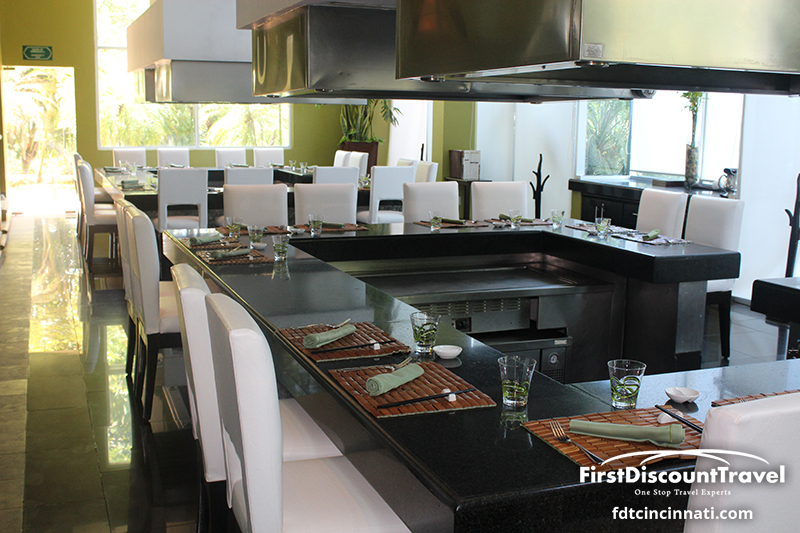 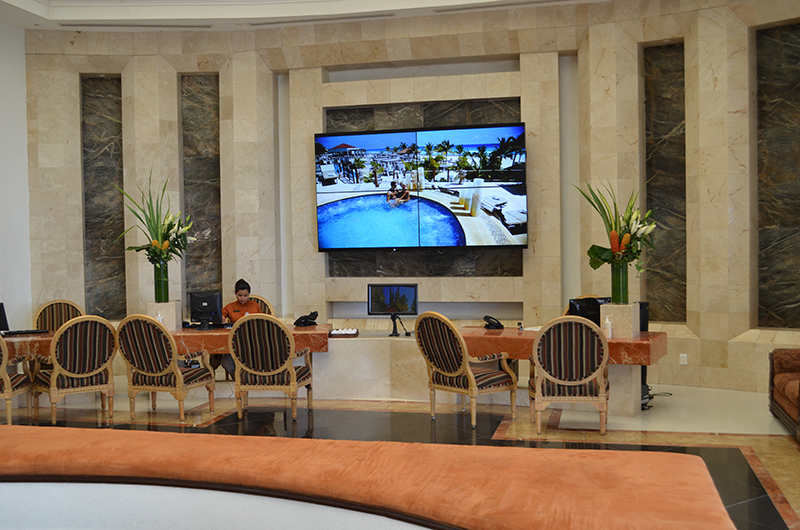 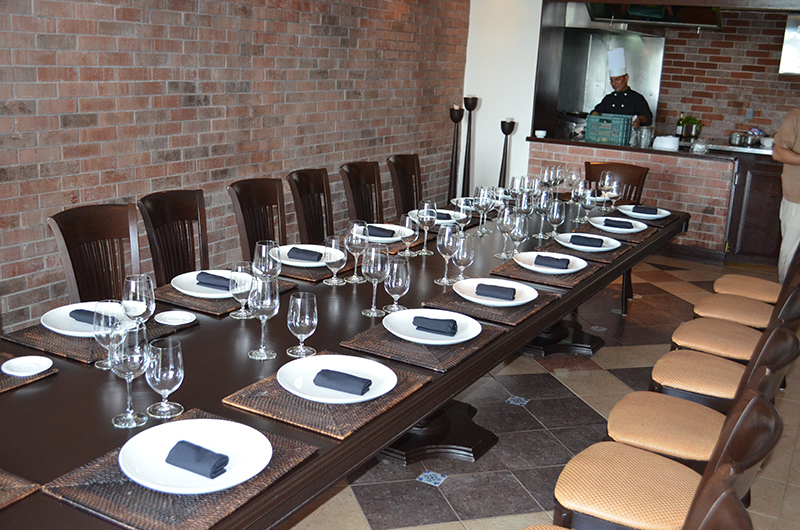 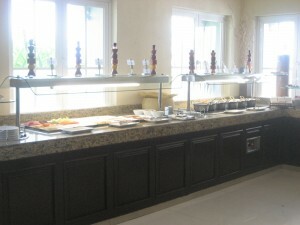 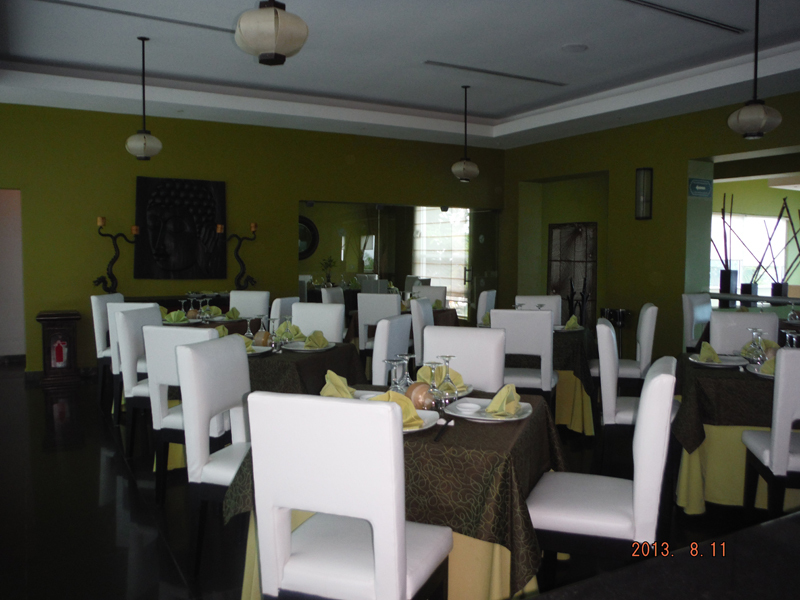 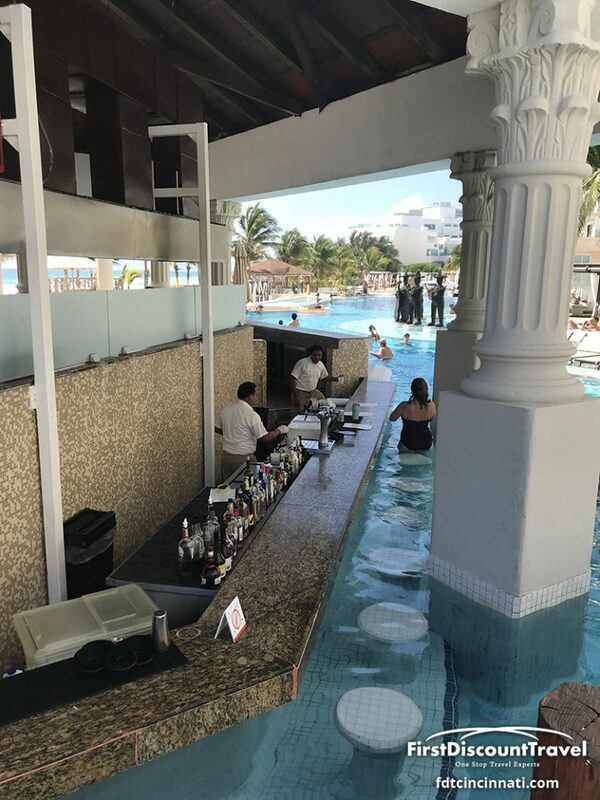 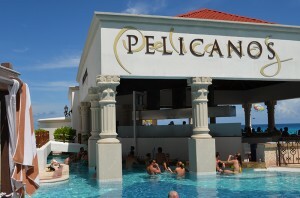 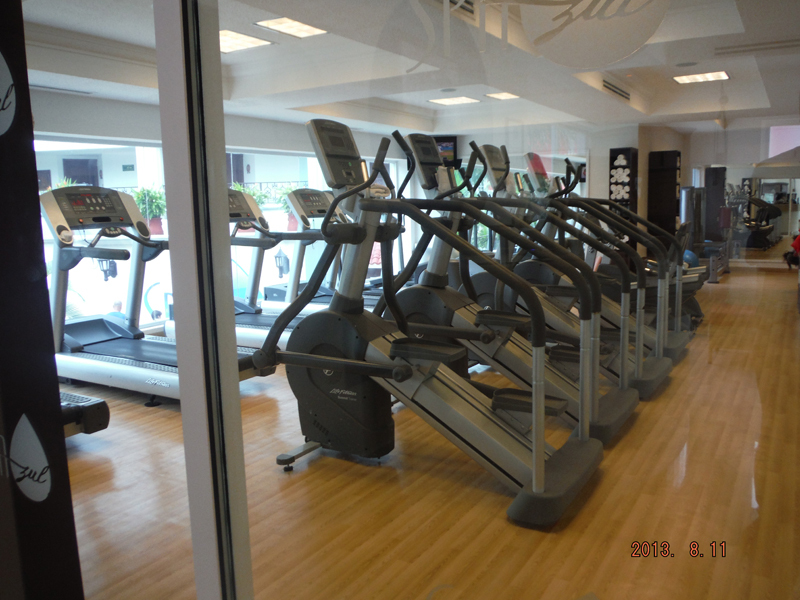 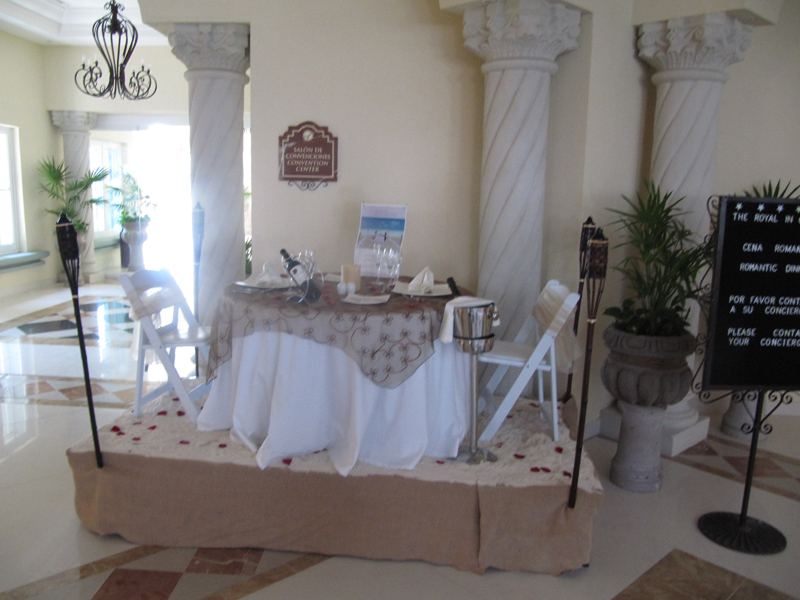 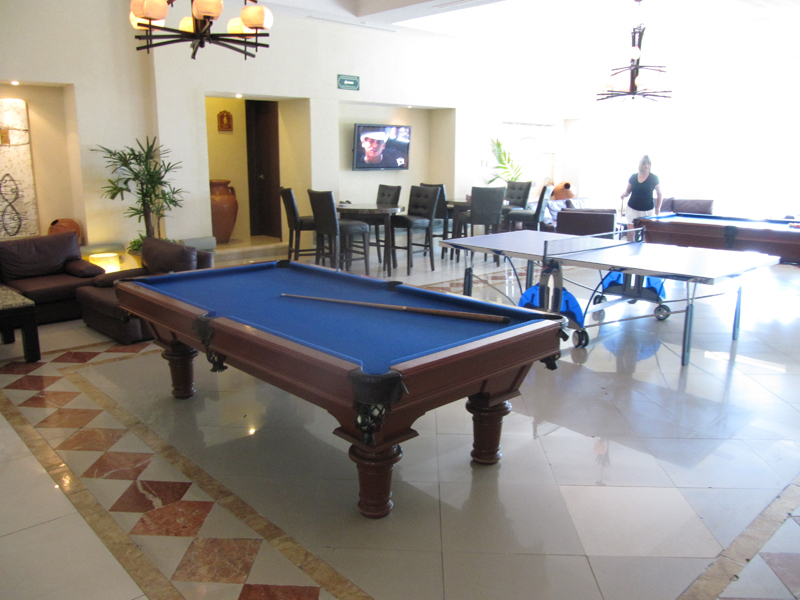 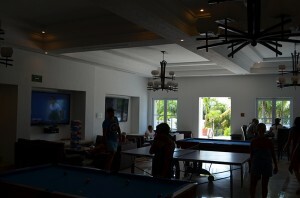 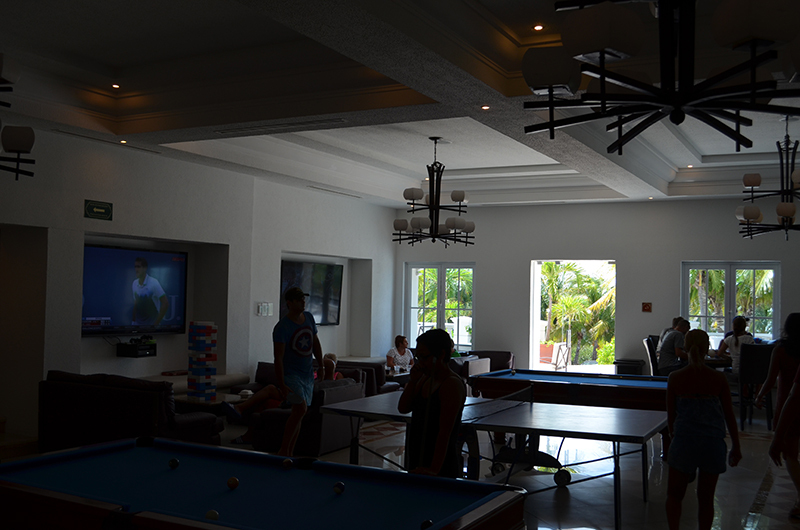 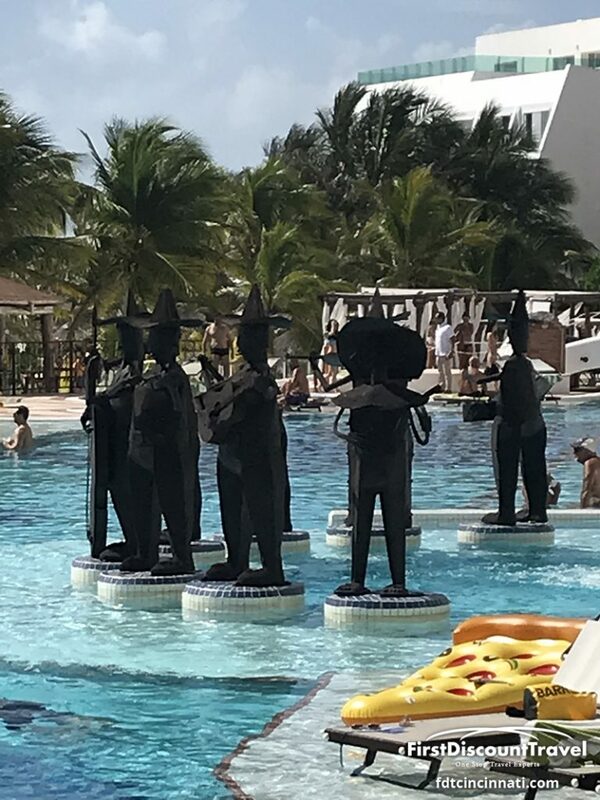 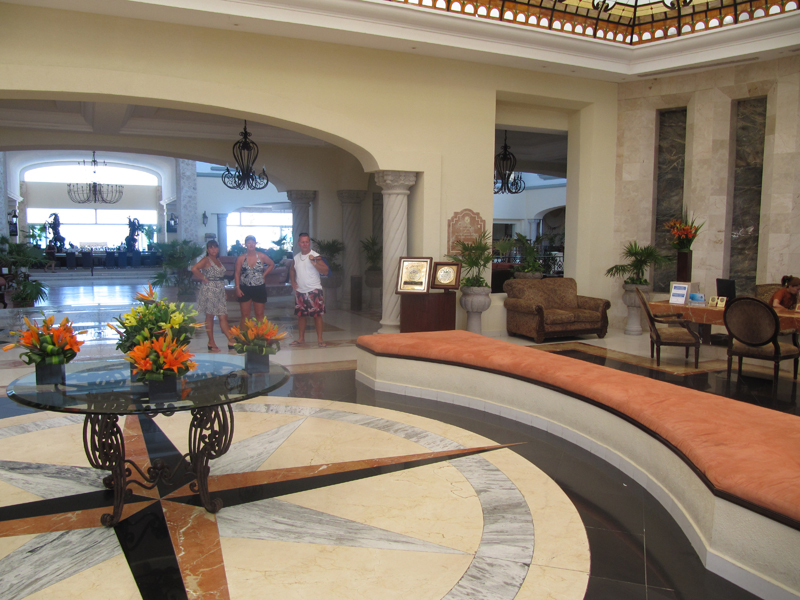 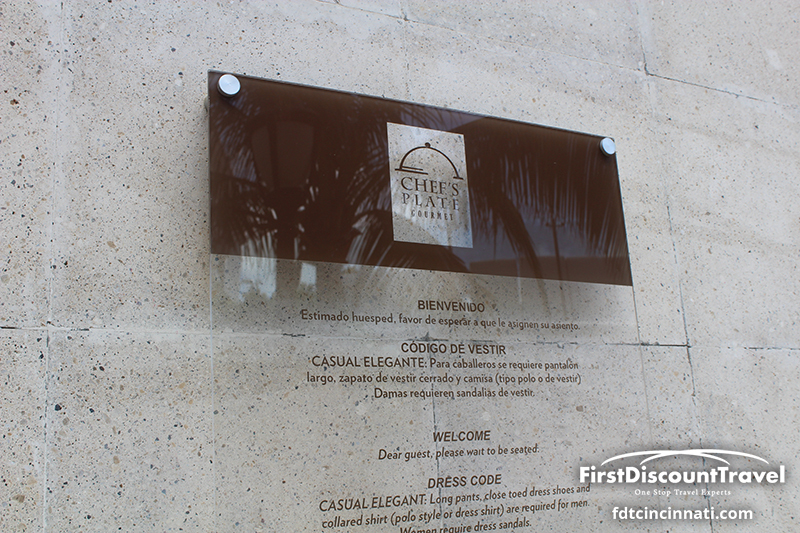 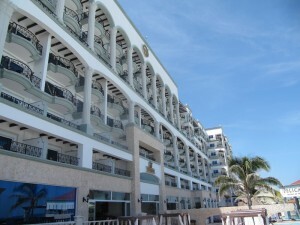 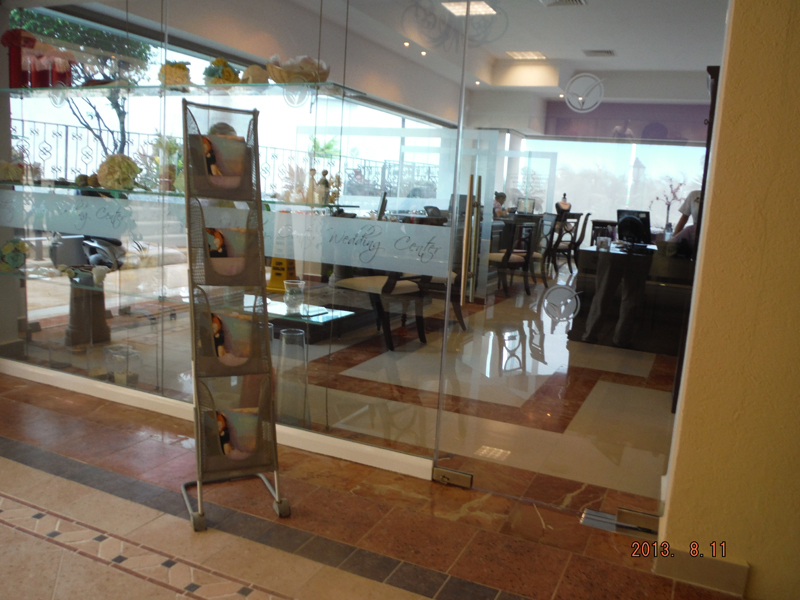 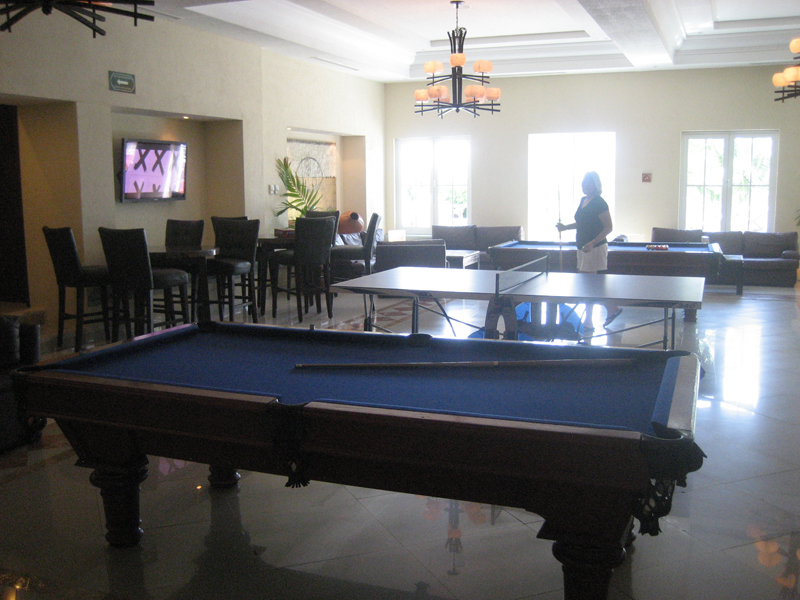 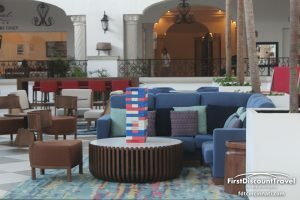 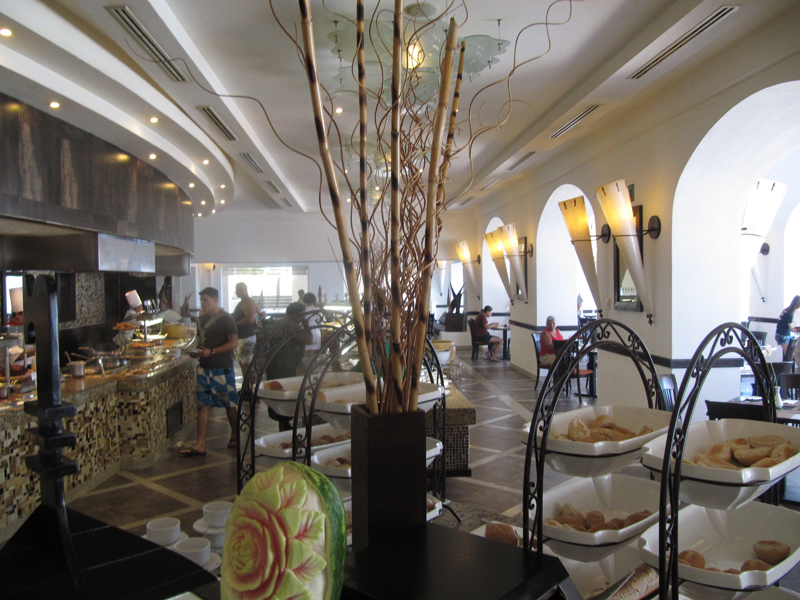 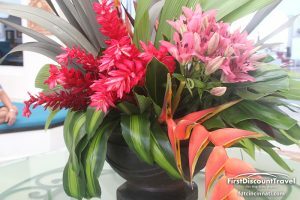 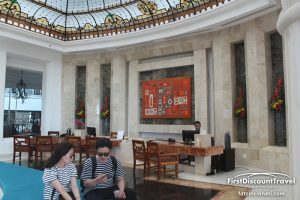 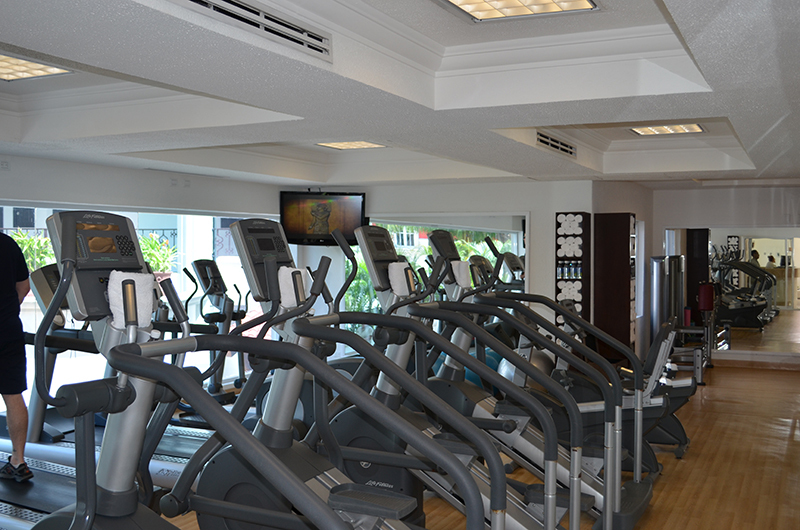 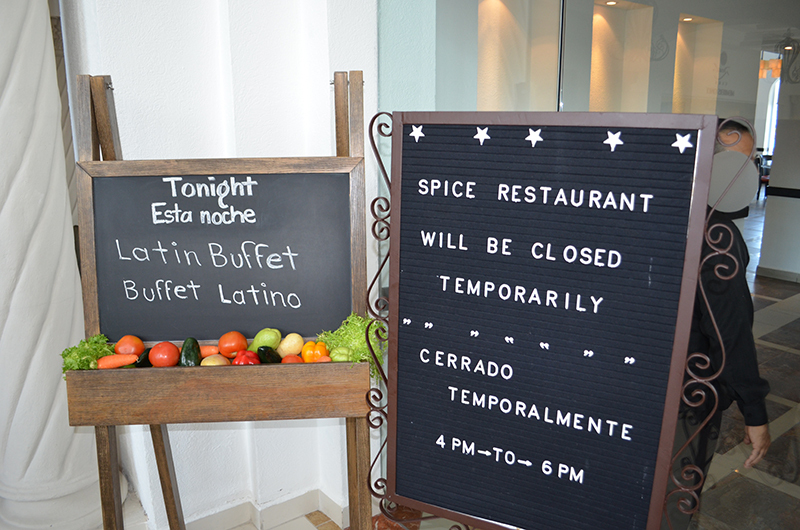 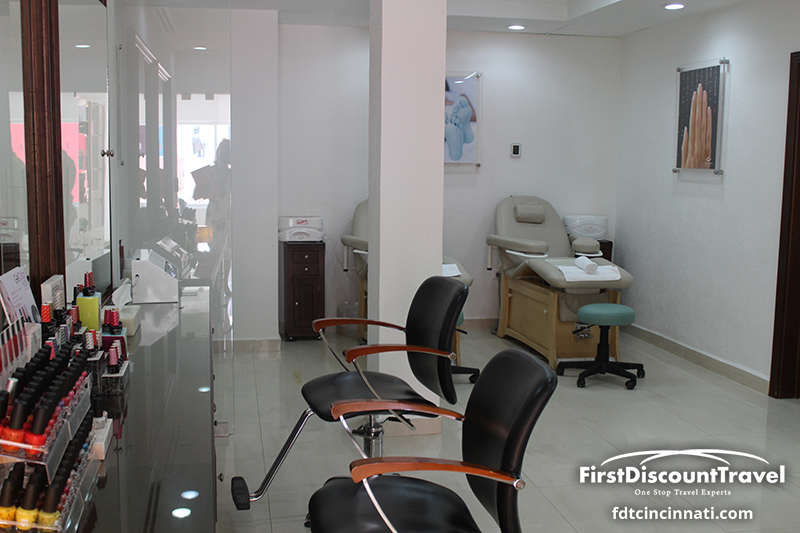 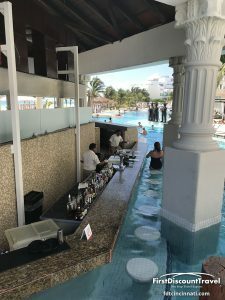 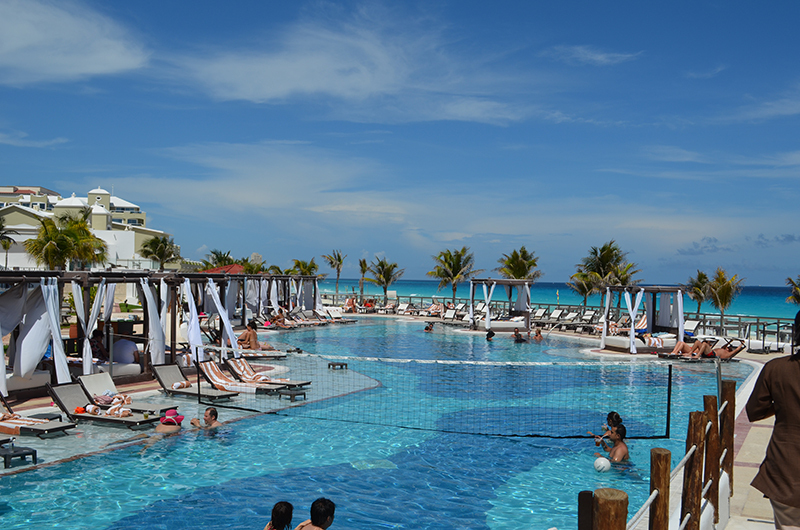 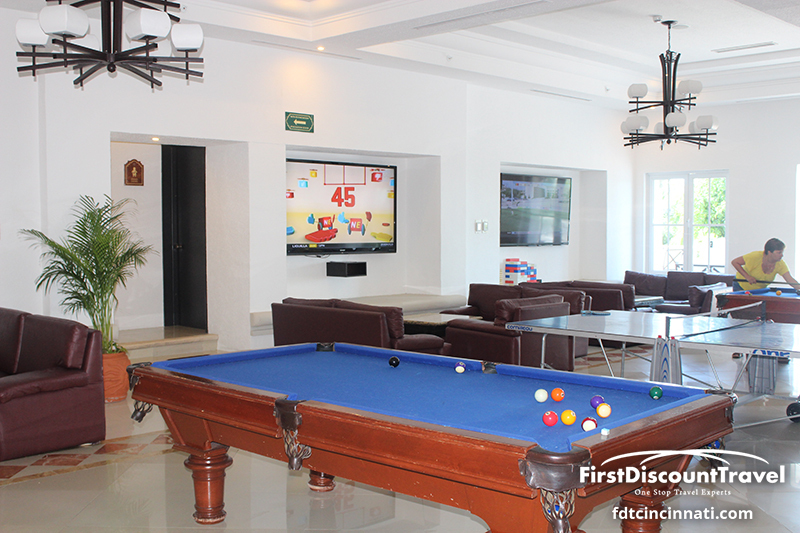 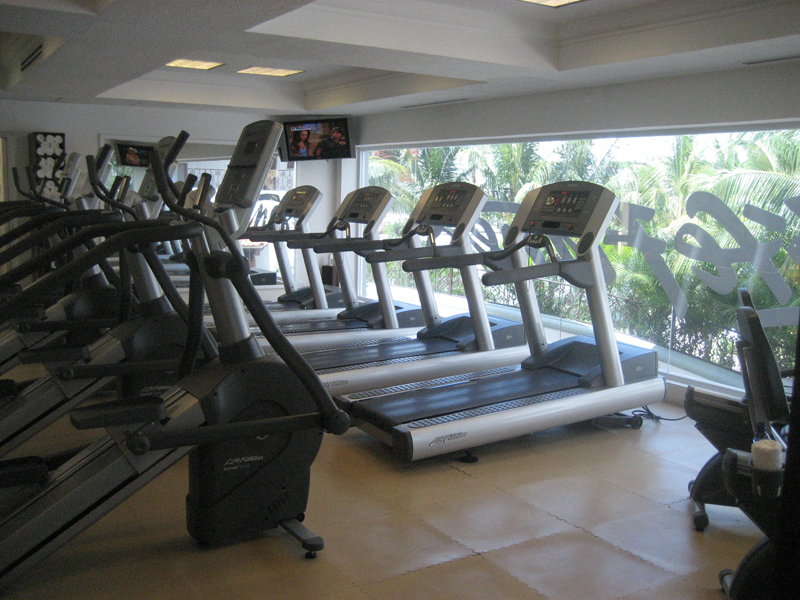 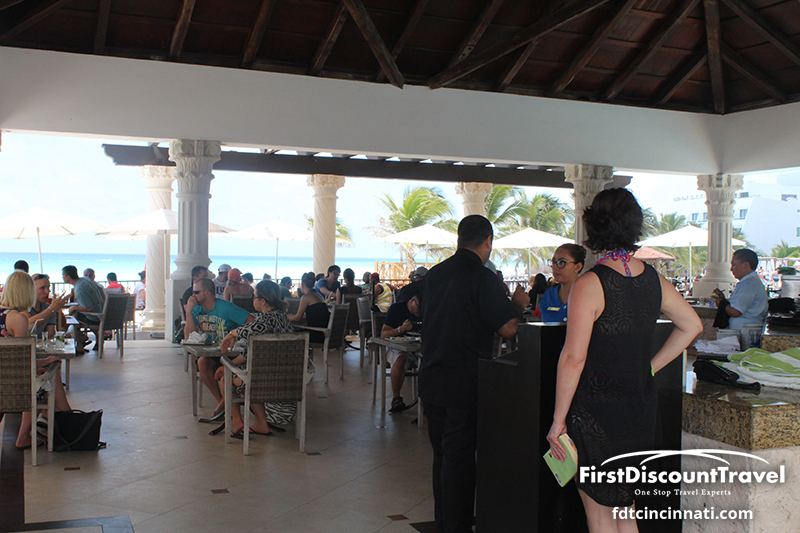 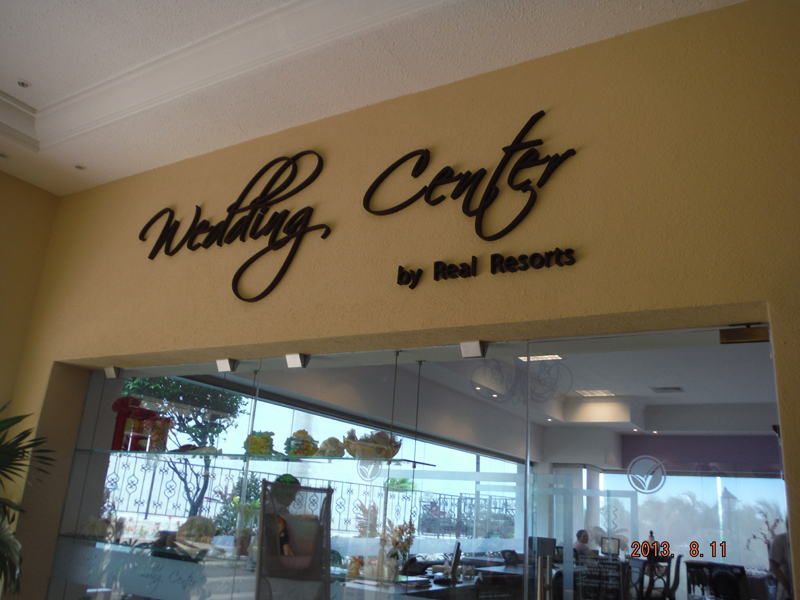 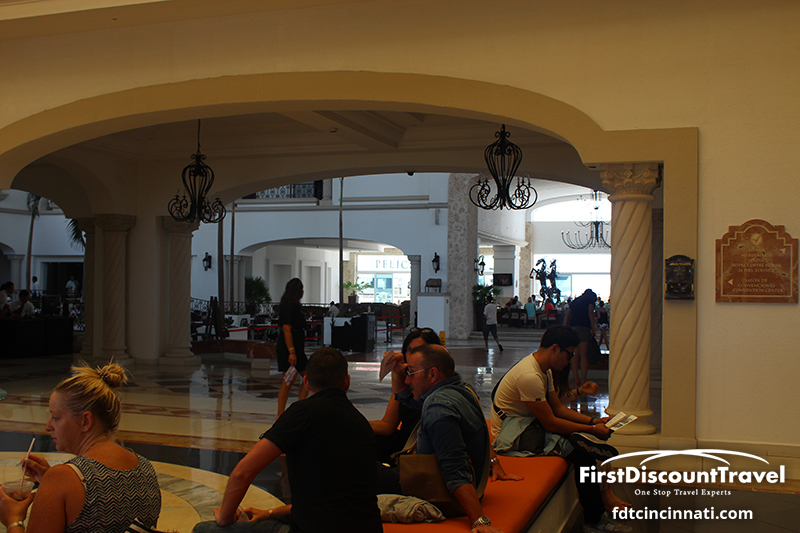 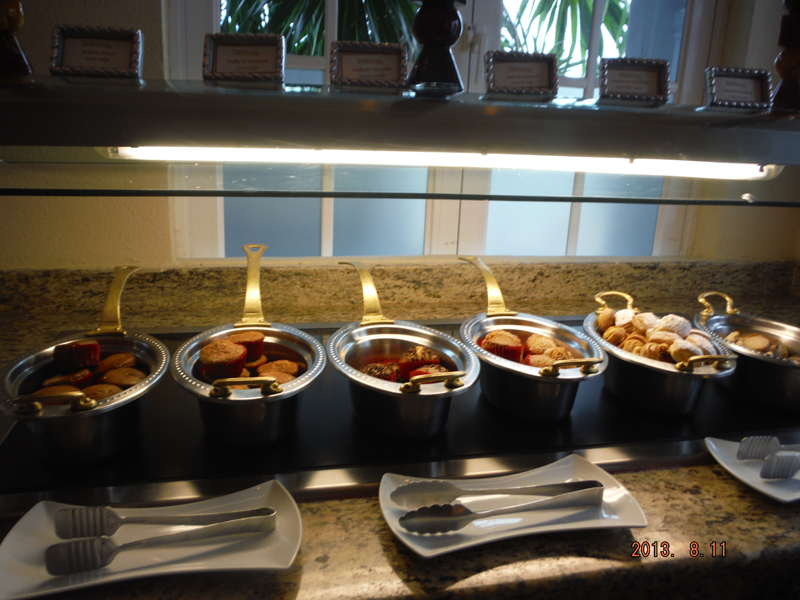 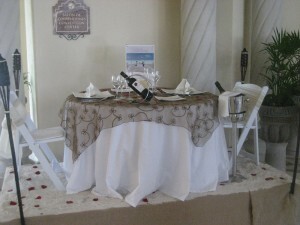 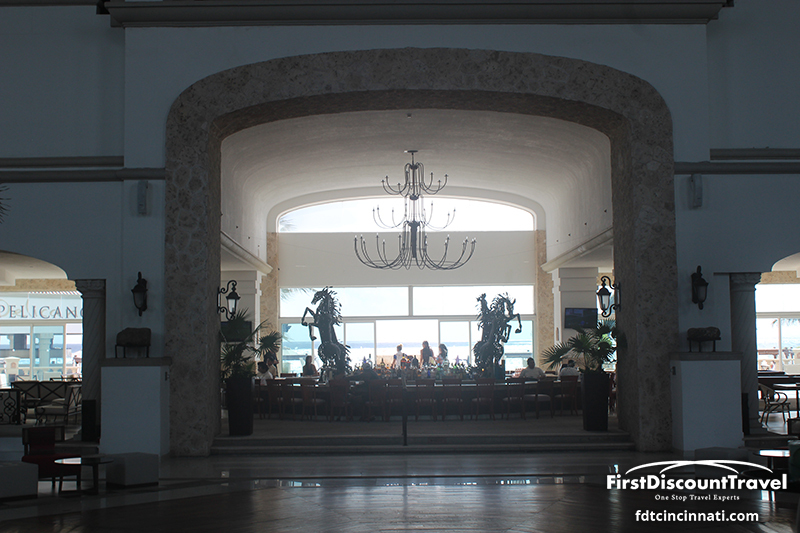 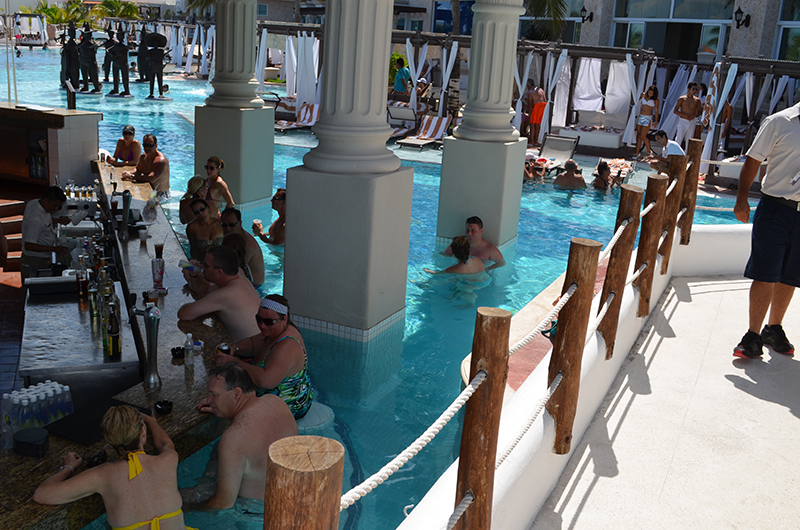 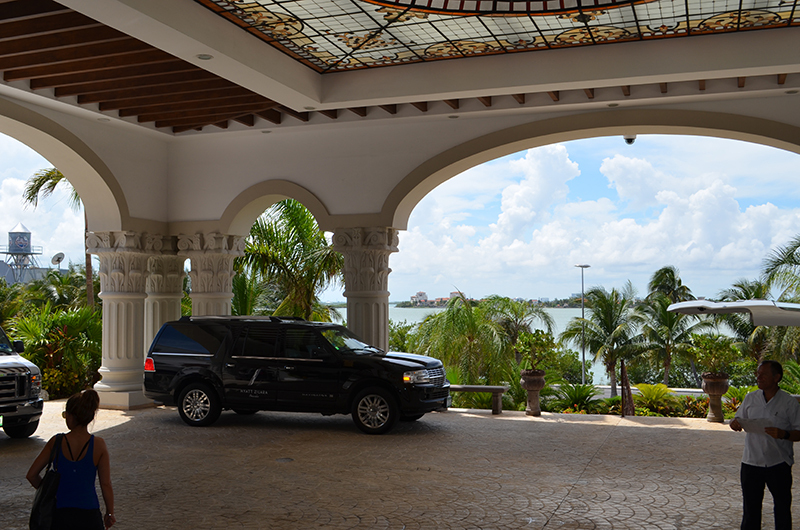 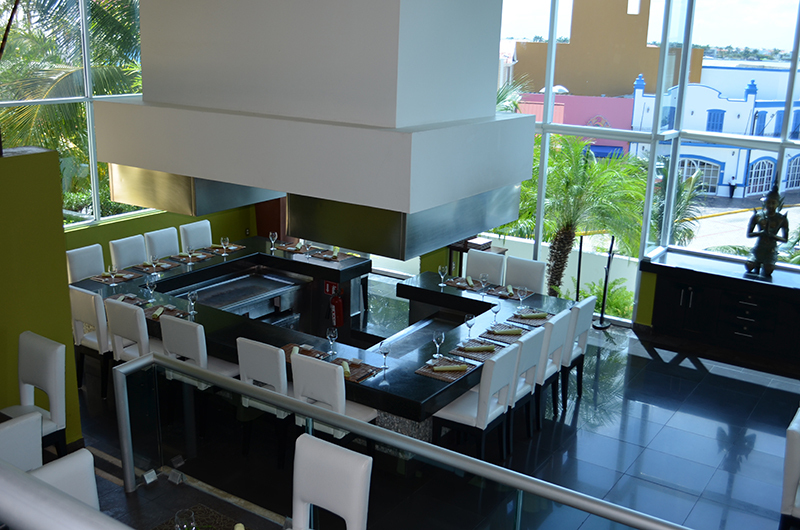 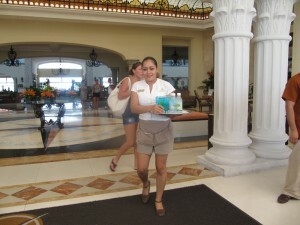 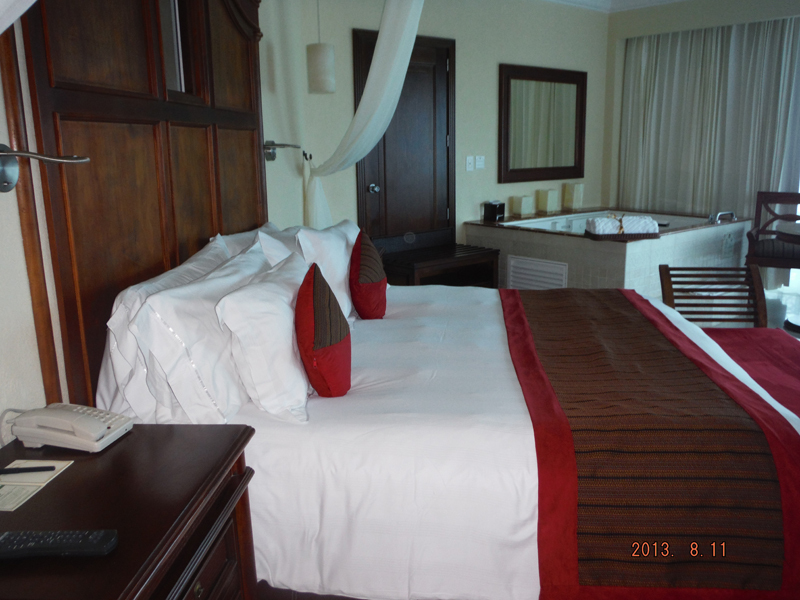 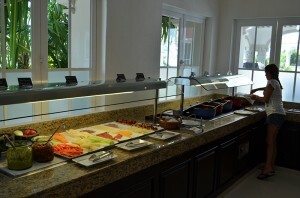 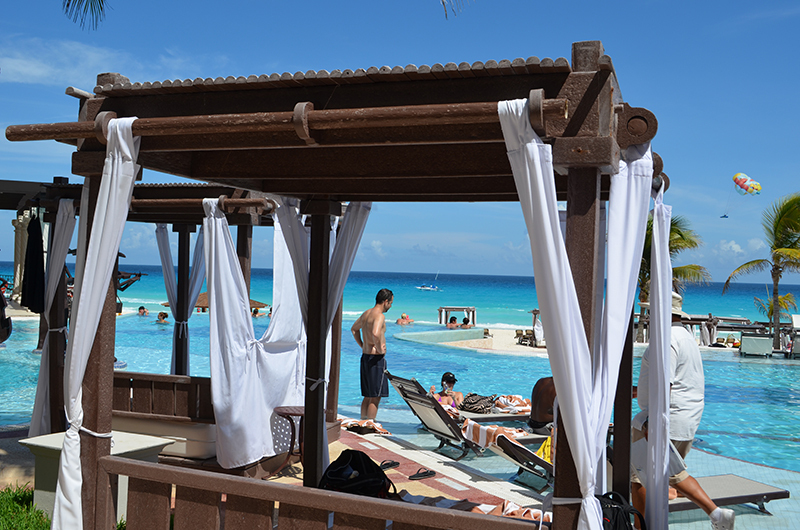 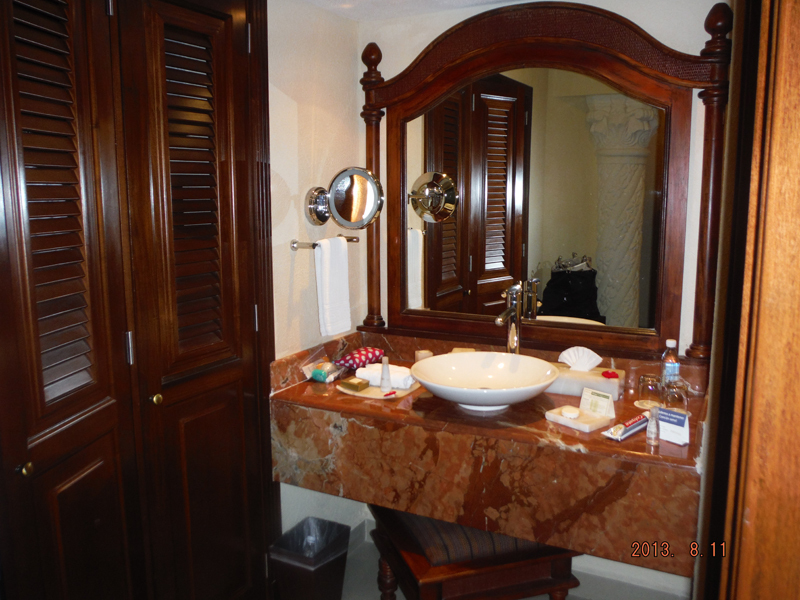 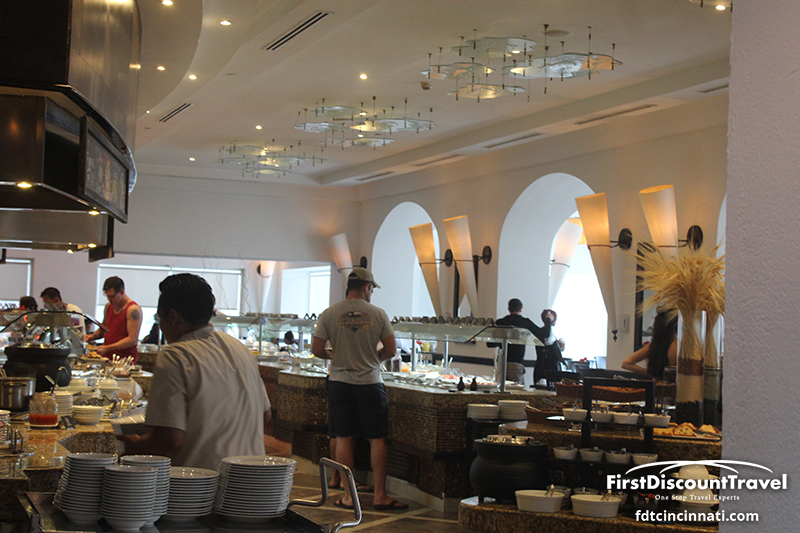 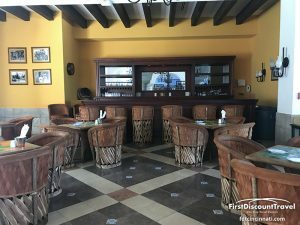 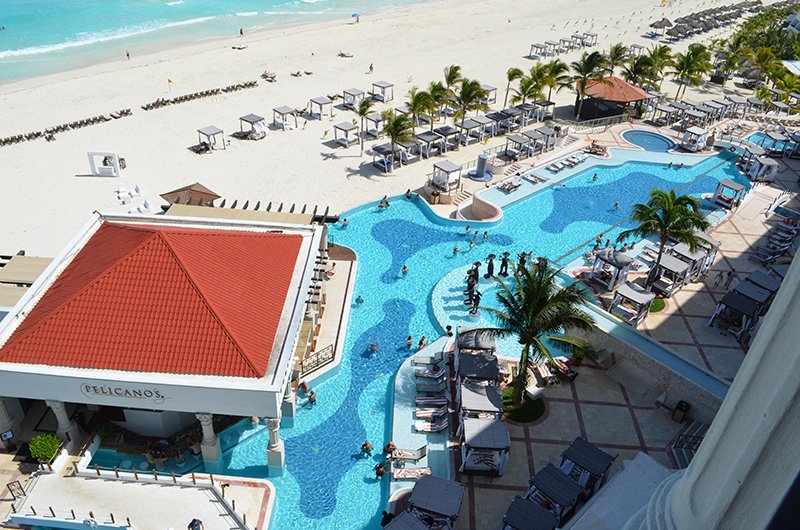 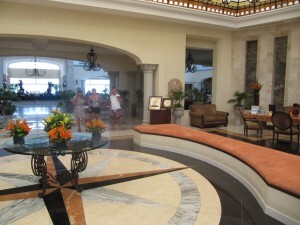 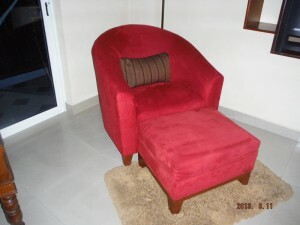 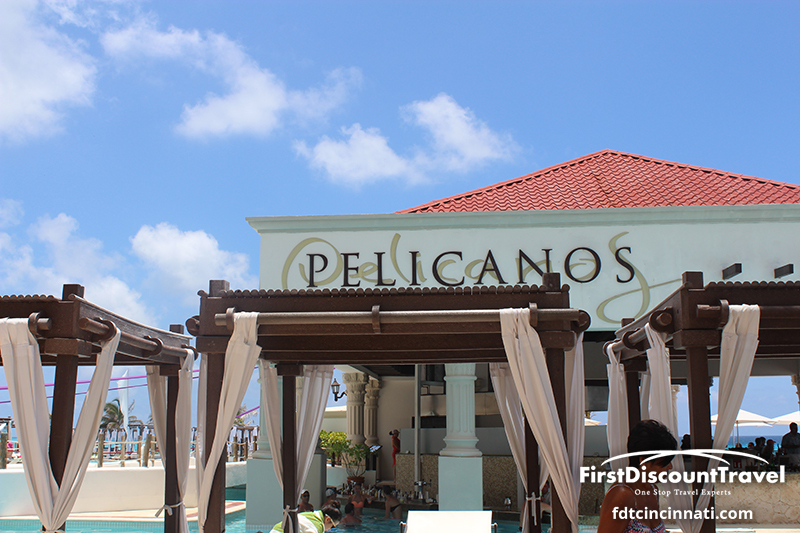 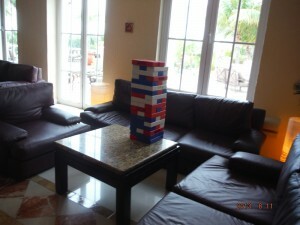 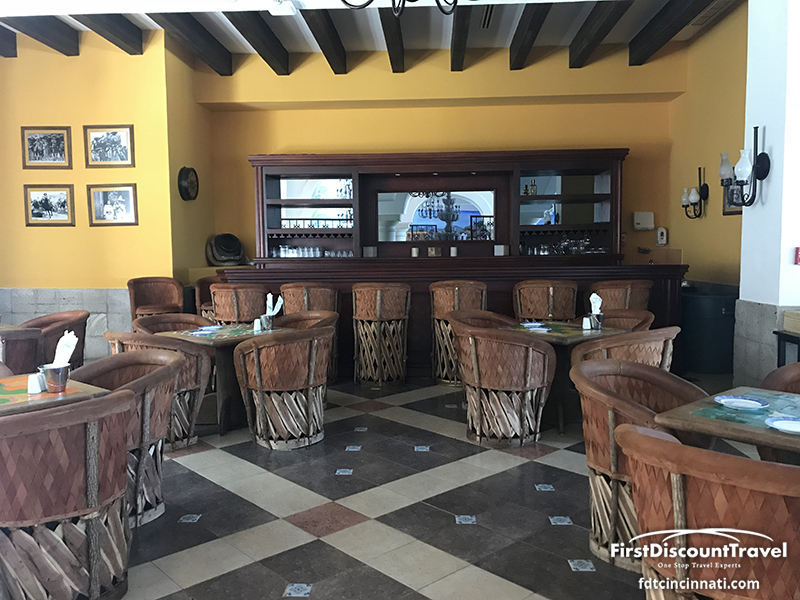 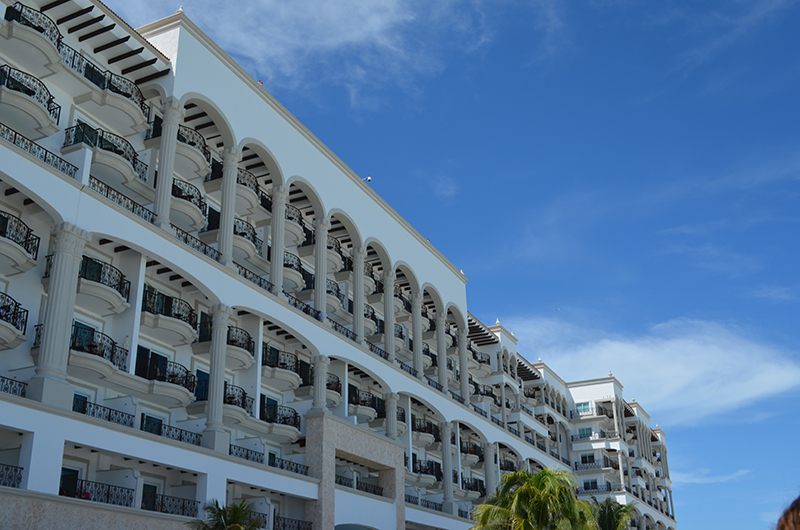 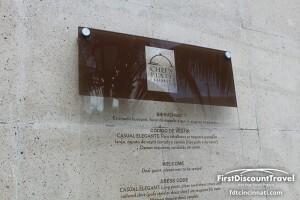 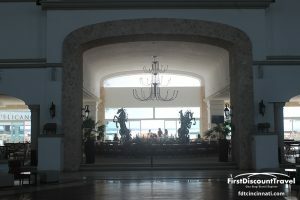 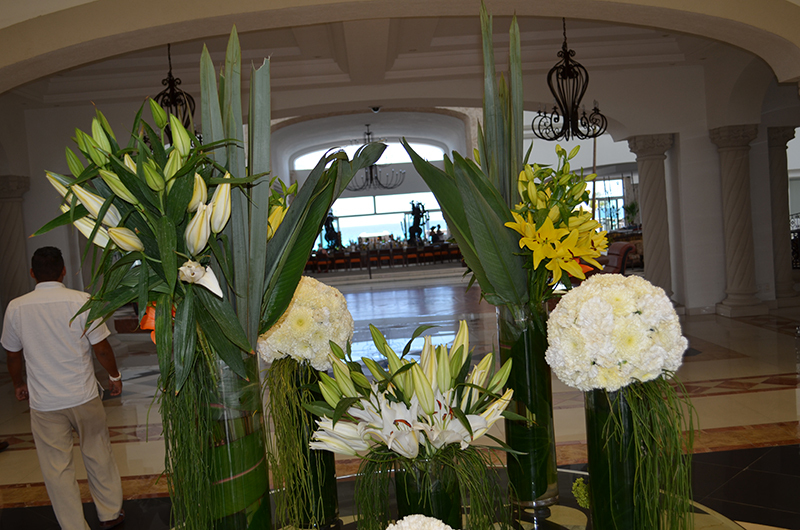 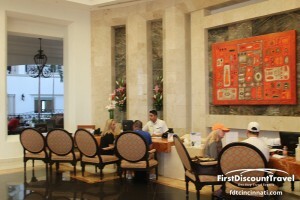 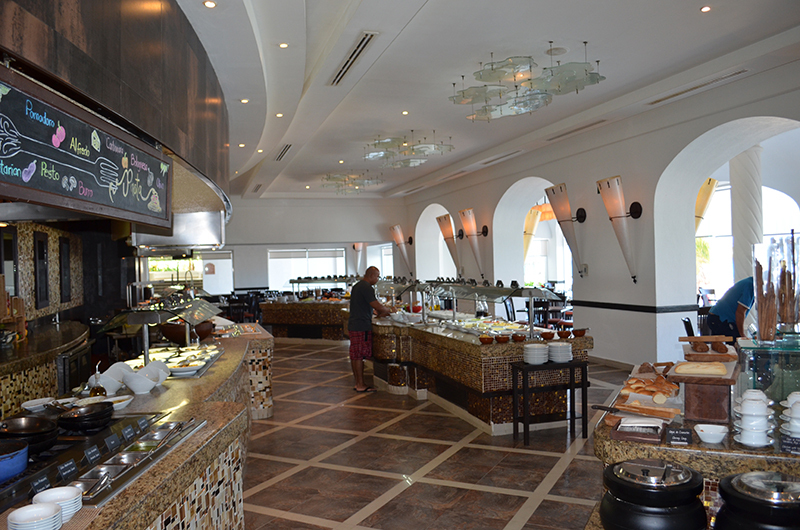 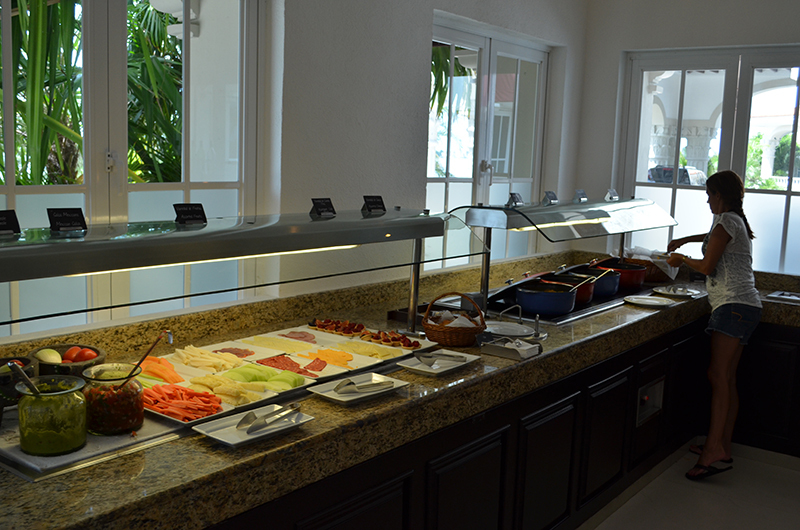 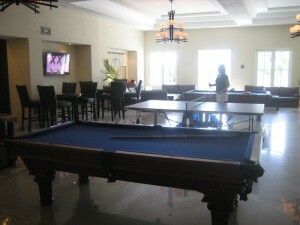 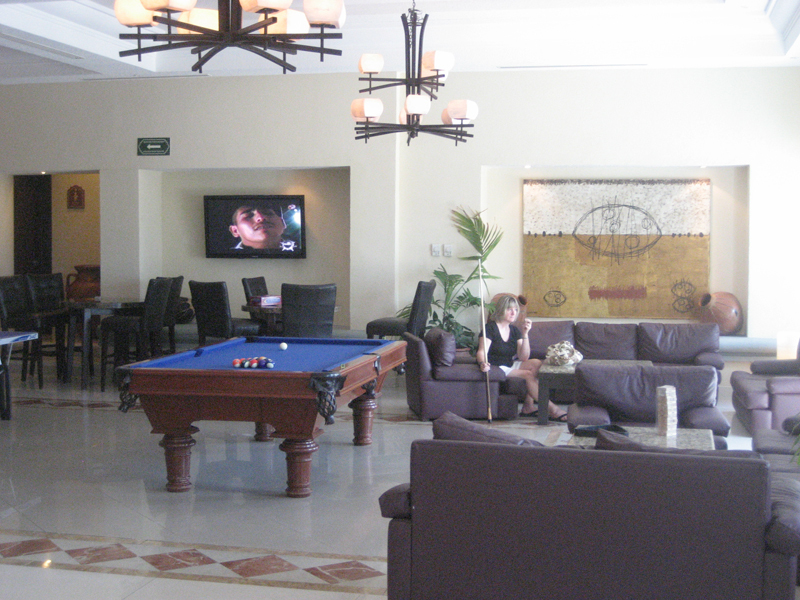 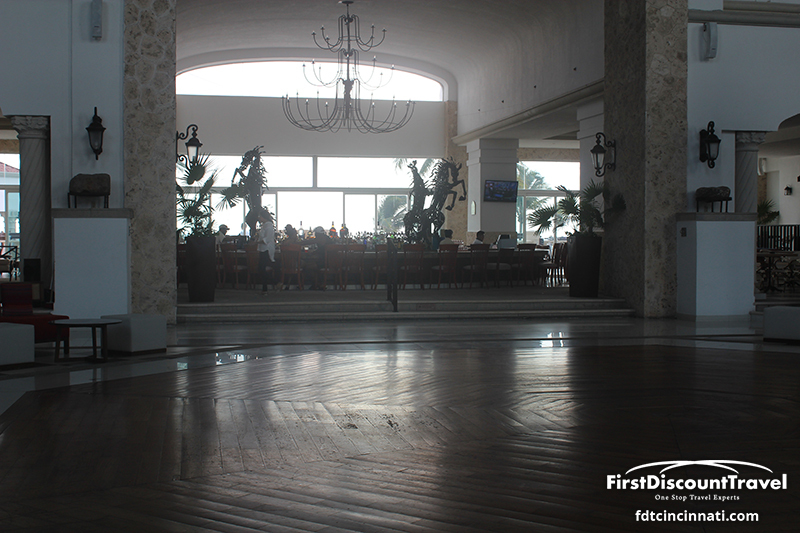 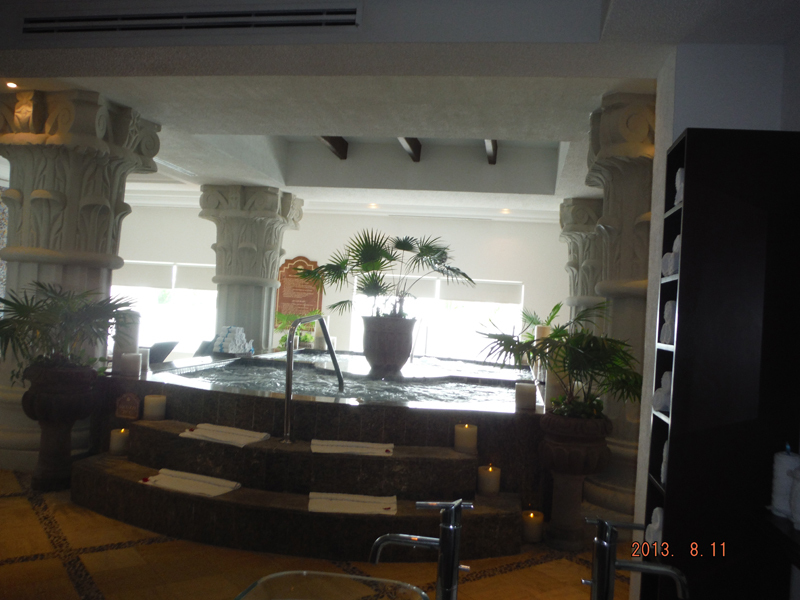 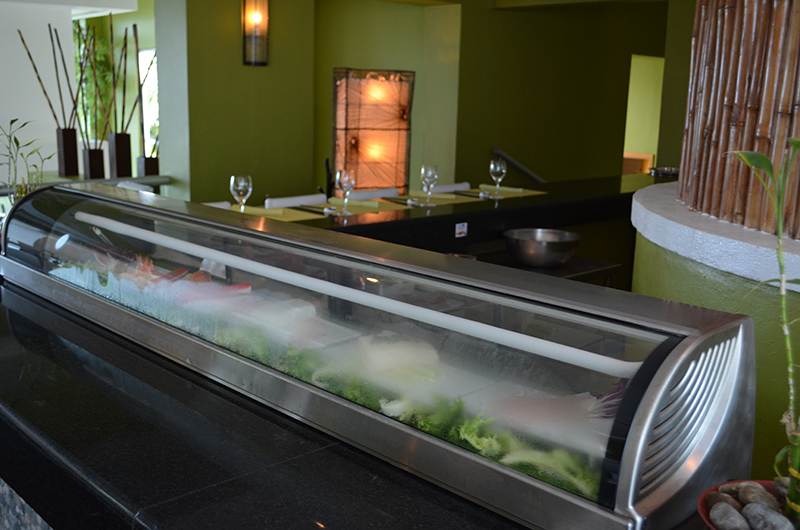 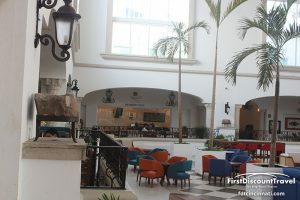 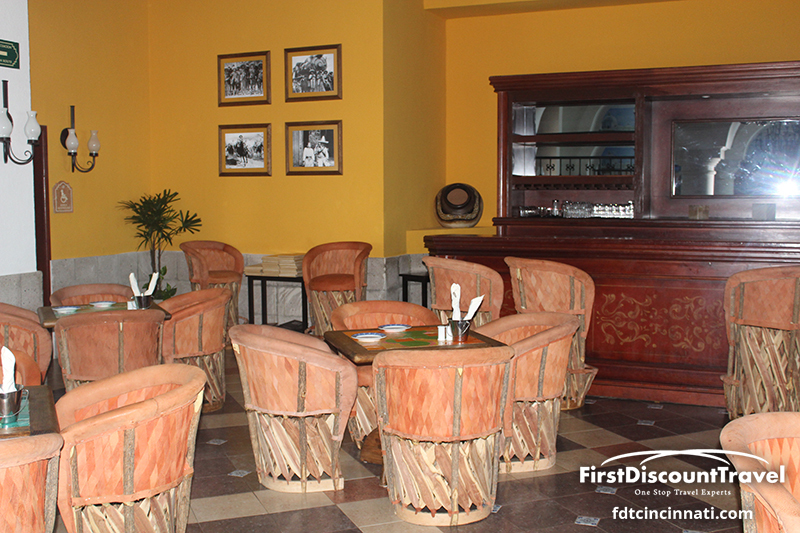 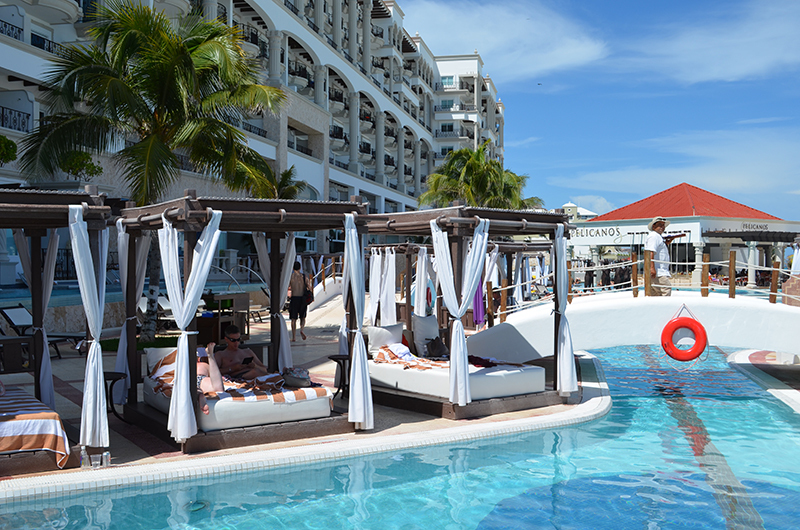 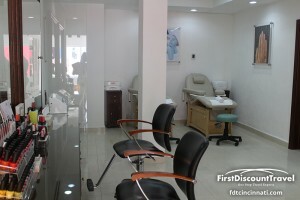 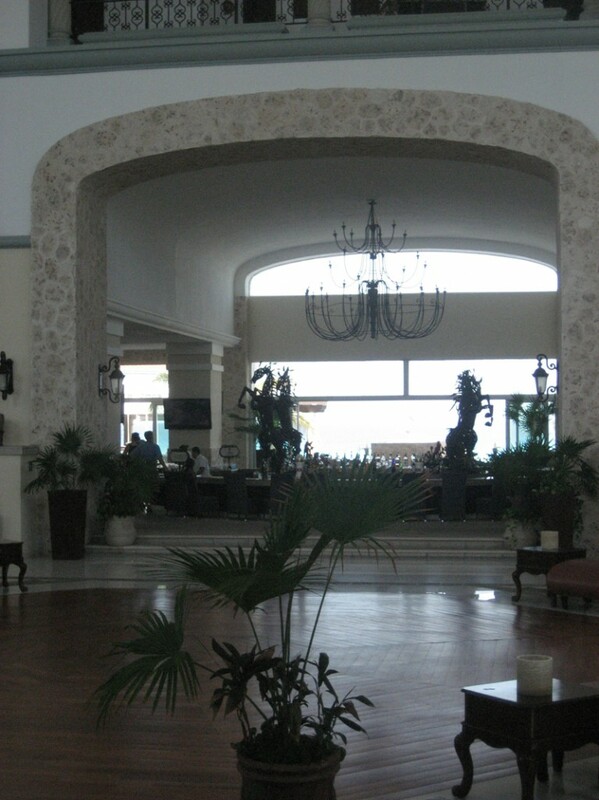 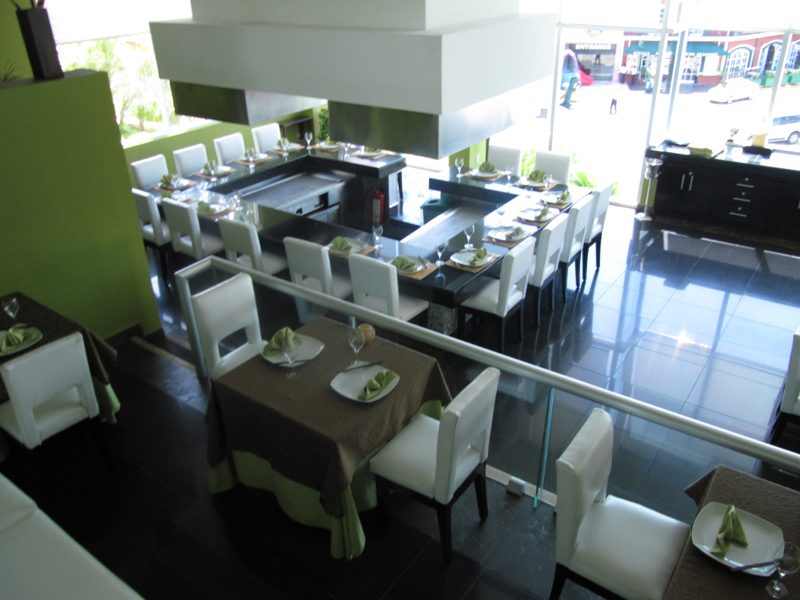 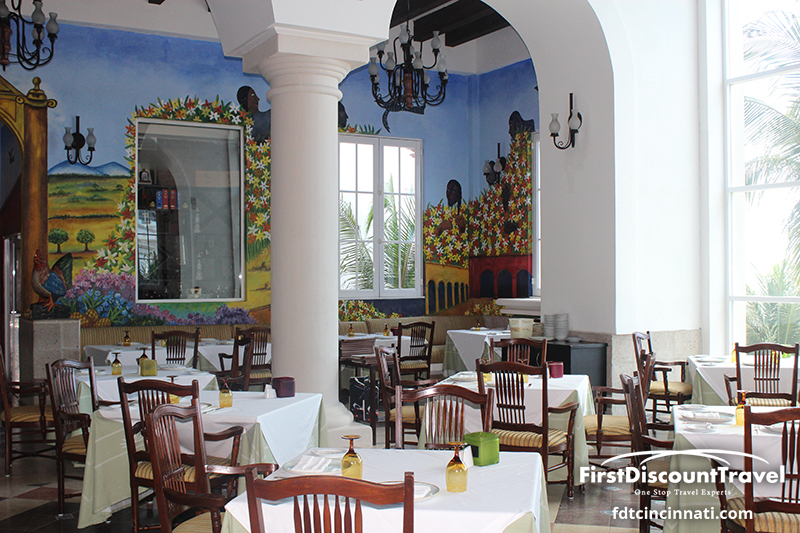 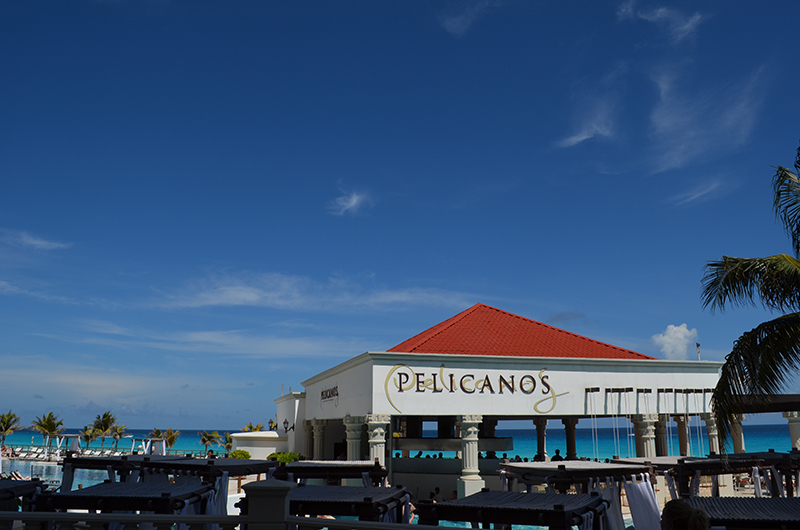 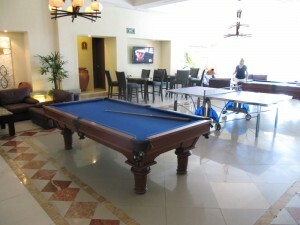 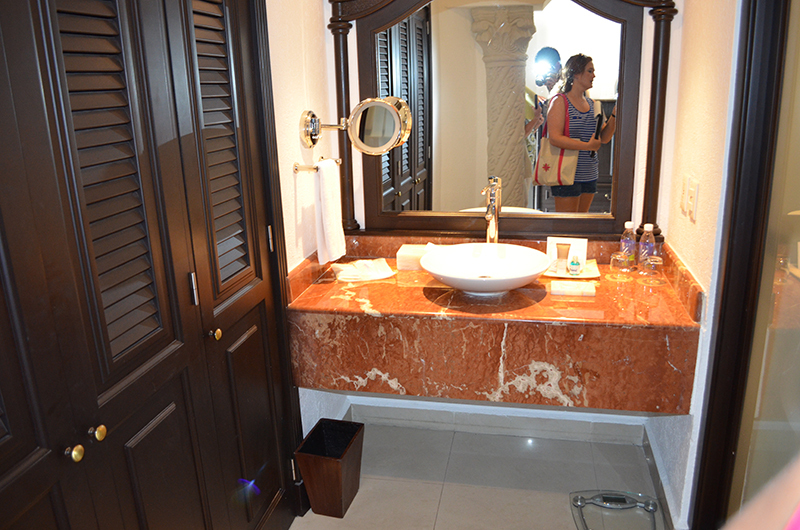 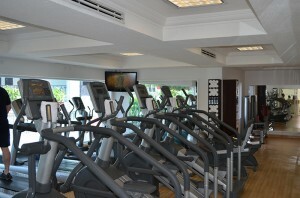 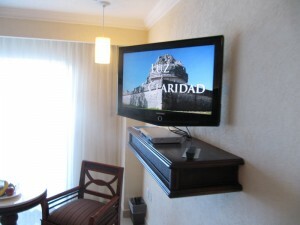 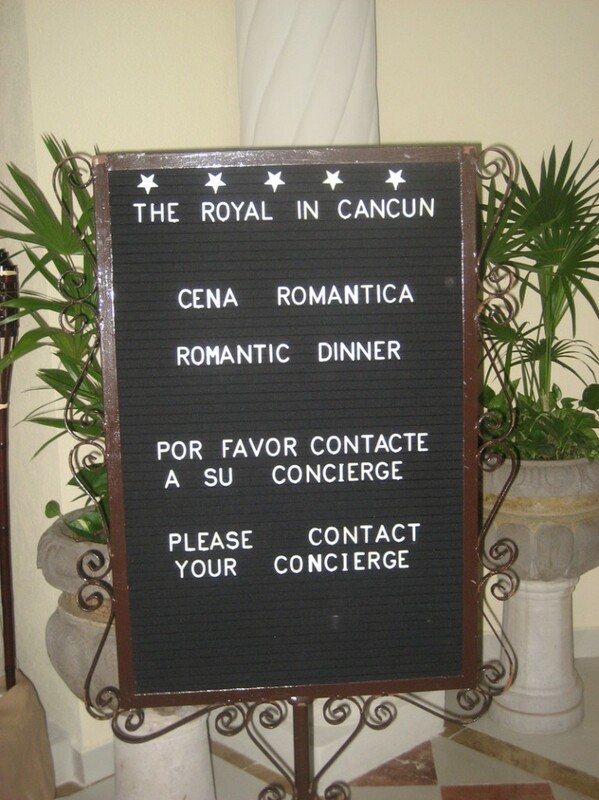 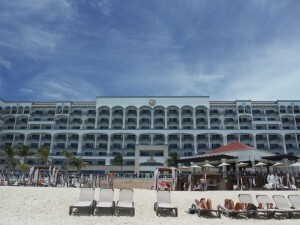 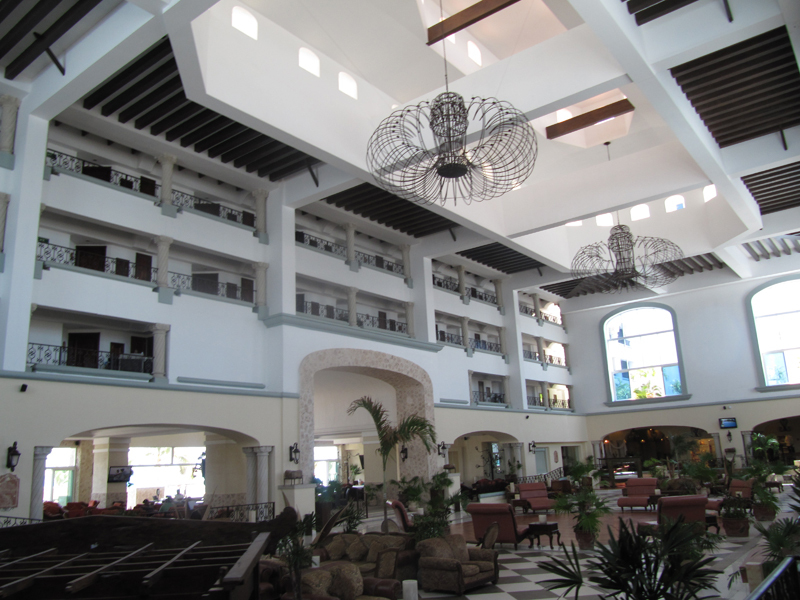 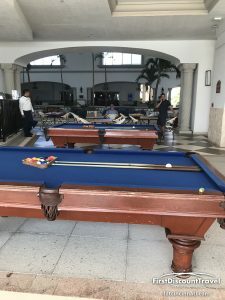 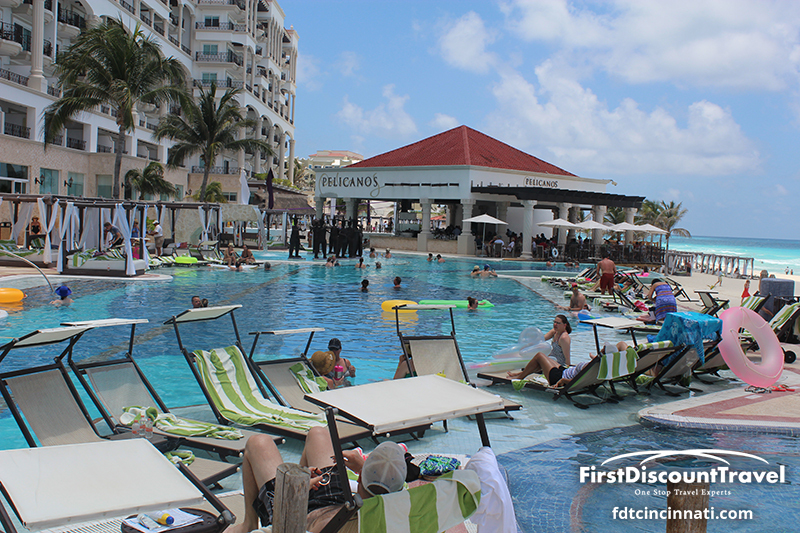 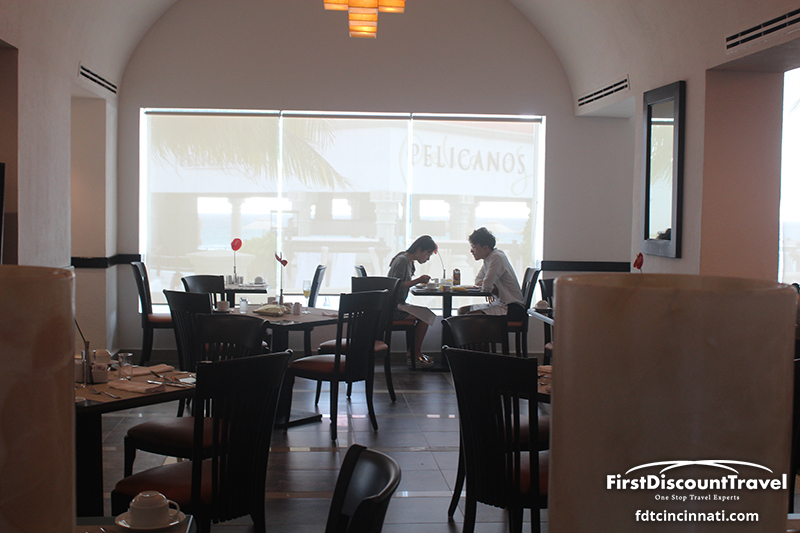 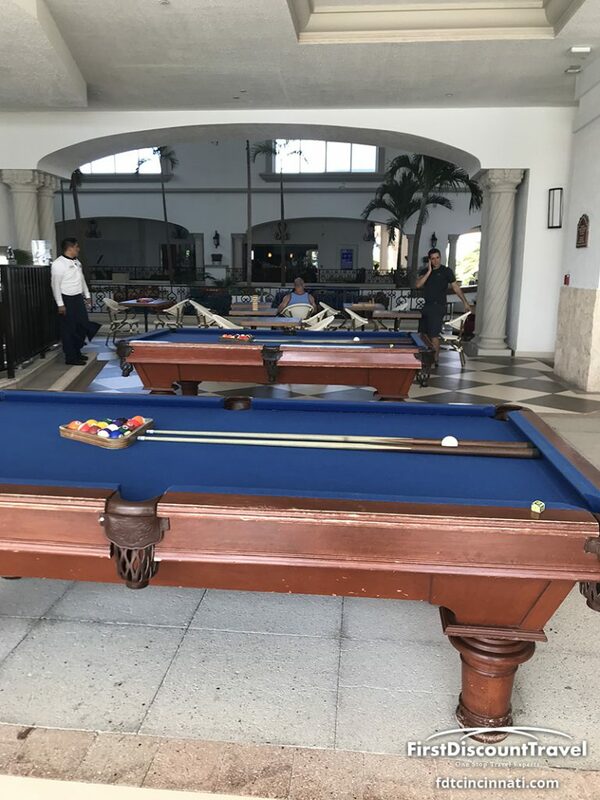 Guests at the Royal can visit, play, eat and drink at the neighboring Gran Caribe Real. 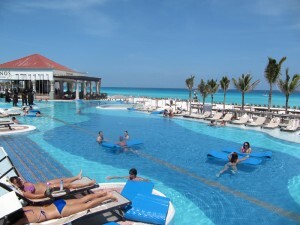 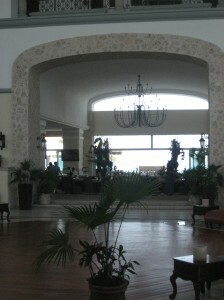 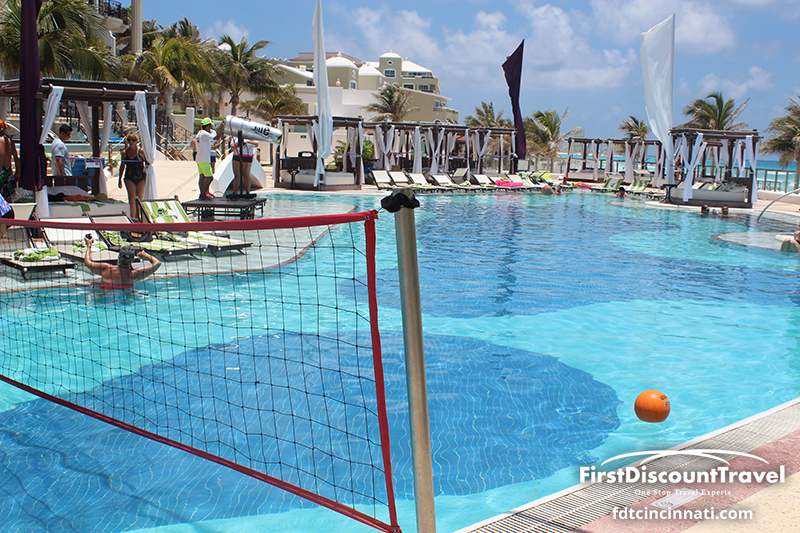 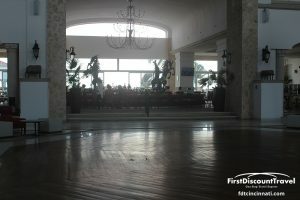 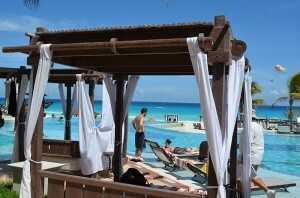 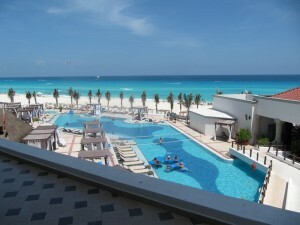 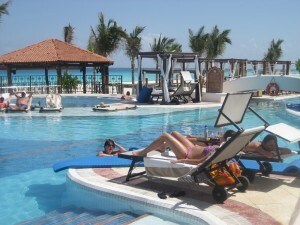 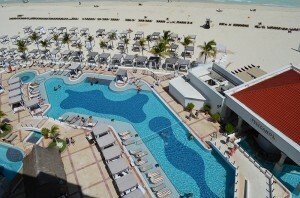 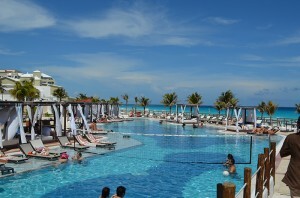 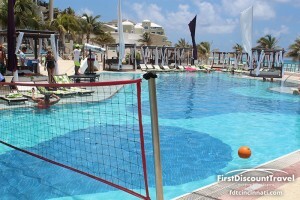 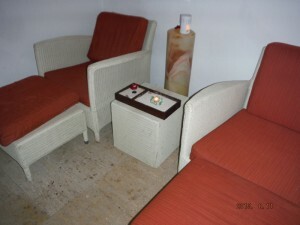 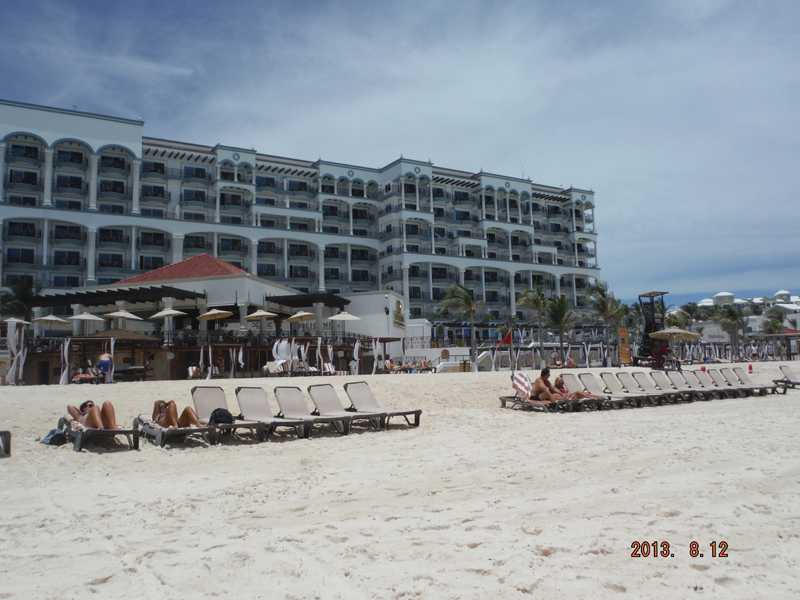 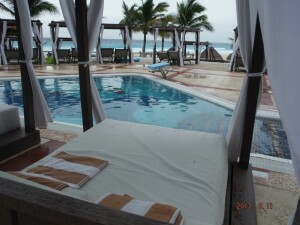 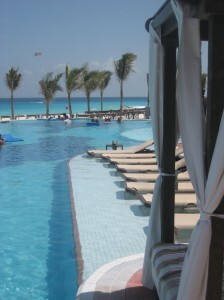 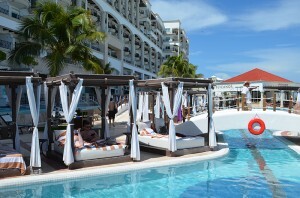 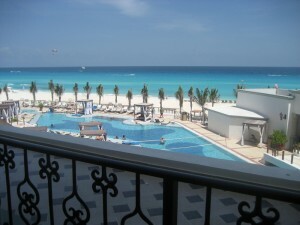 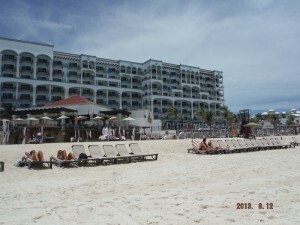 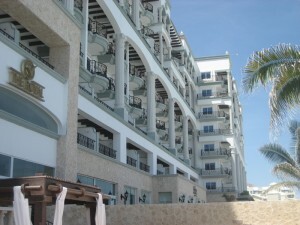 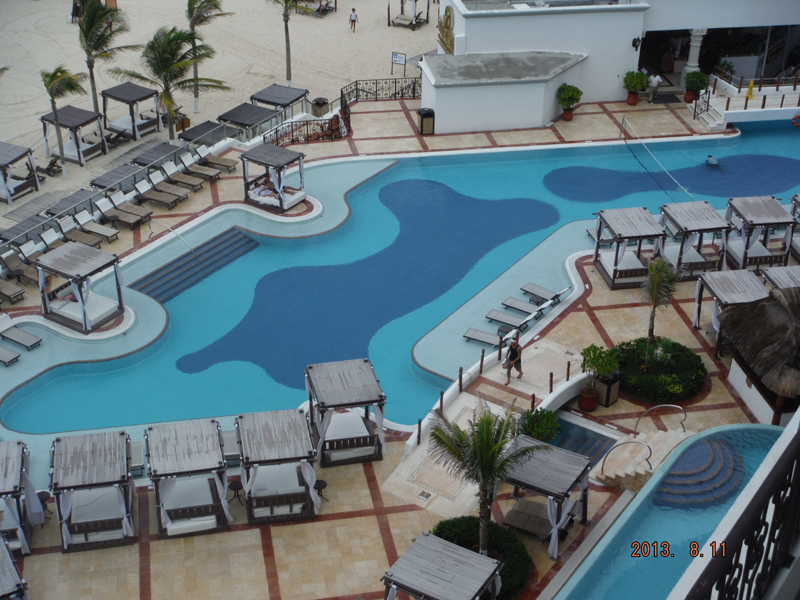 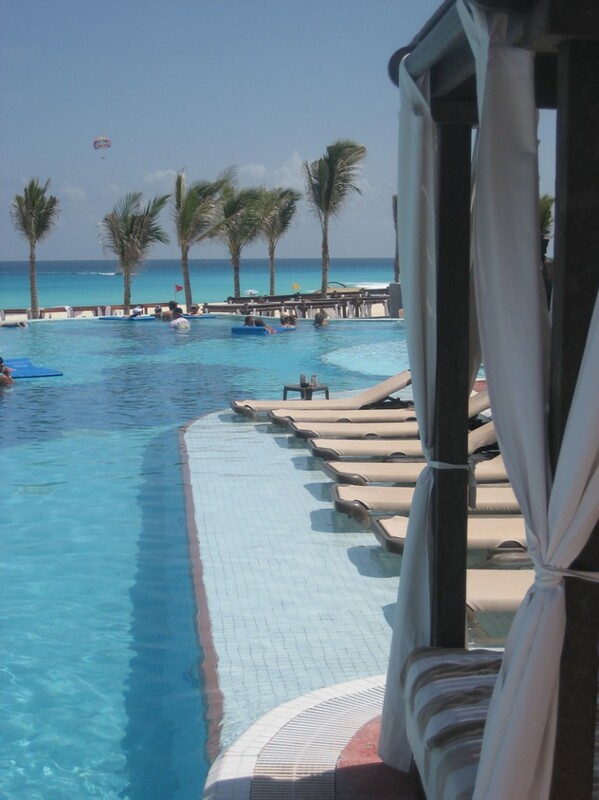 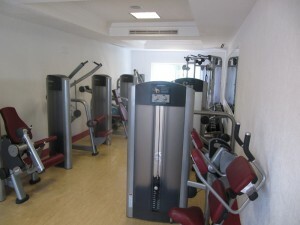 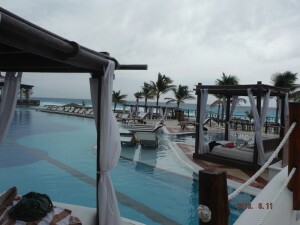 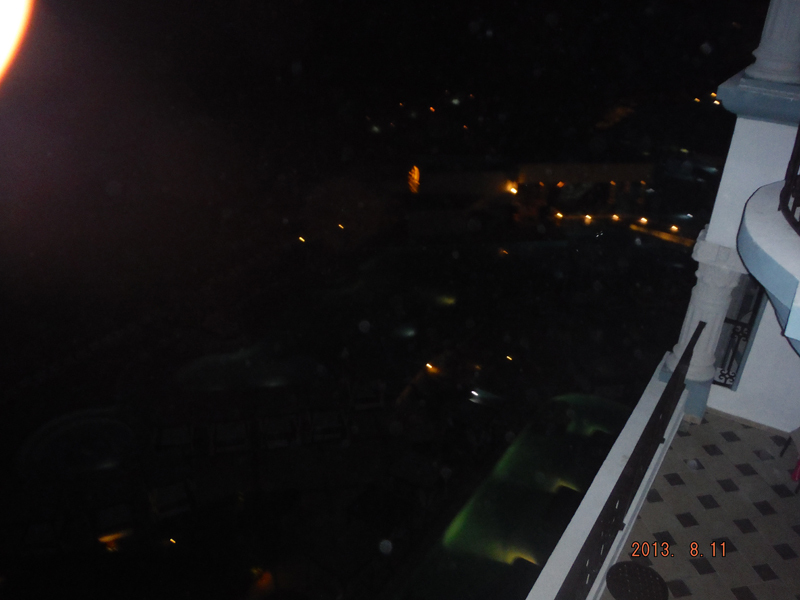 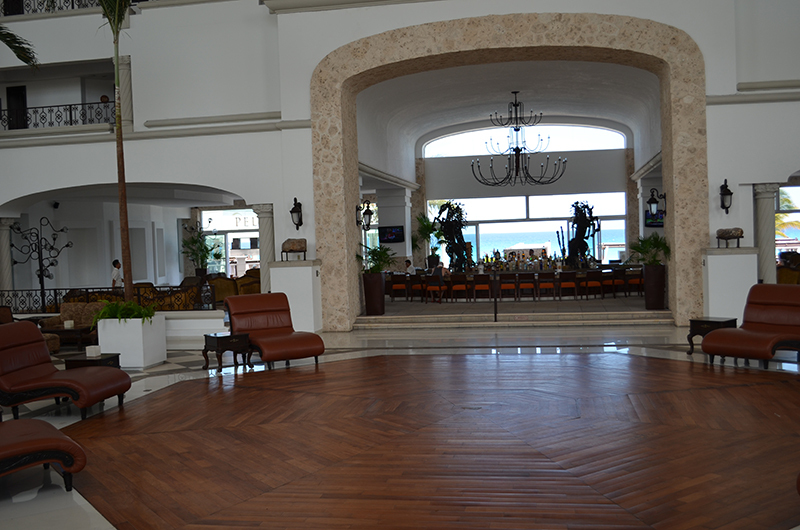 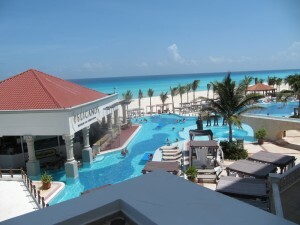 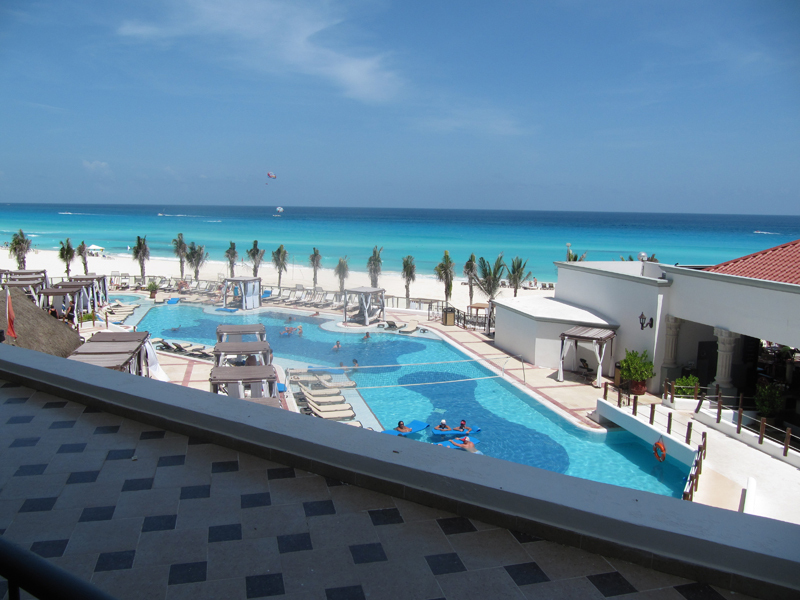 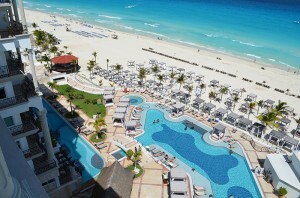 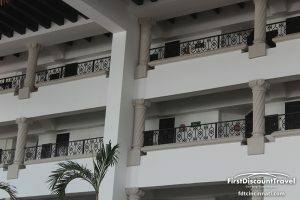 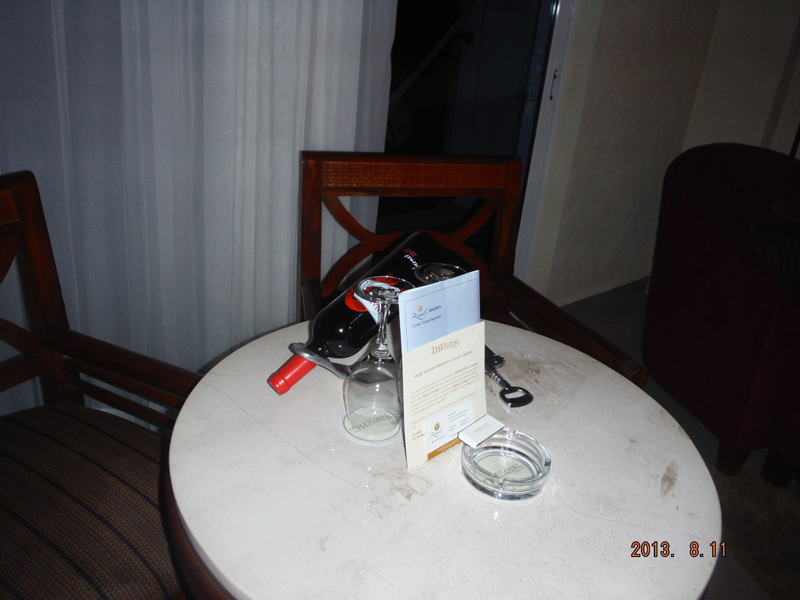 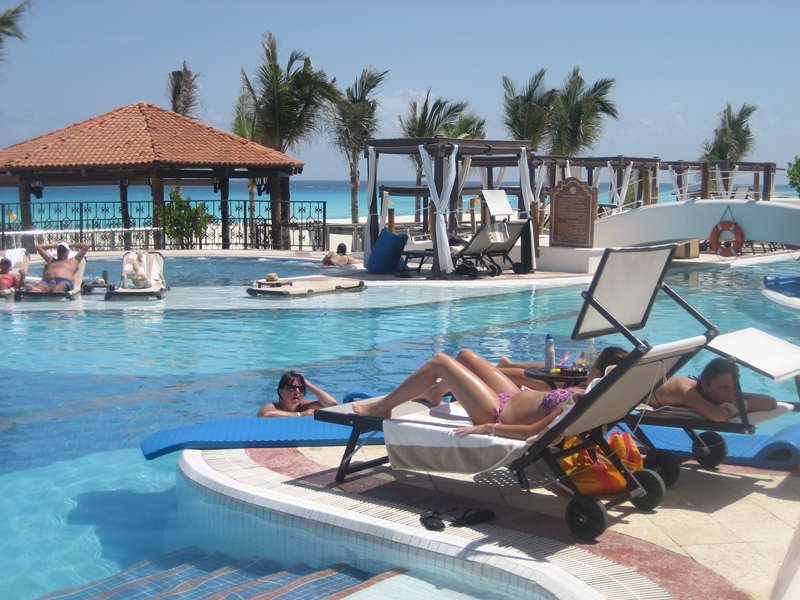 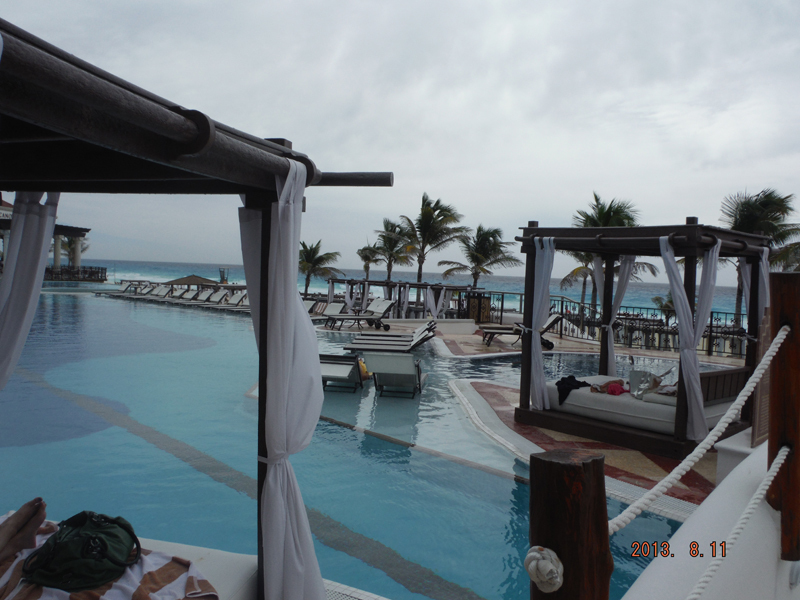 The resort has a very large beachfront pool divided into a quiet side and an activity side with mix and R and B music. 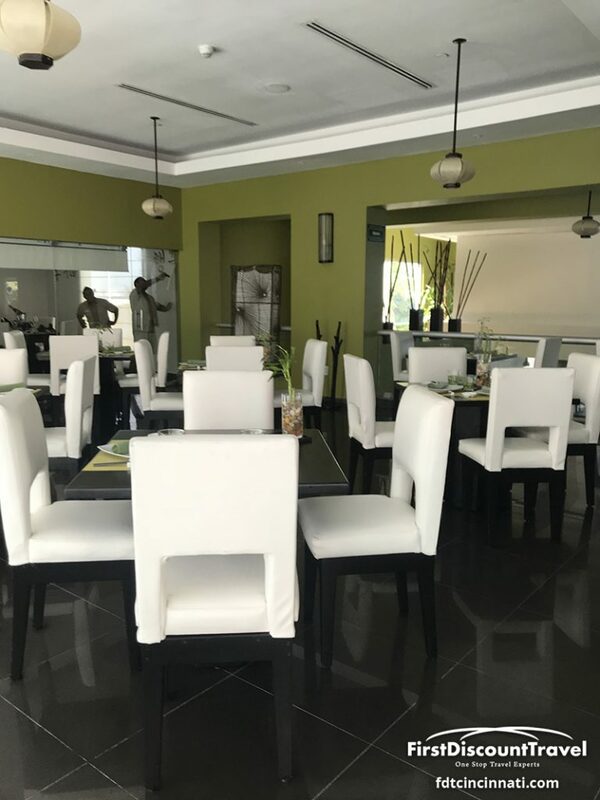 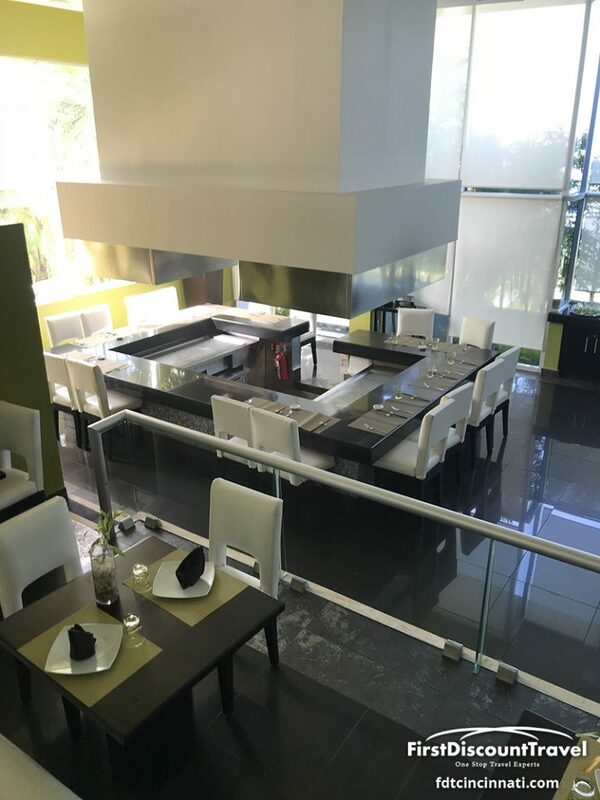 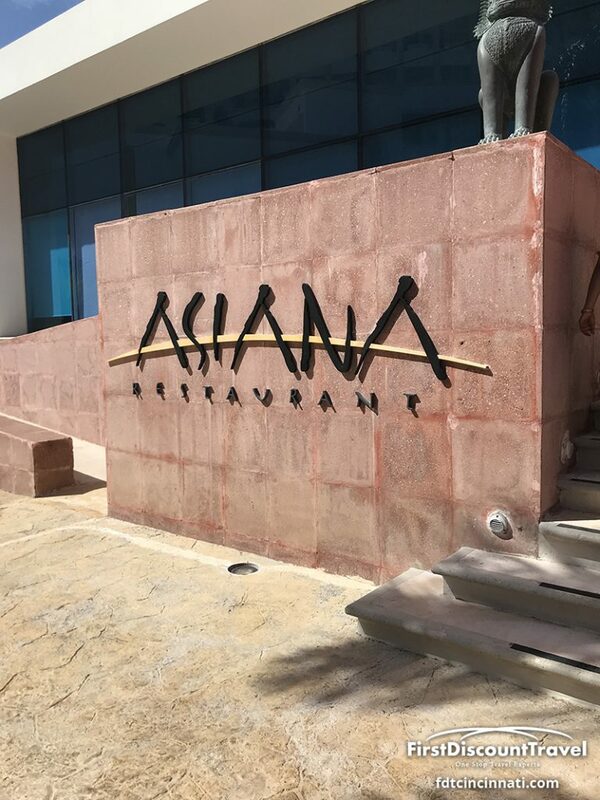 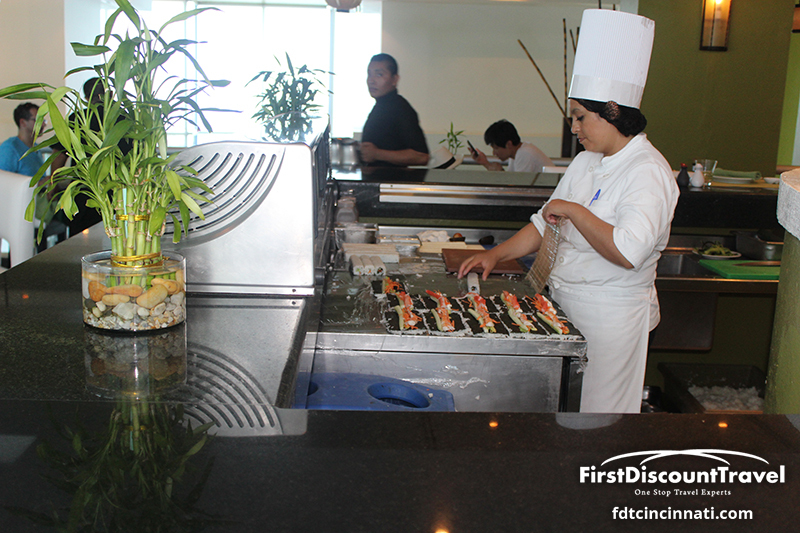 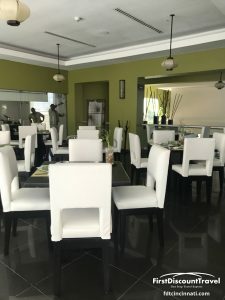 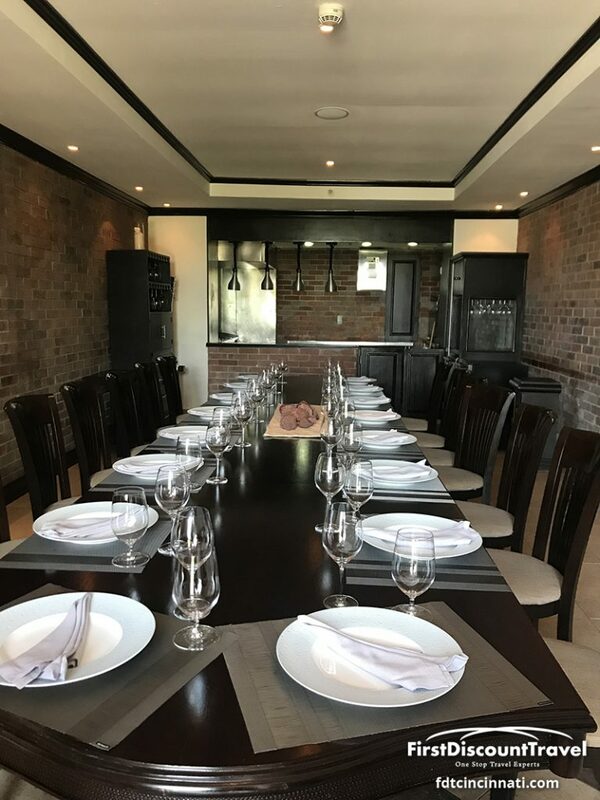 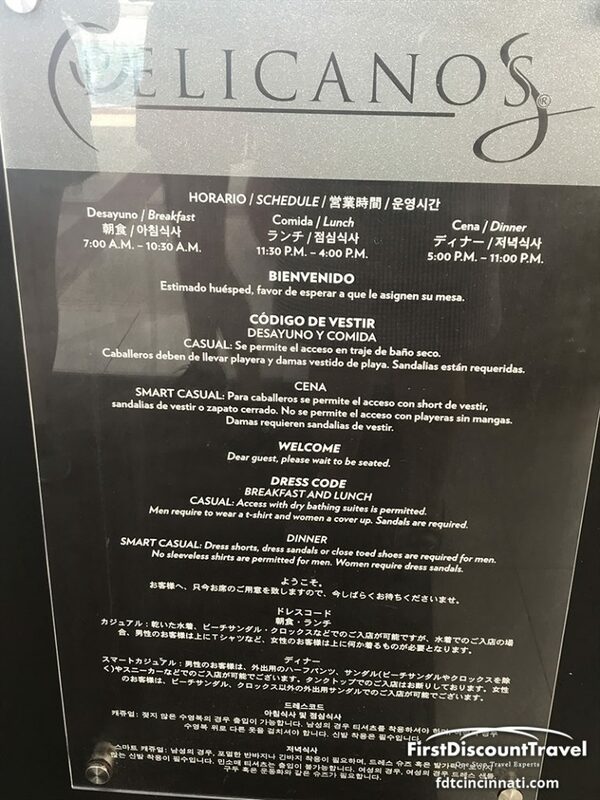 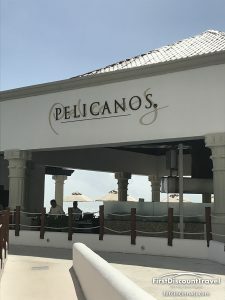 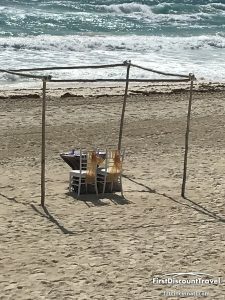 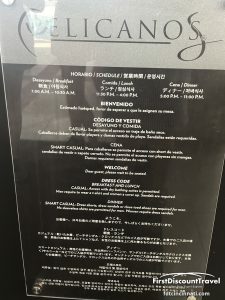 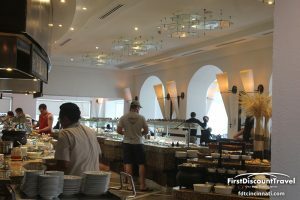 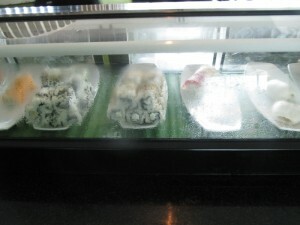 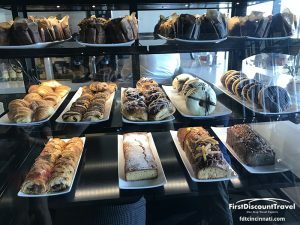 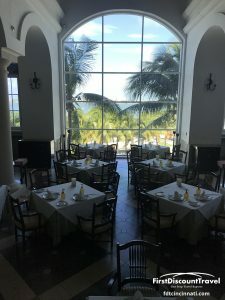 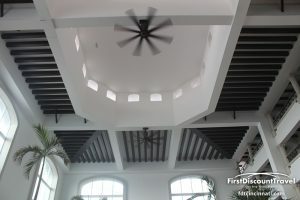 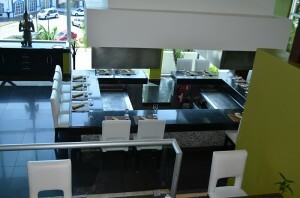 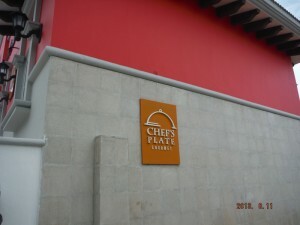 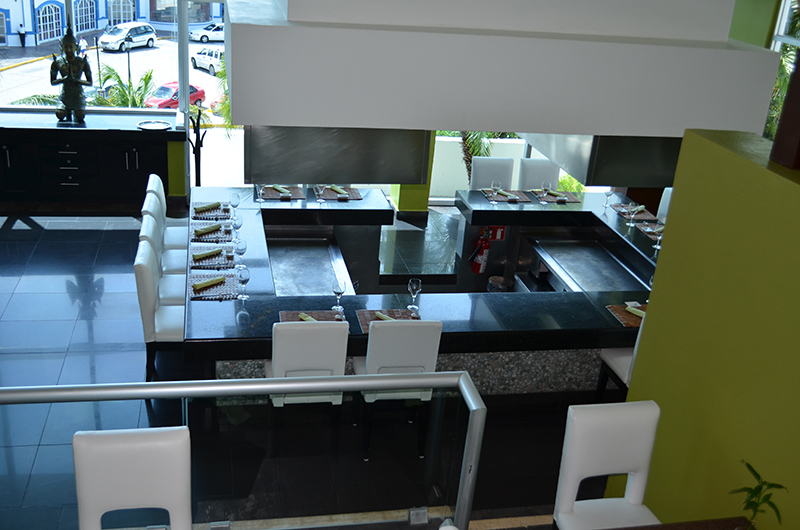 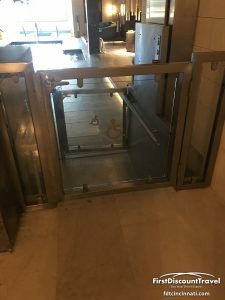 There are 7 restaurants: The Chef’s Plate (molecular gourmet cuisine) (reservations required and only for Royal Ocean front guests or higher), Spices (Buffet), Asiana (Oriental with Teppanaki tables and sushi), Maria Marie (Mexican French Fusion), Pelicanos (seafood), a Tapas restaurant and a steakhouse. 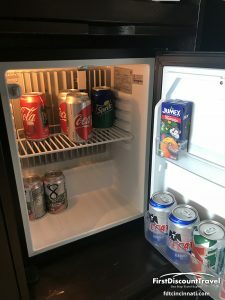 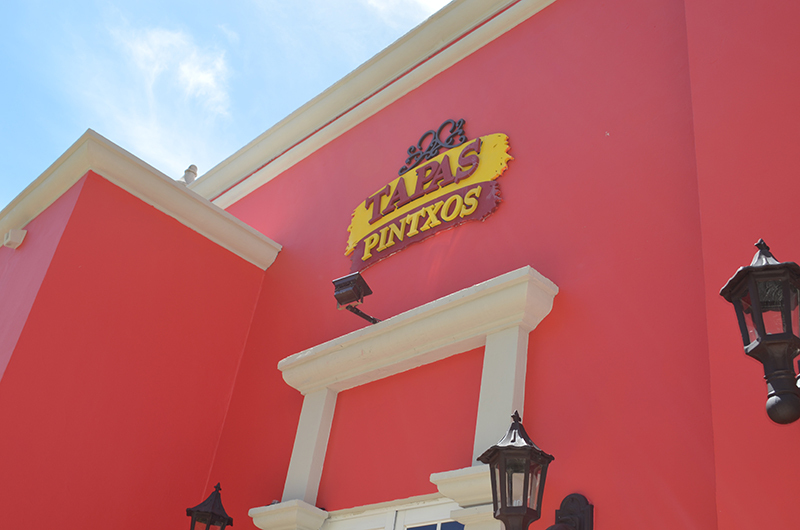 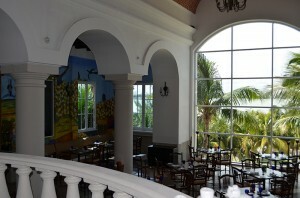 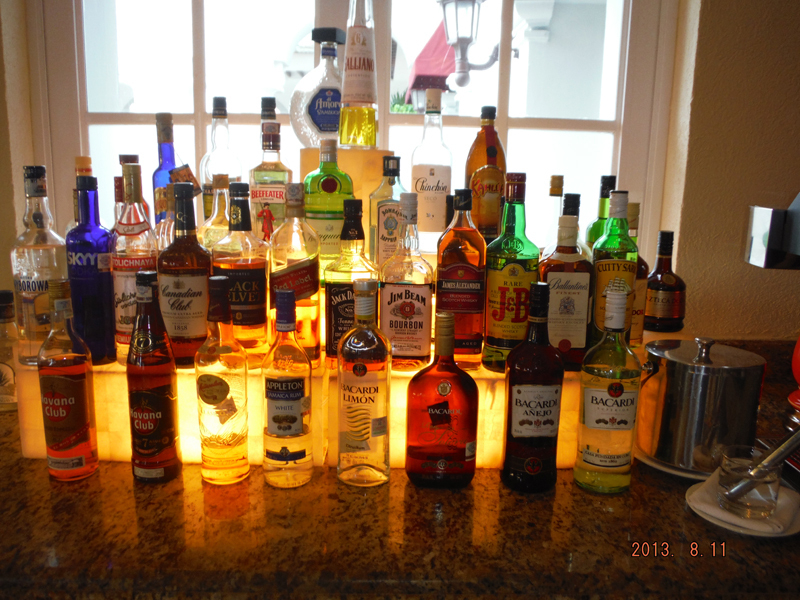 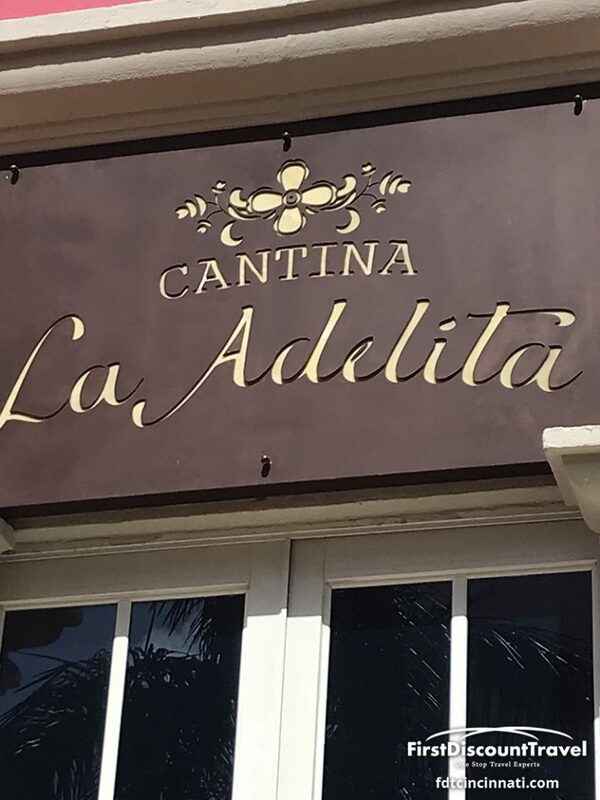 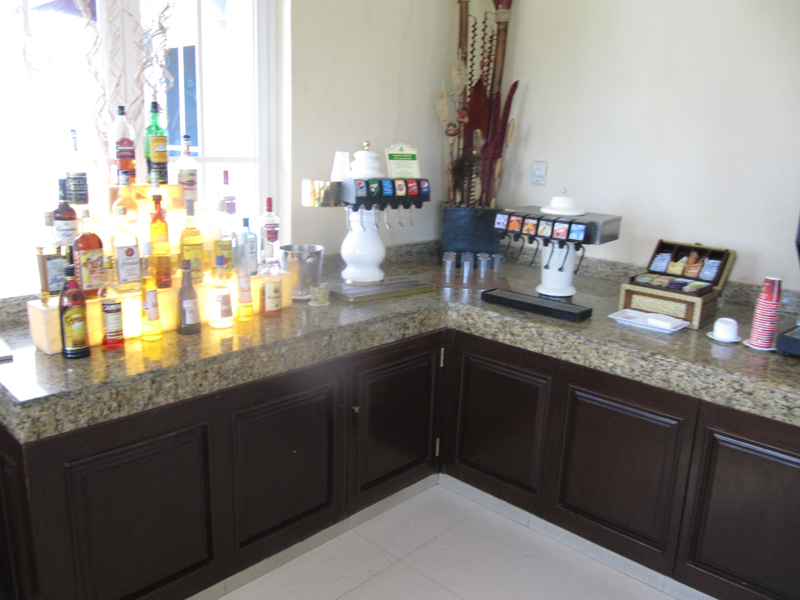 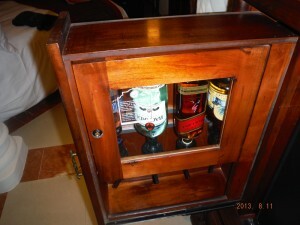 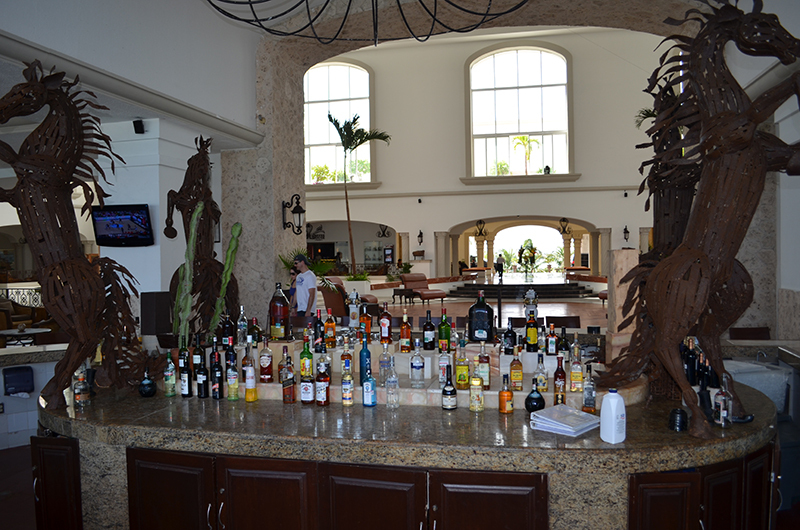 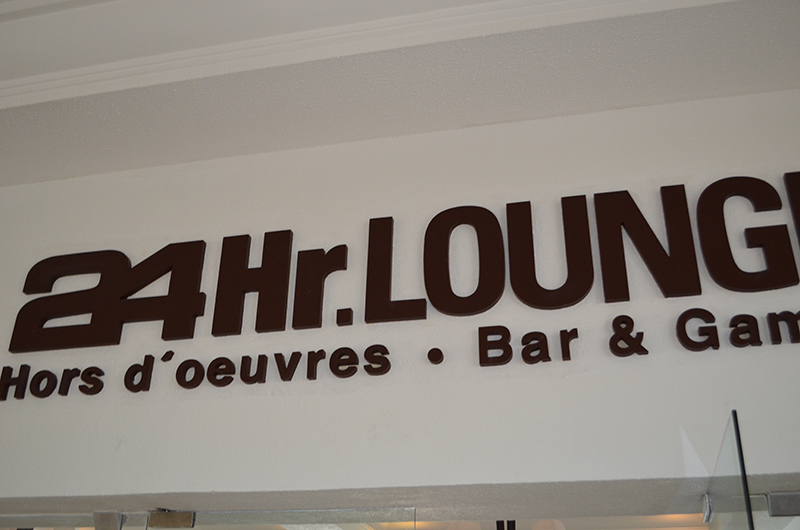 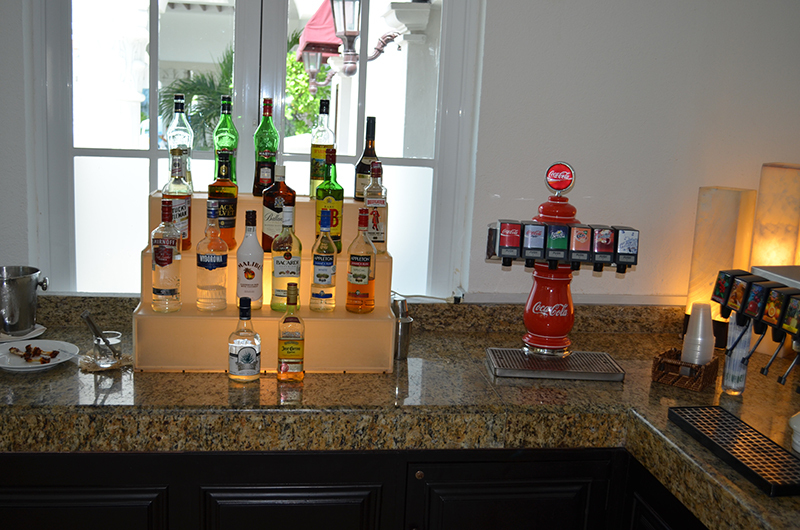 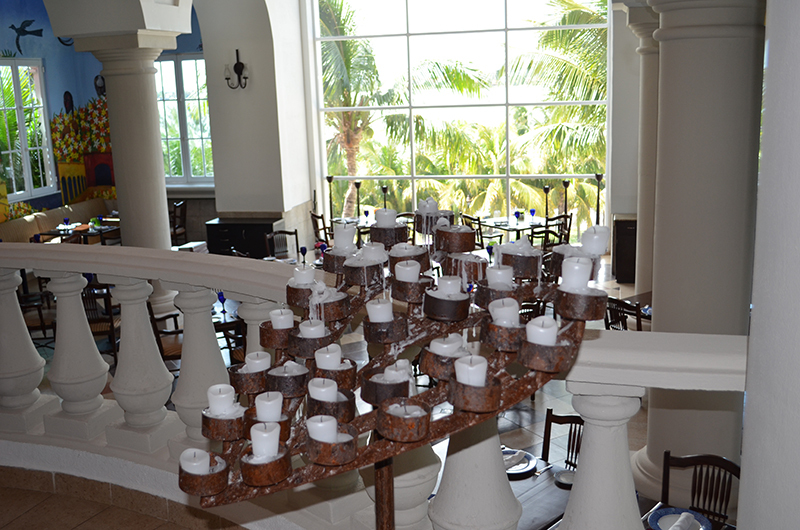 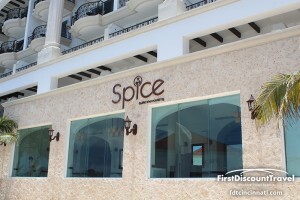 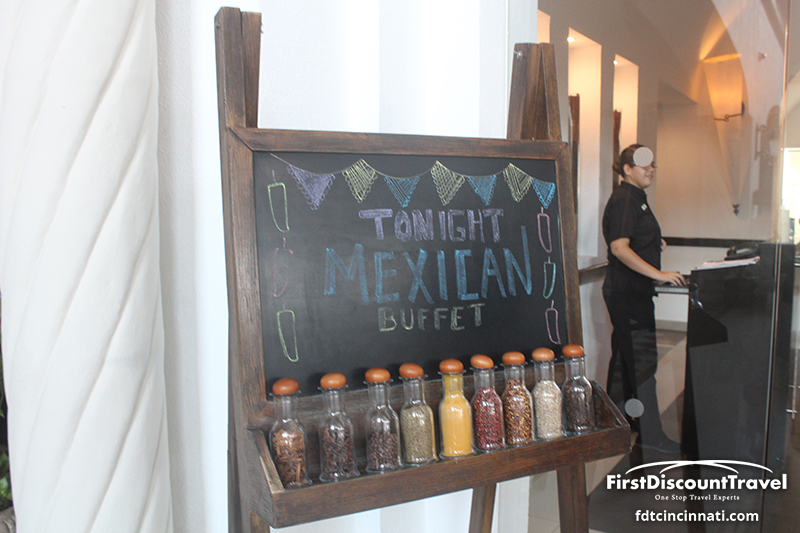 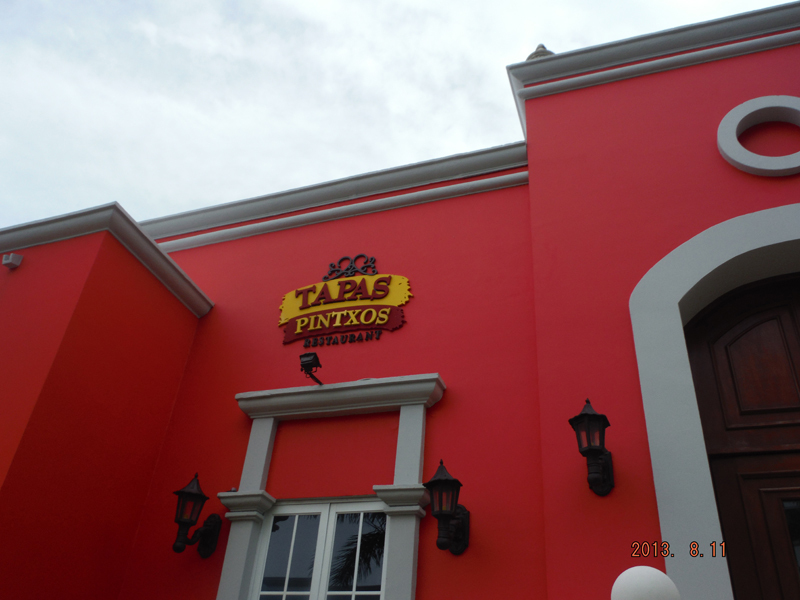 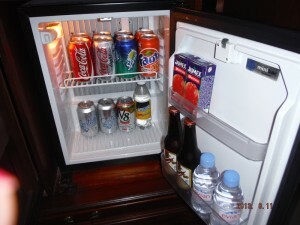 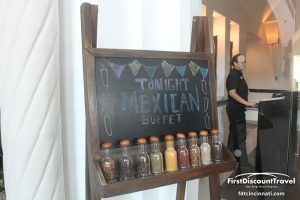 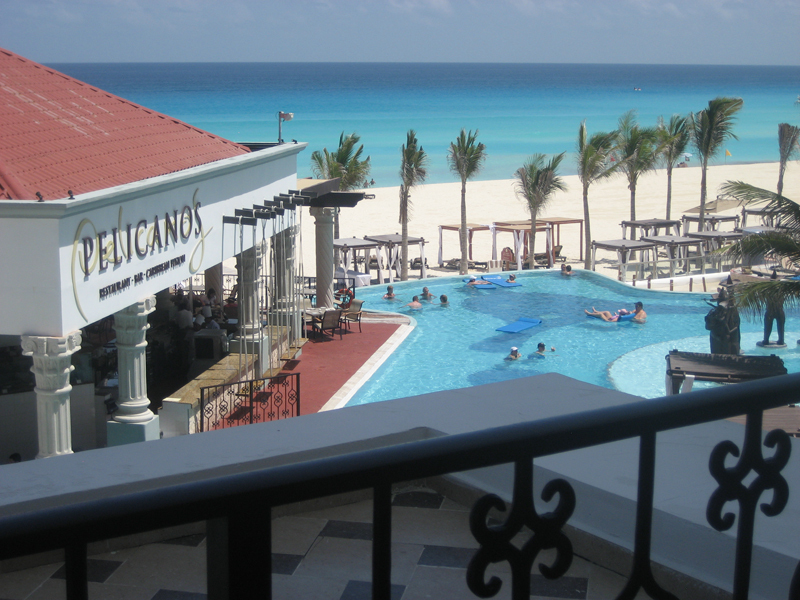 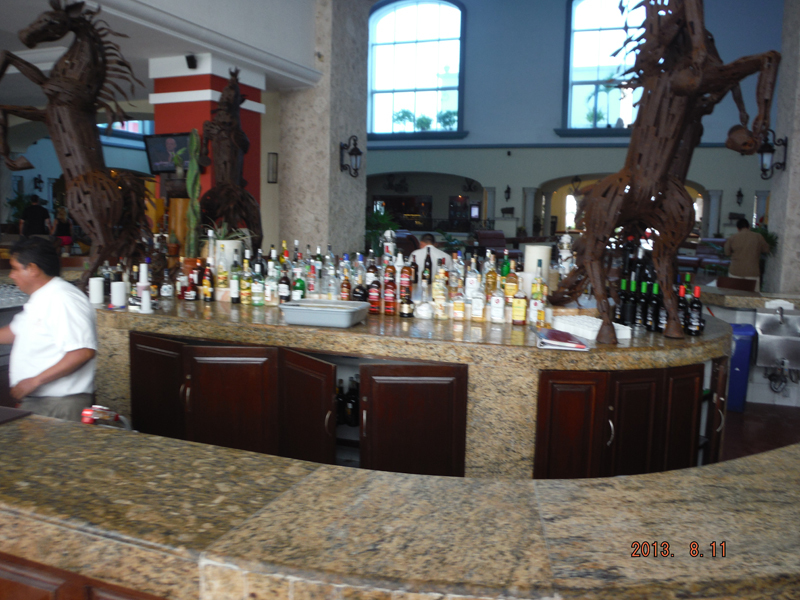 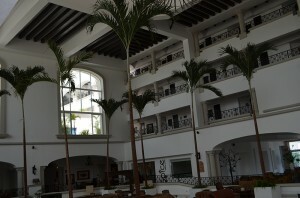 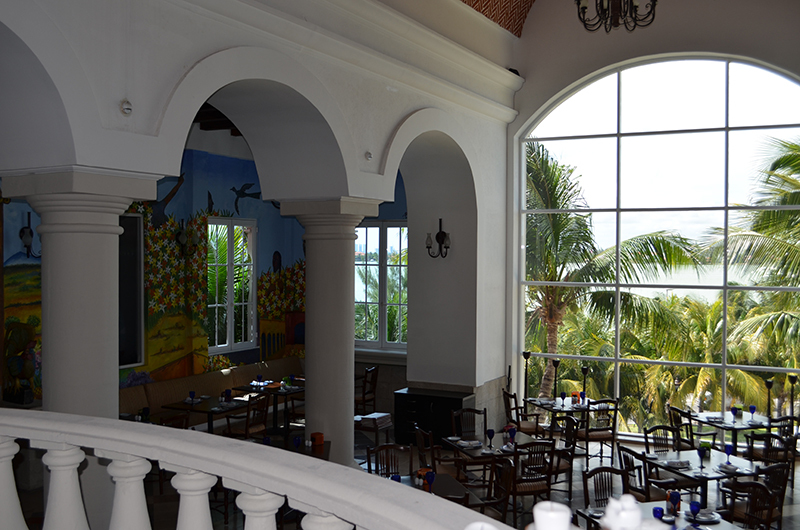 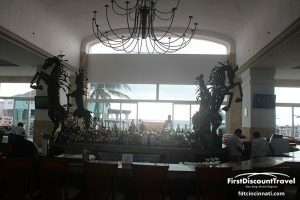 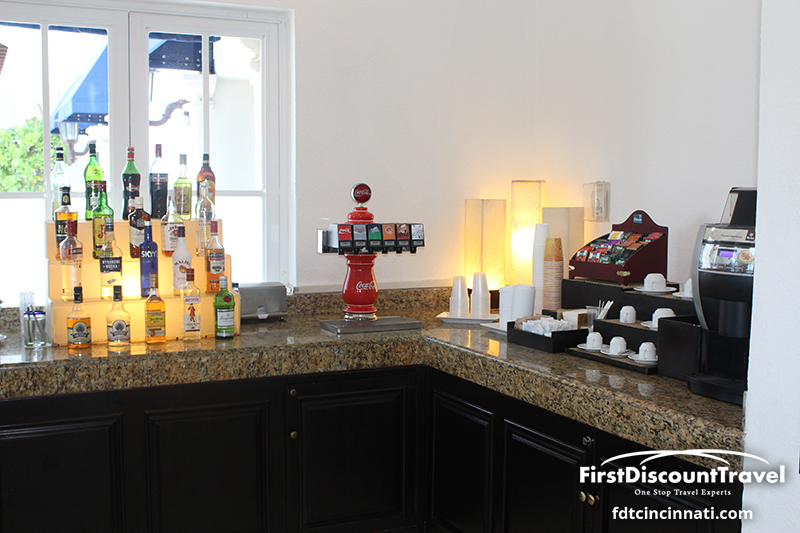 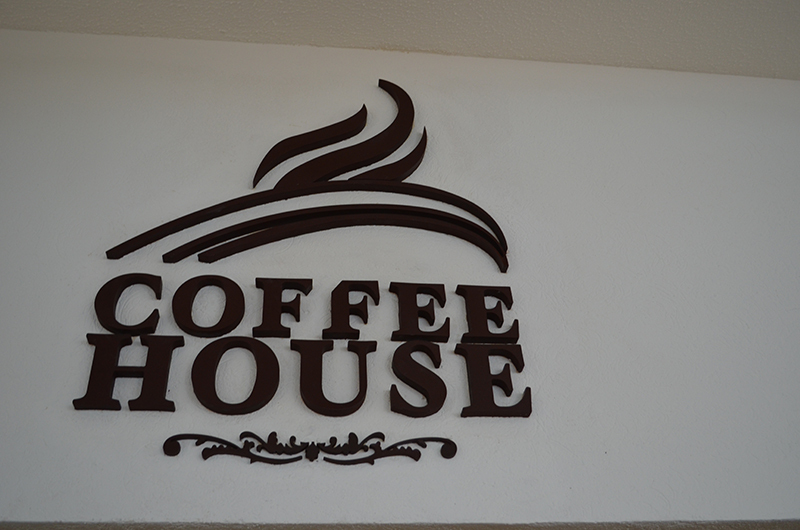 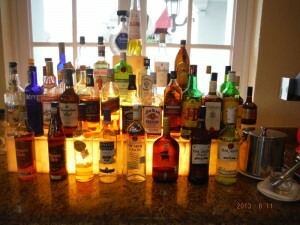 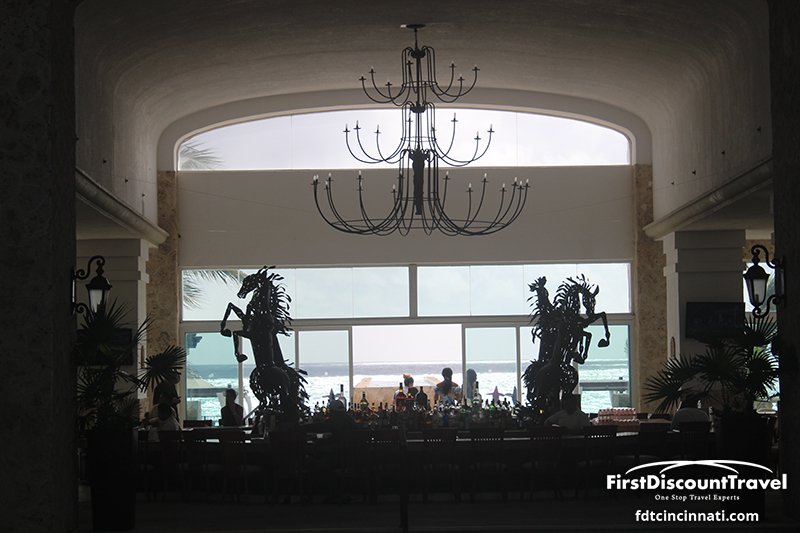 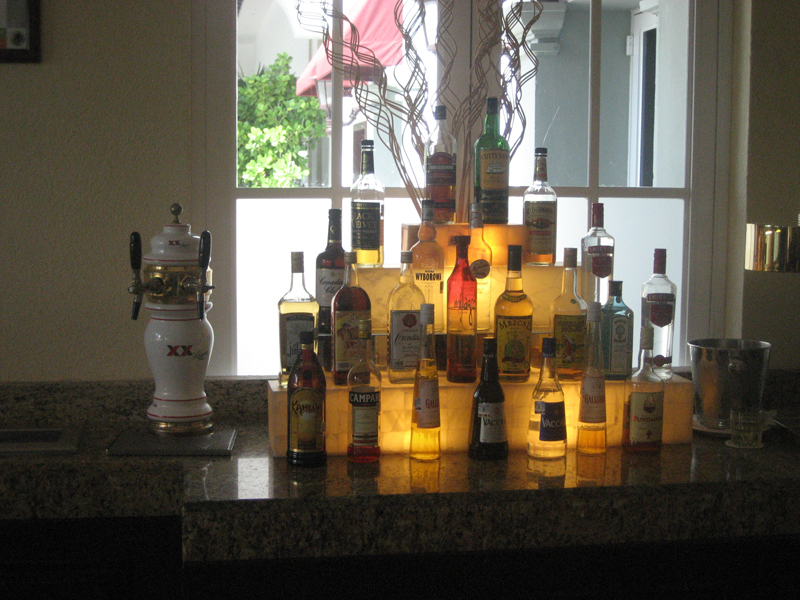 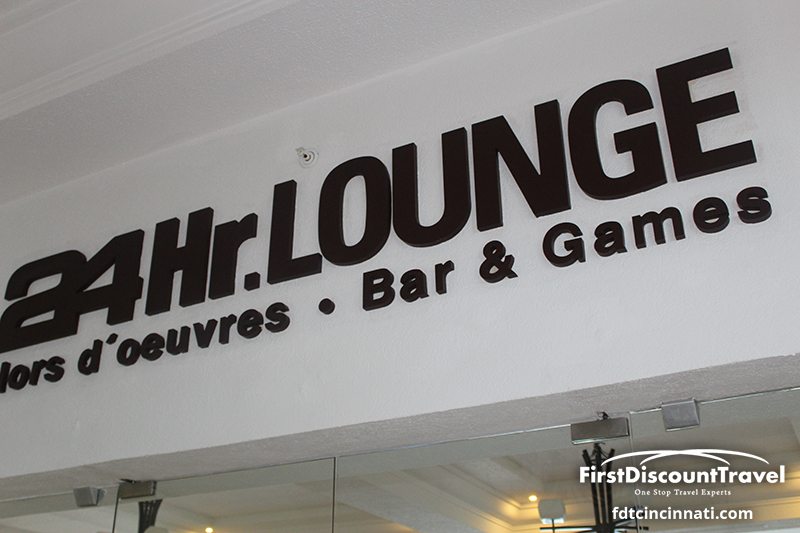 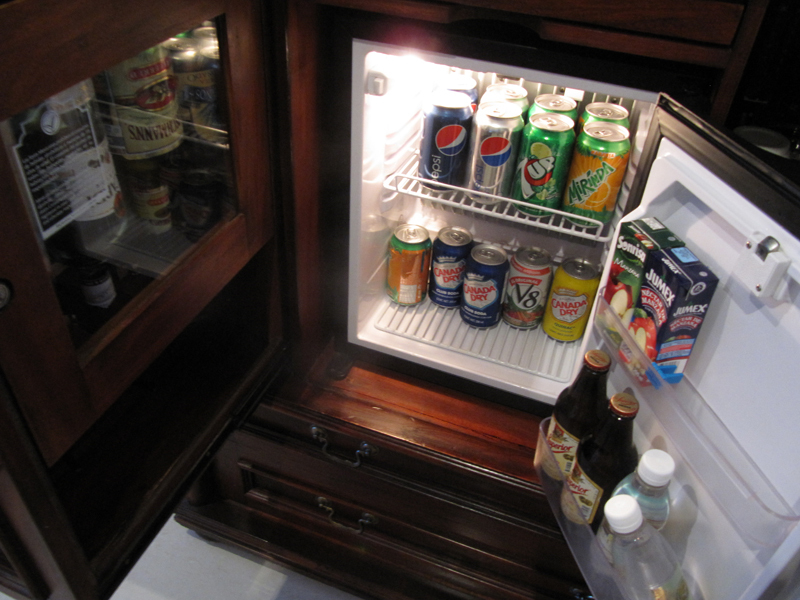 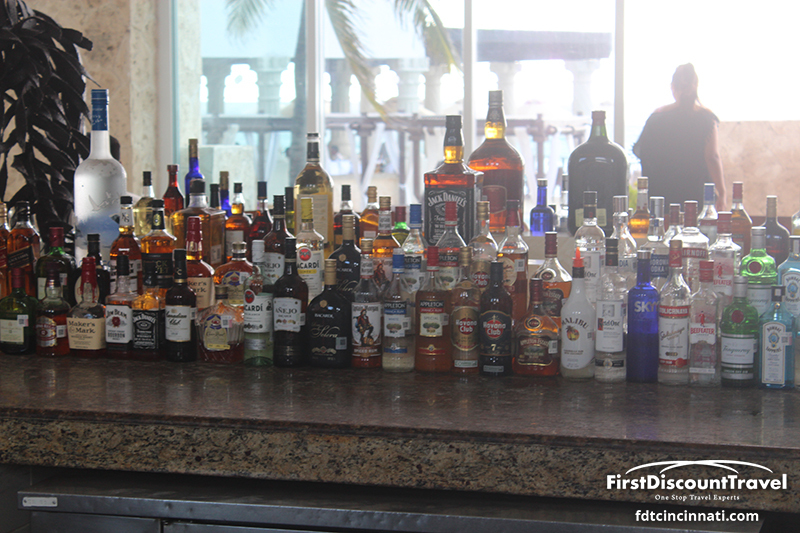 The resort serves all premium brand liquors and offers an assortment of Mexican beers in cans or draft. 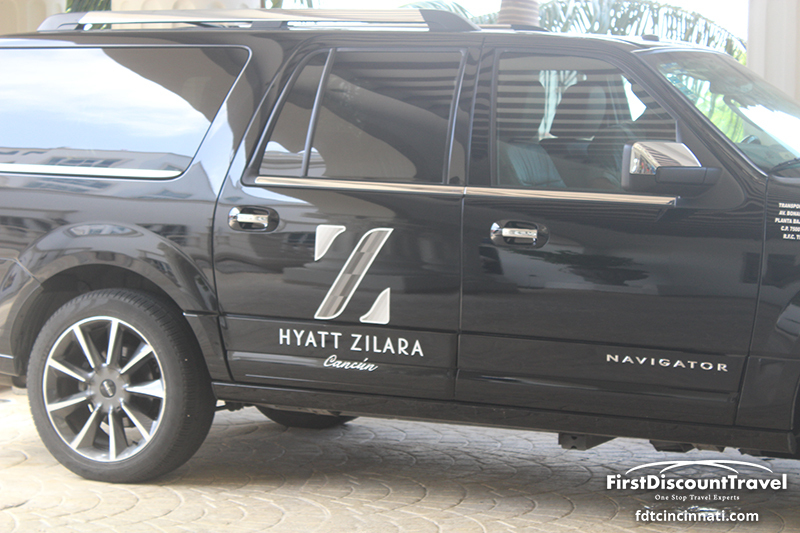 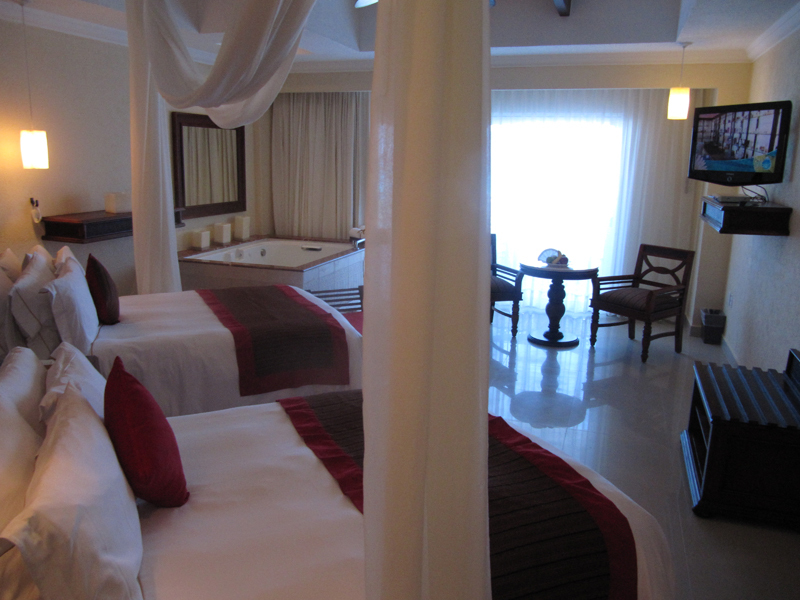 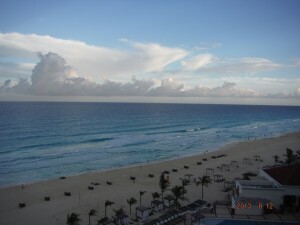 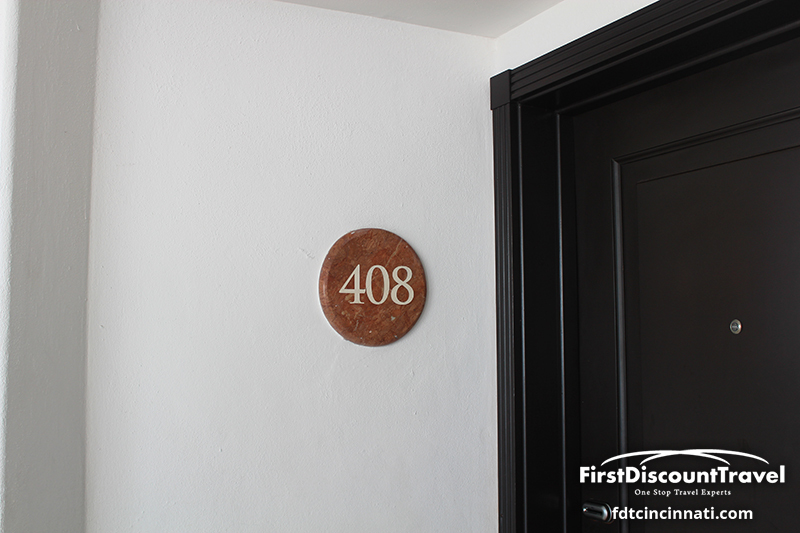 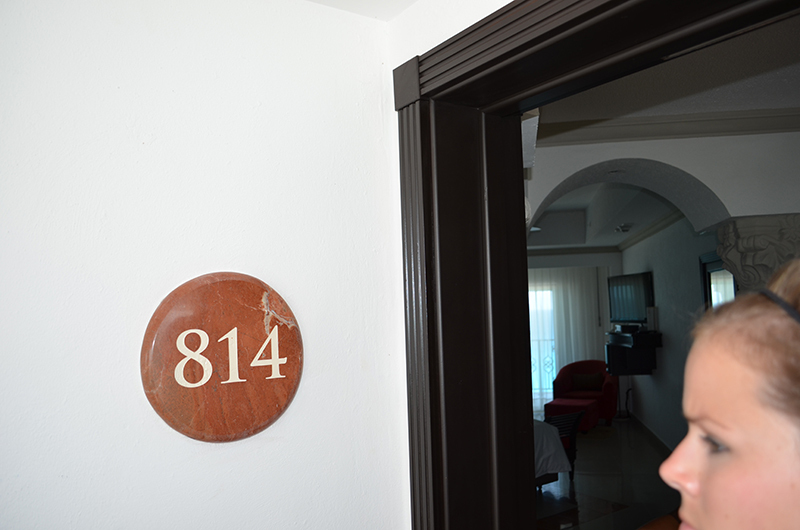 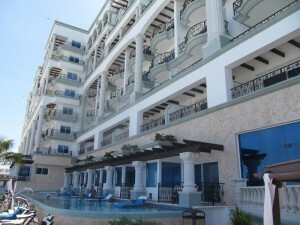 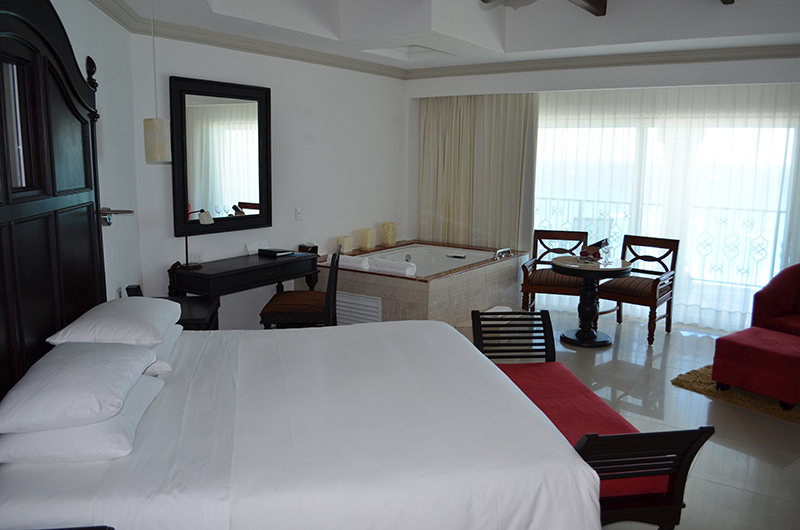 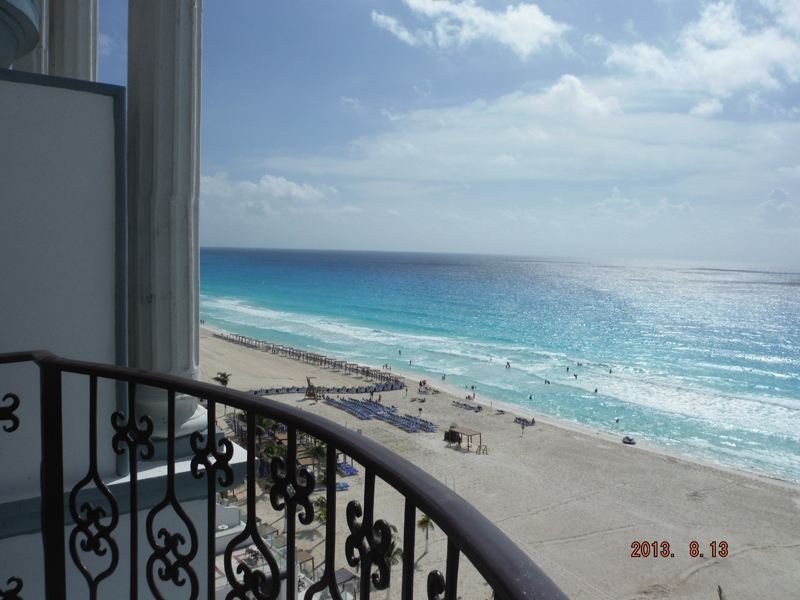 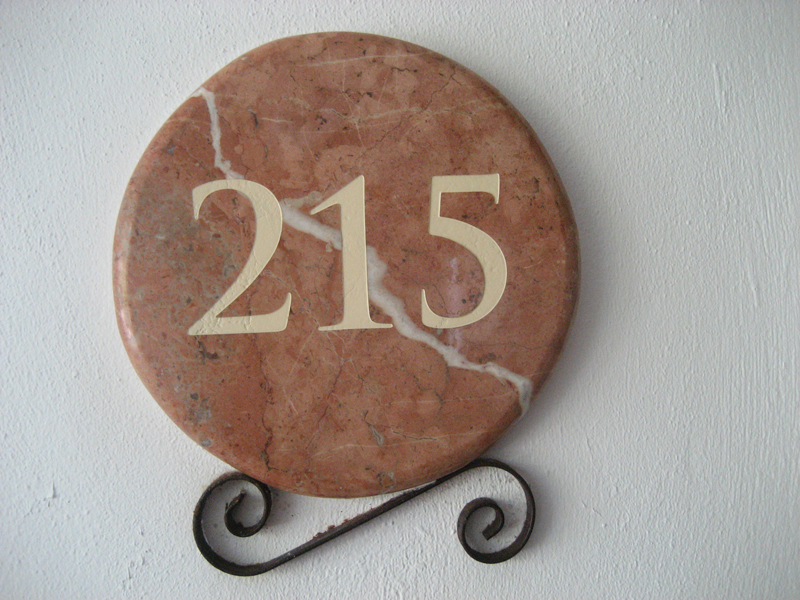 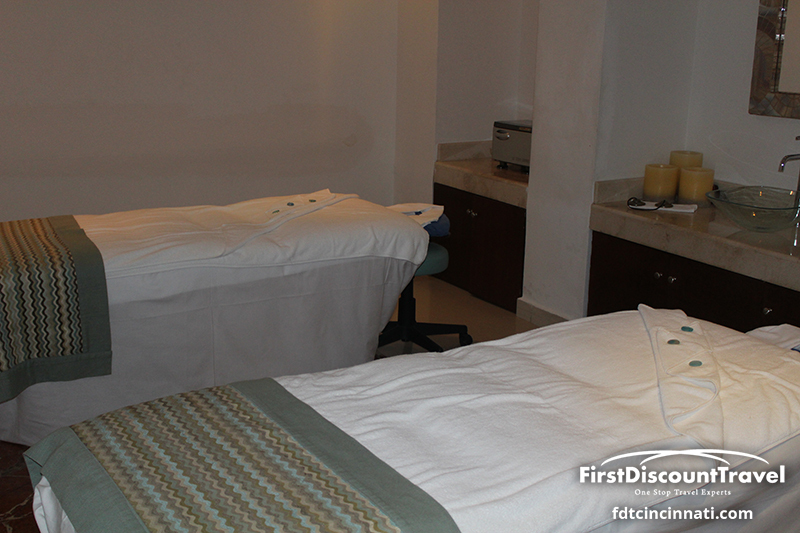 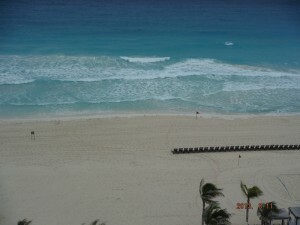 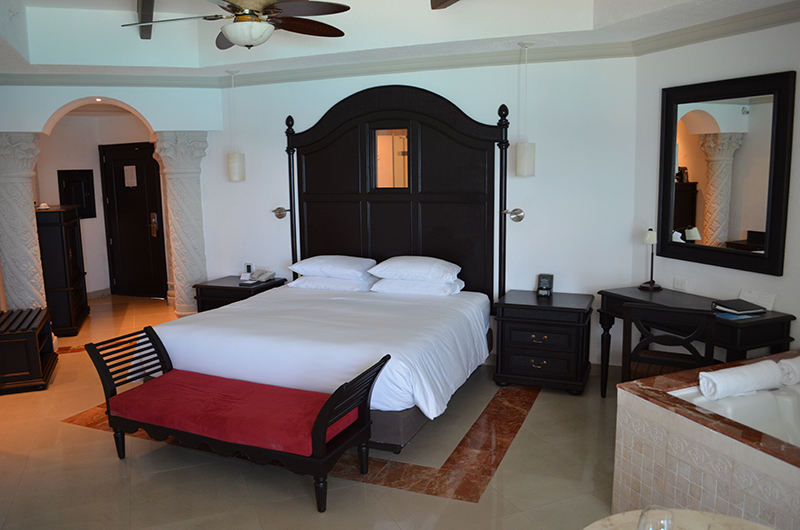 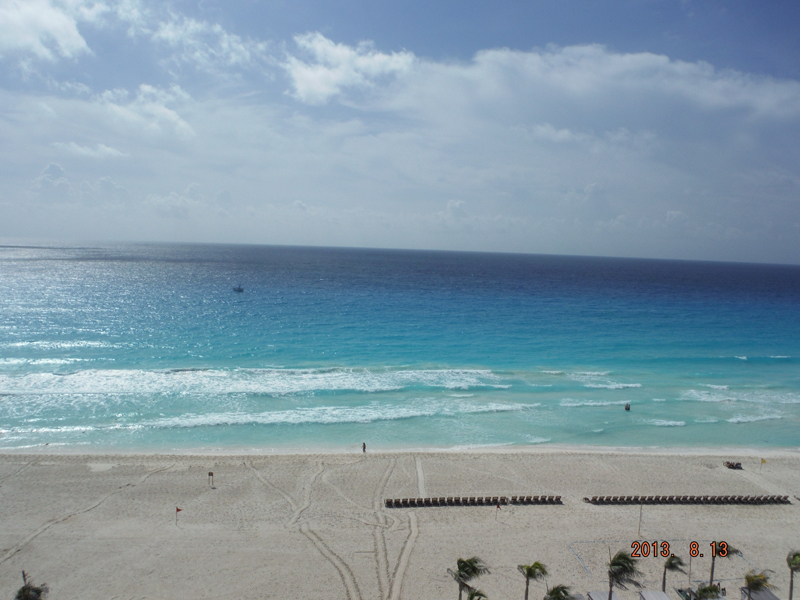 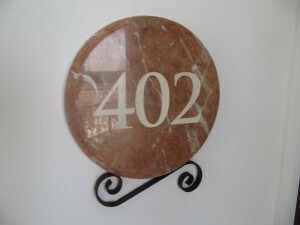 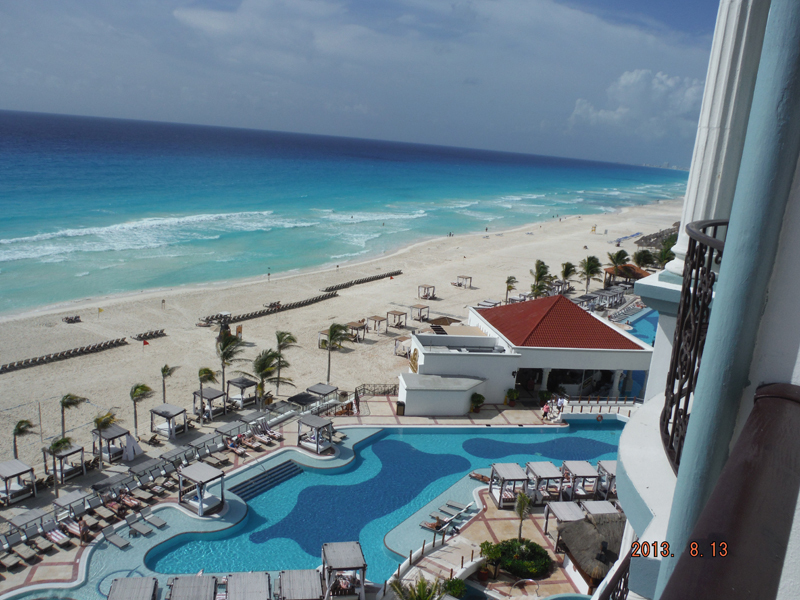 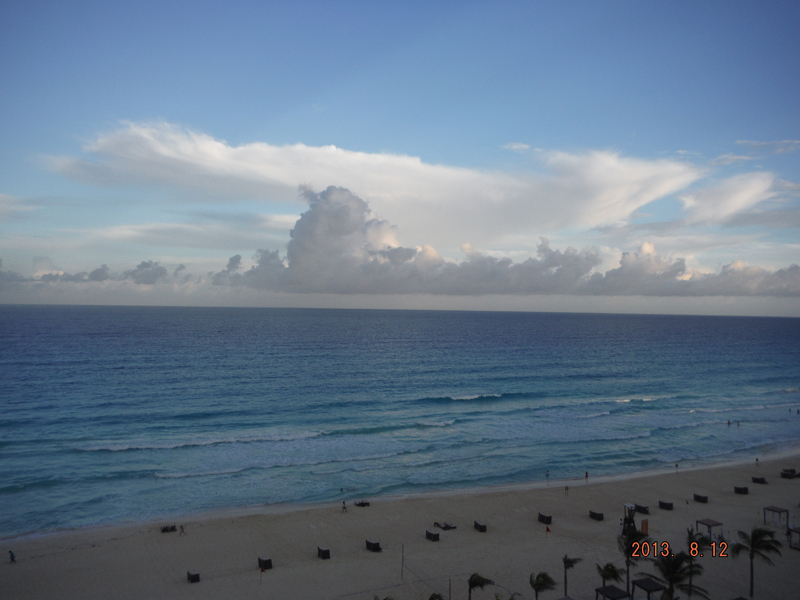 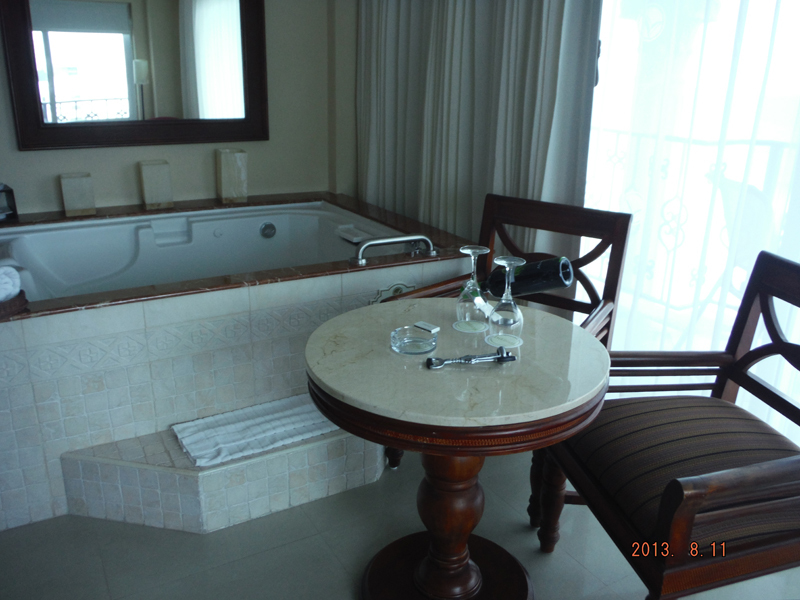 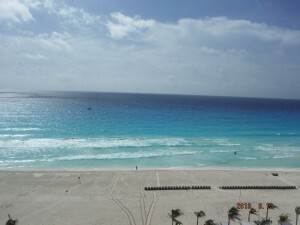 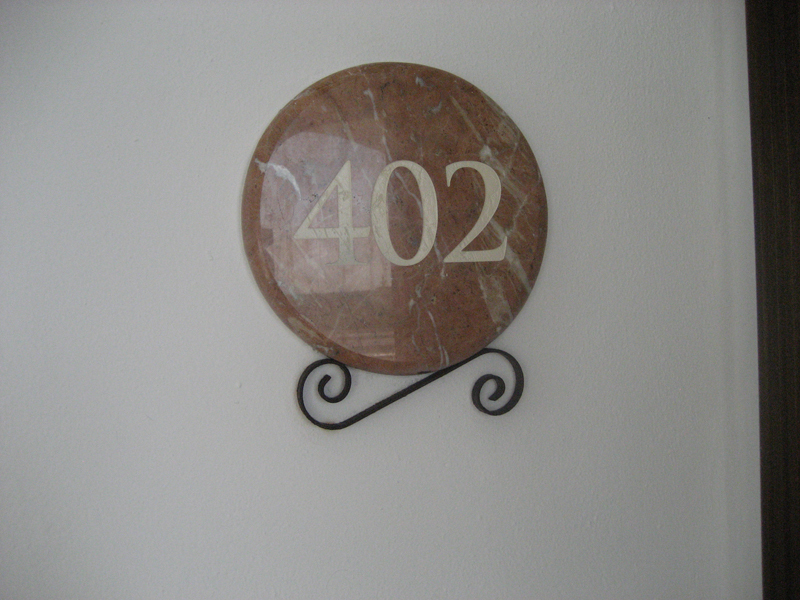 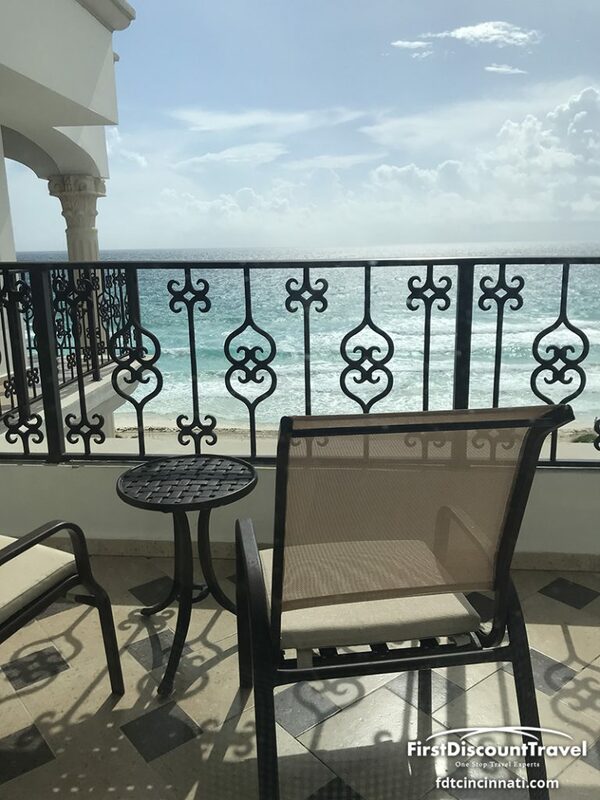 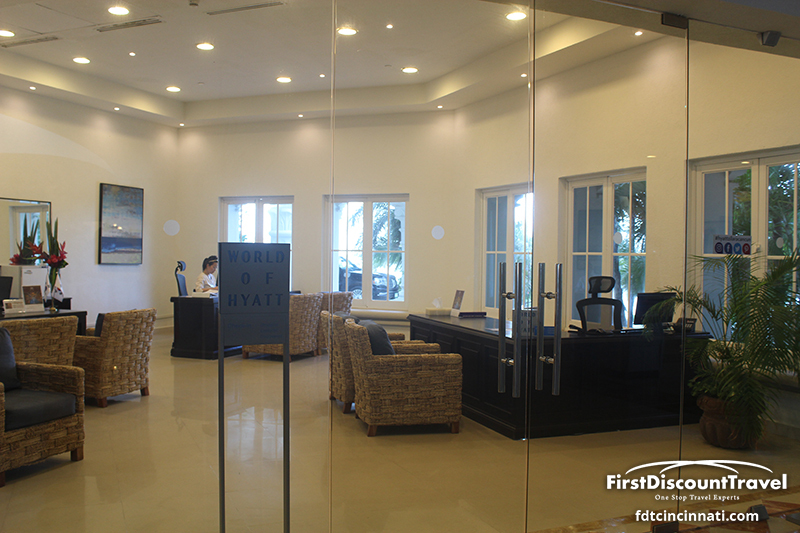 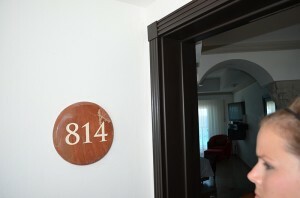 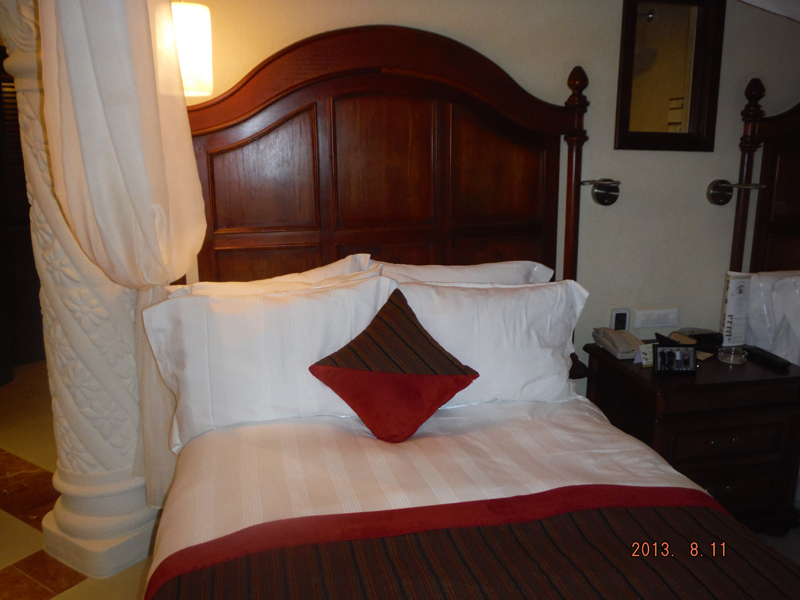 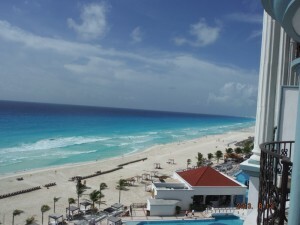 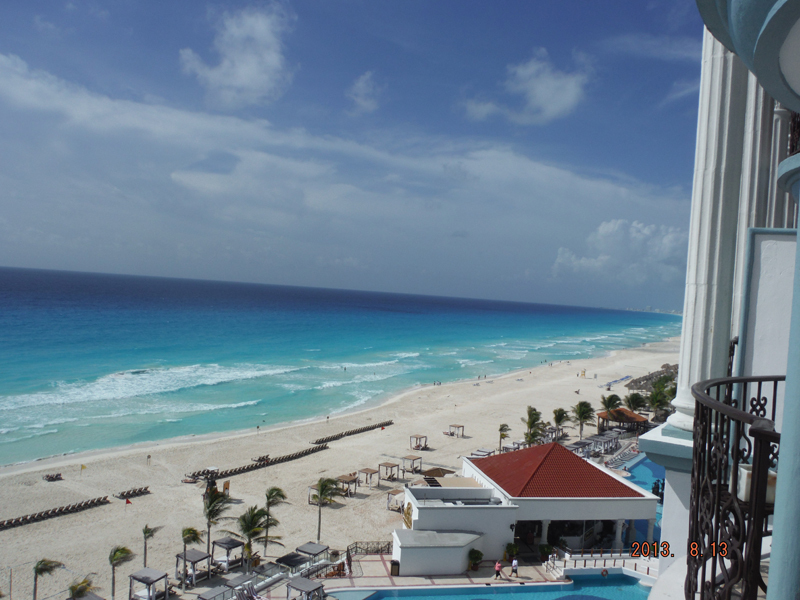 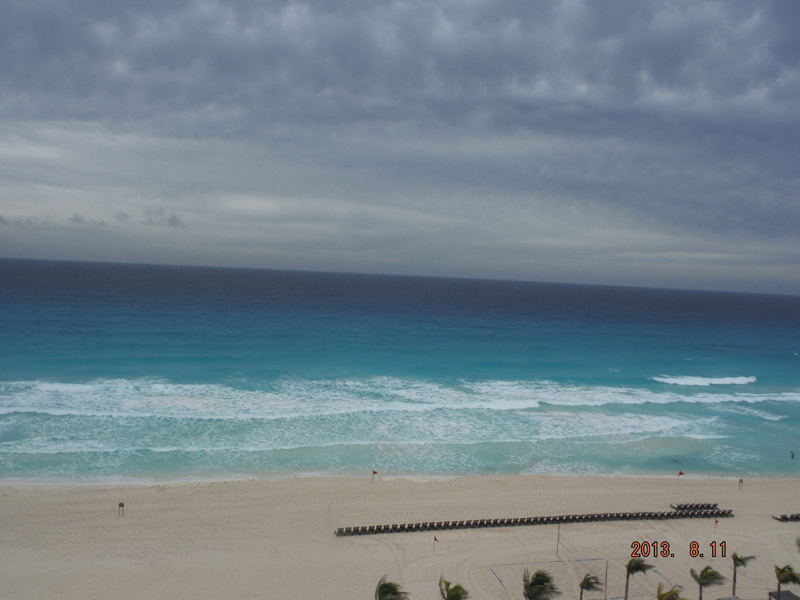 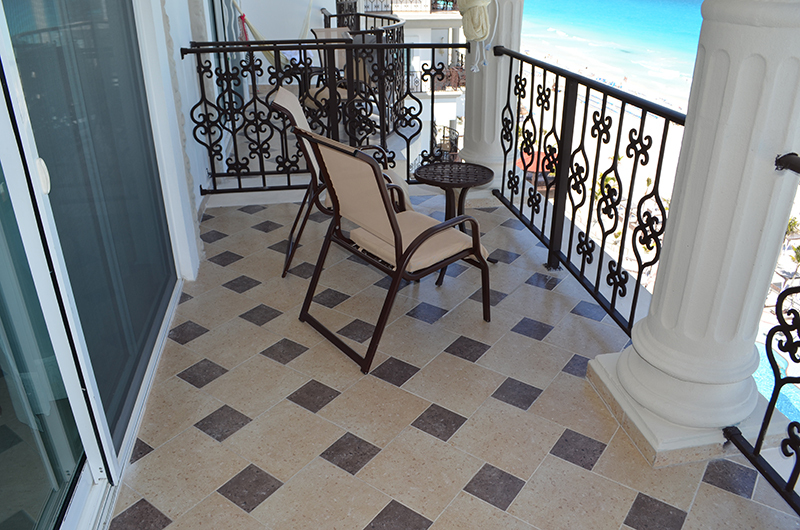 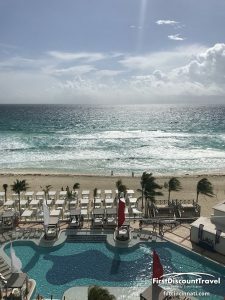 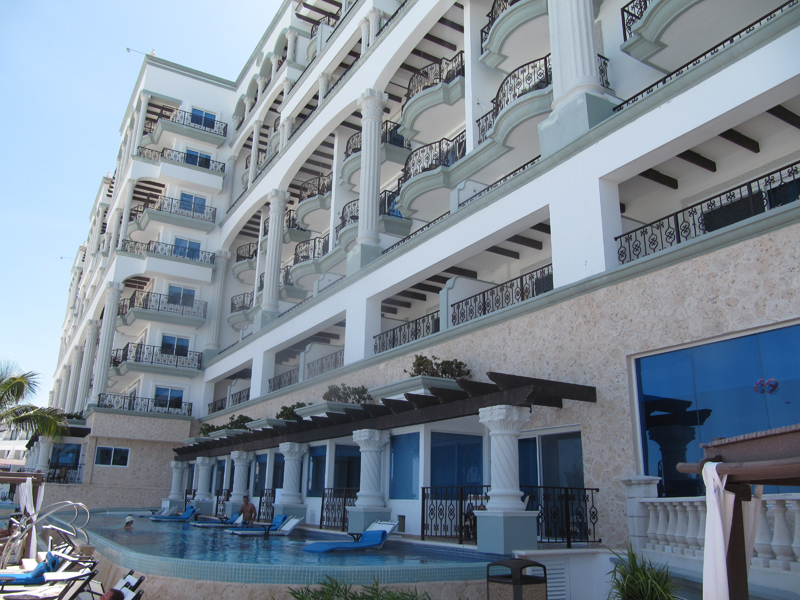 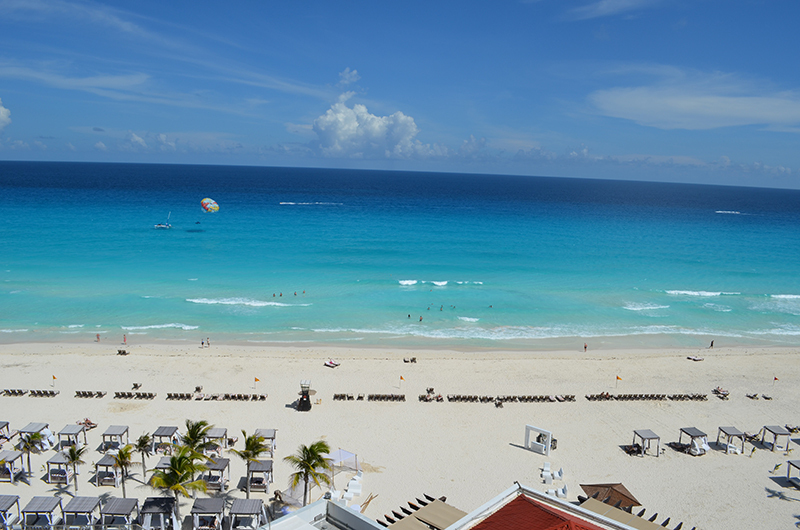 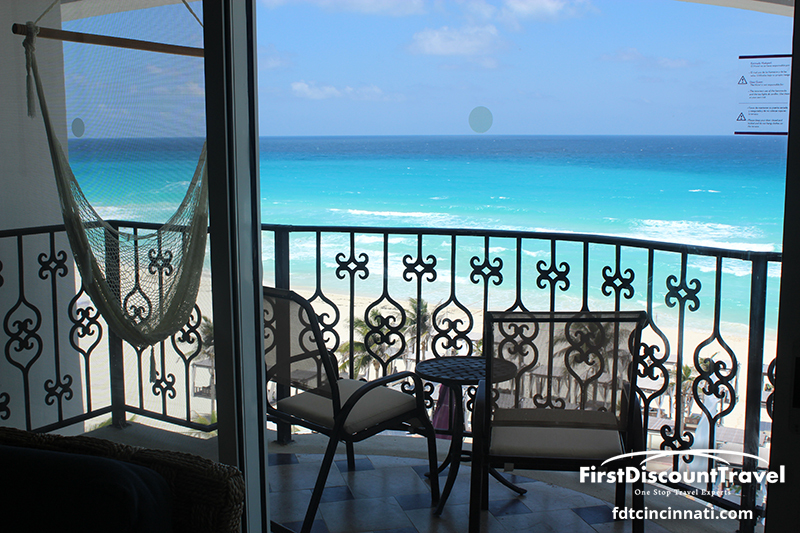 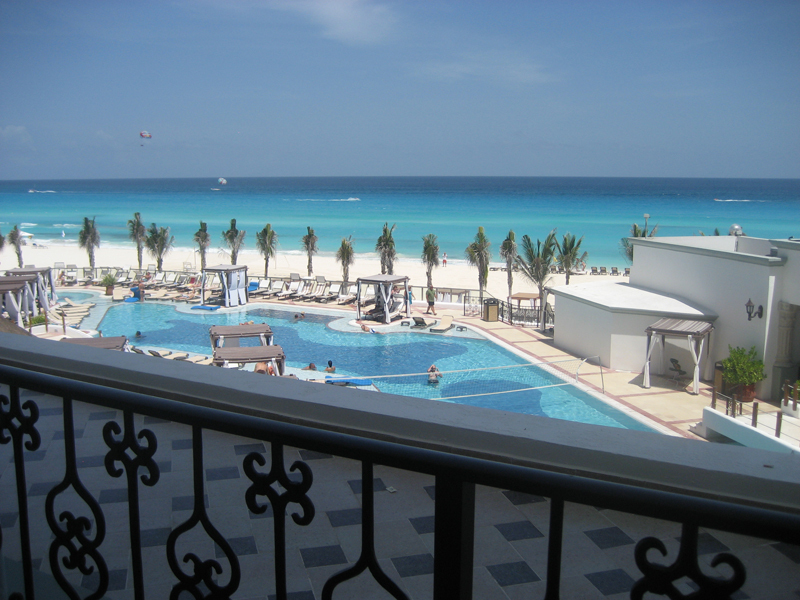 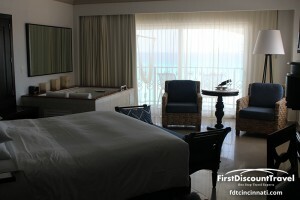 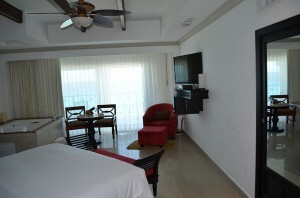 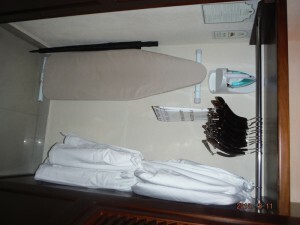 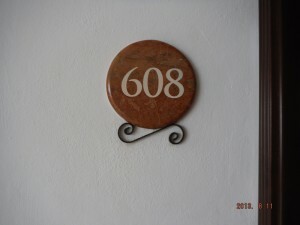 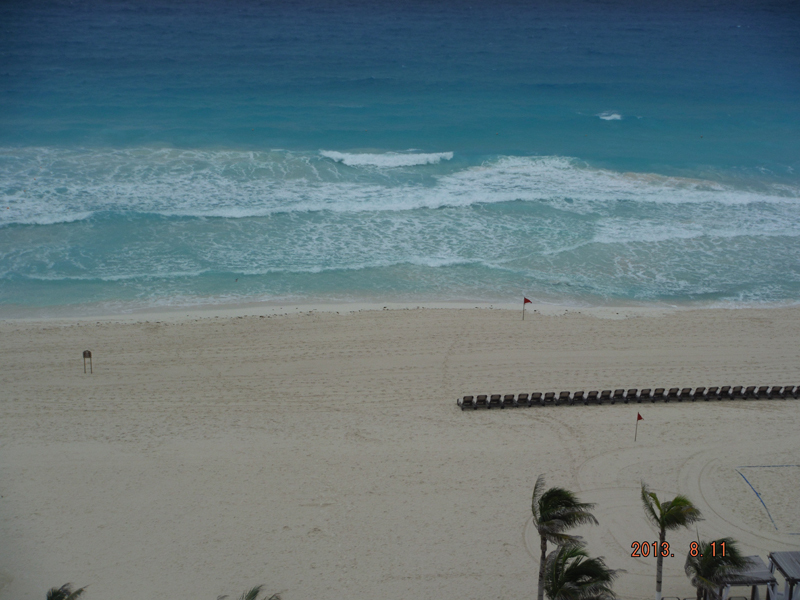 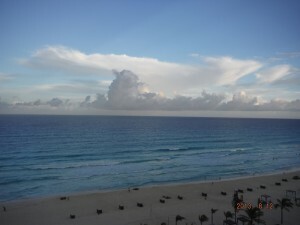 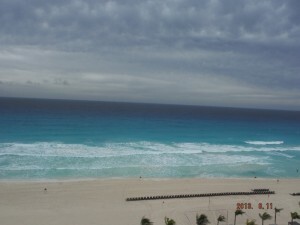 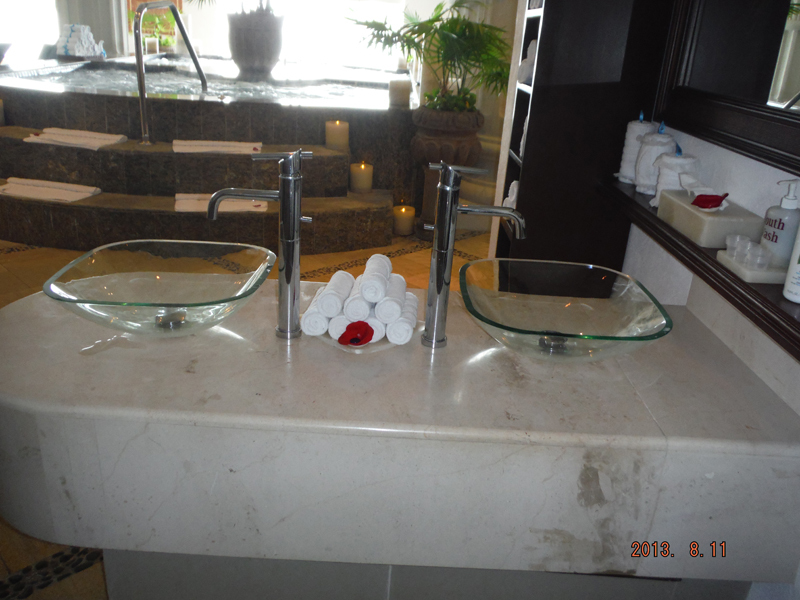 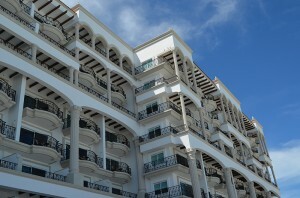 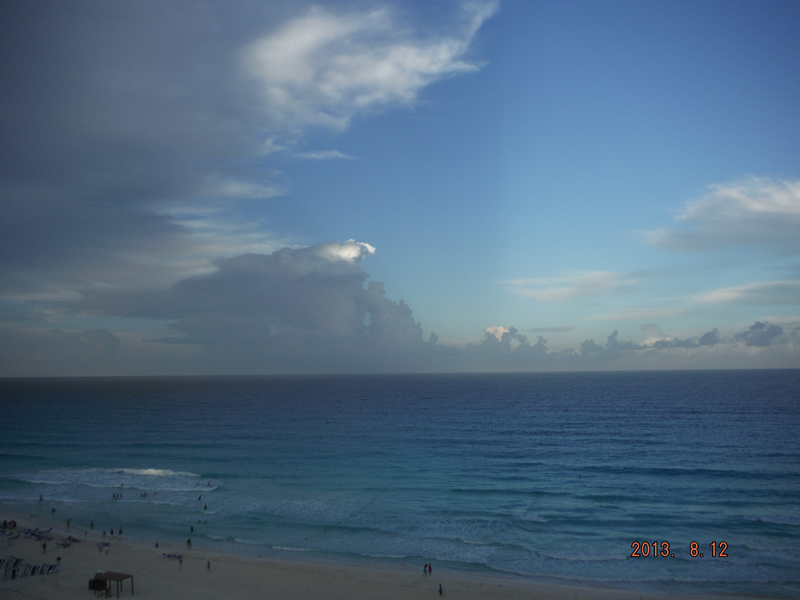 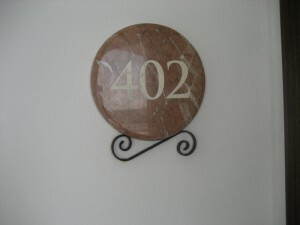 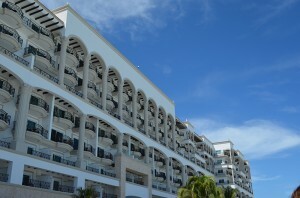 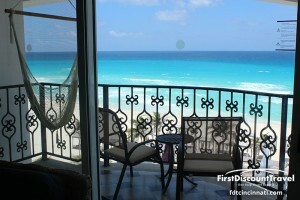 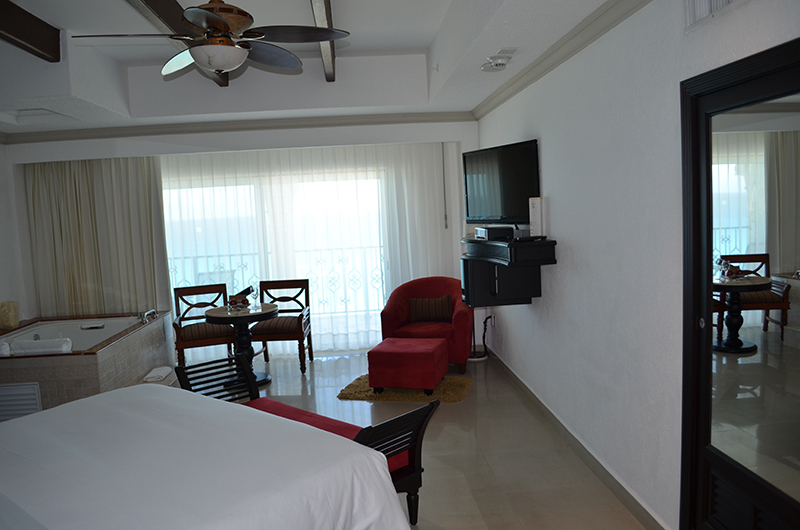 The rooms are all junior suites and all offer an ocean view (lower floors) or oceanfront view (higher floors). 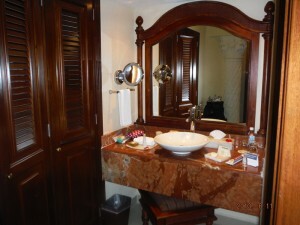 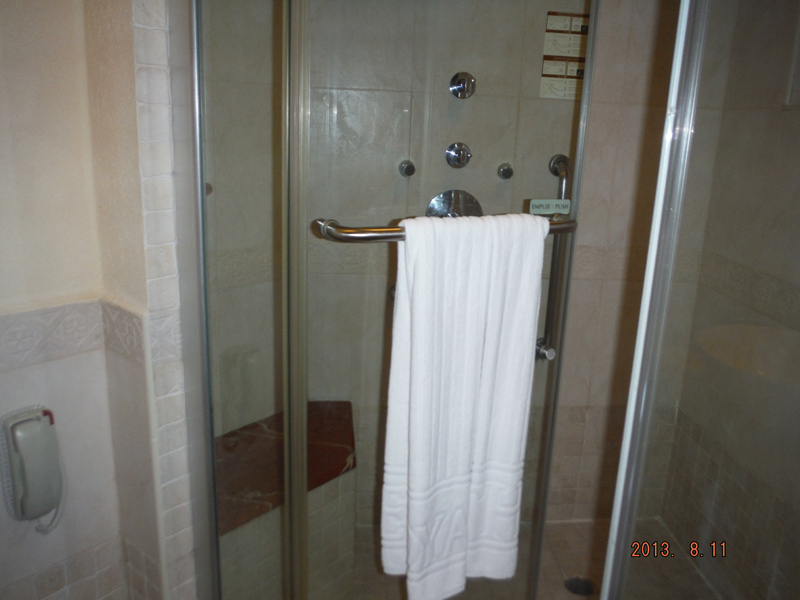 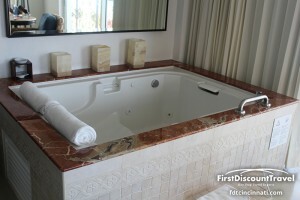 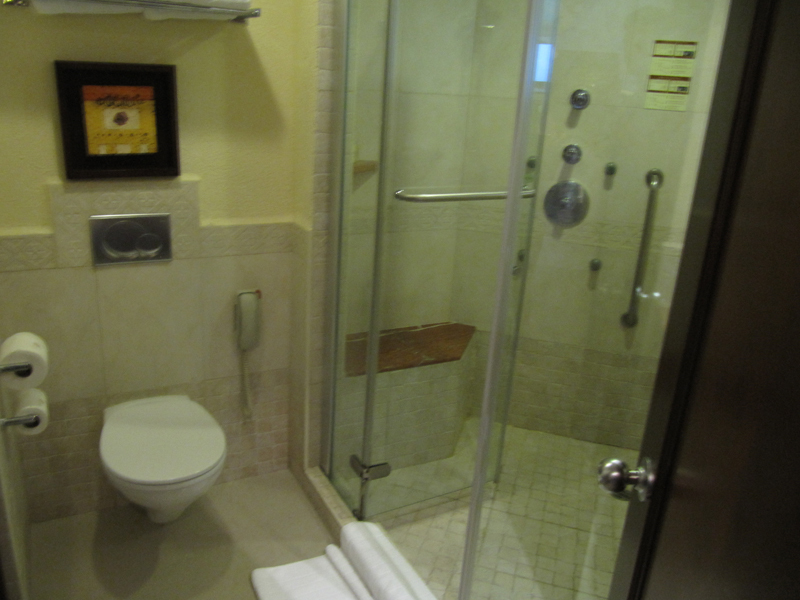 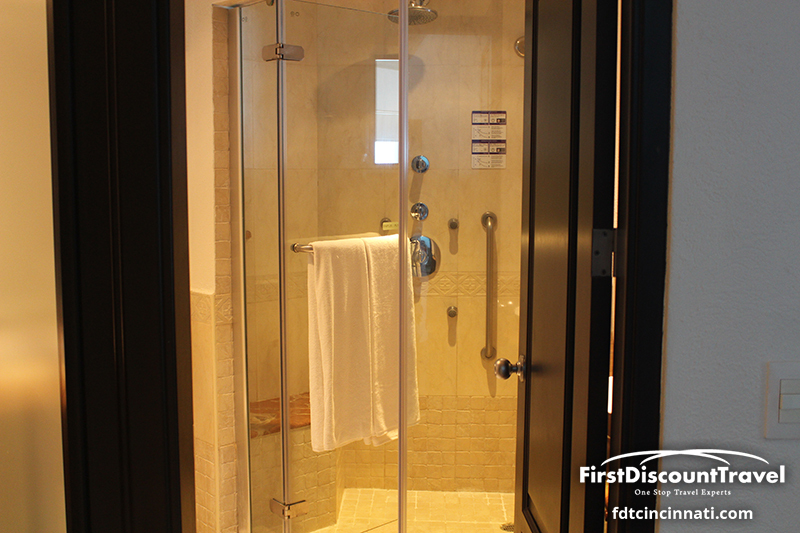 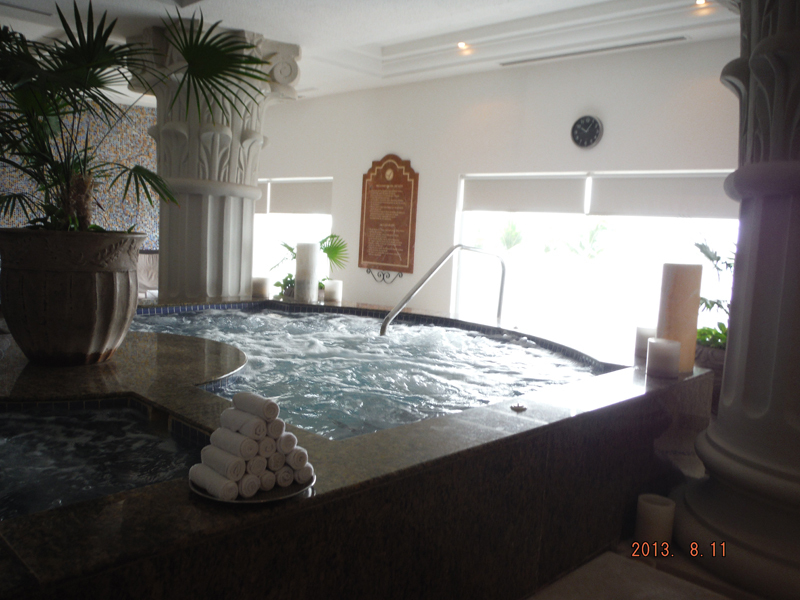 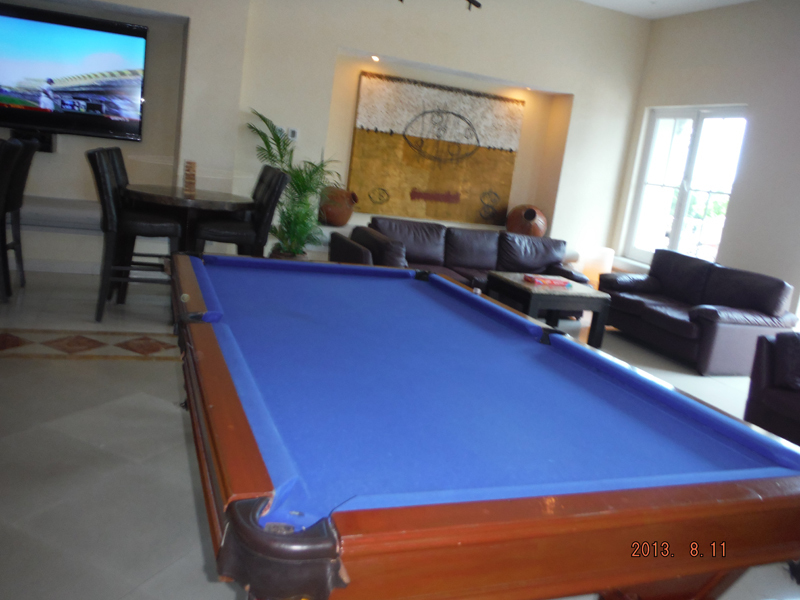 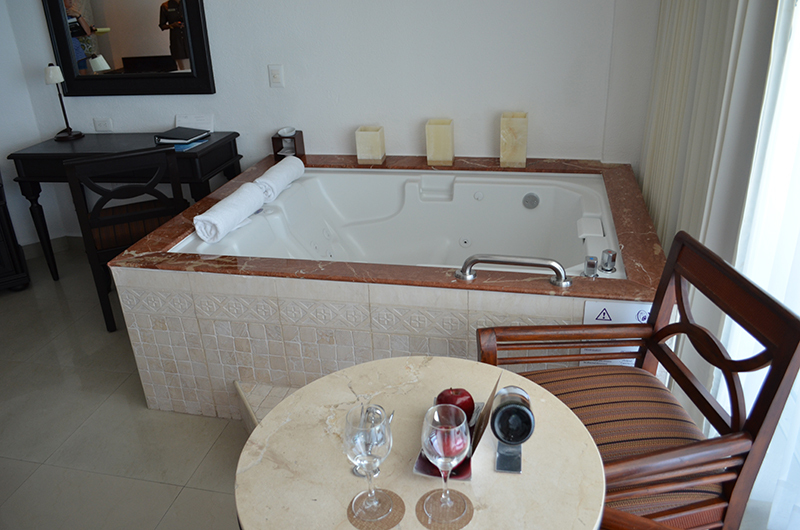 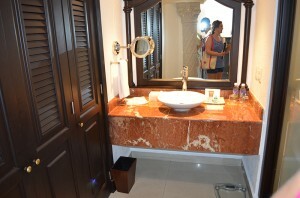 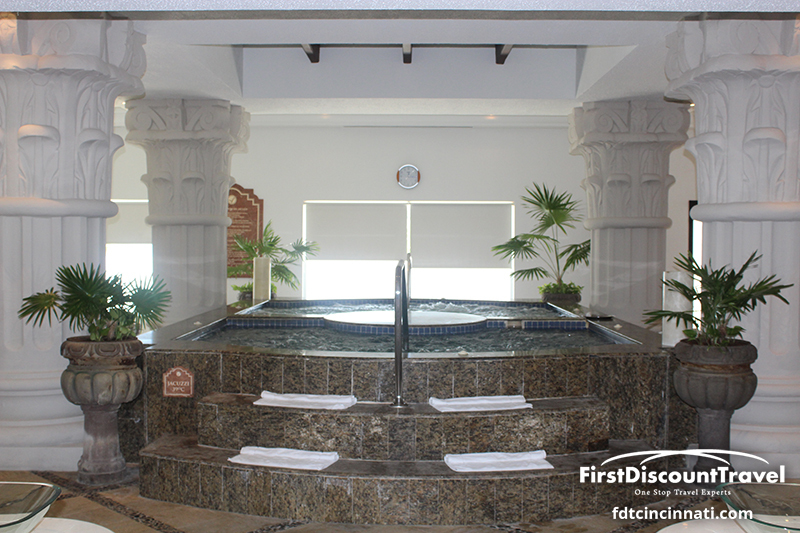 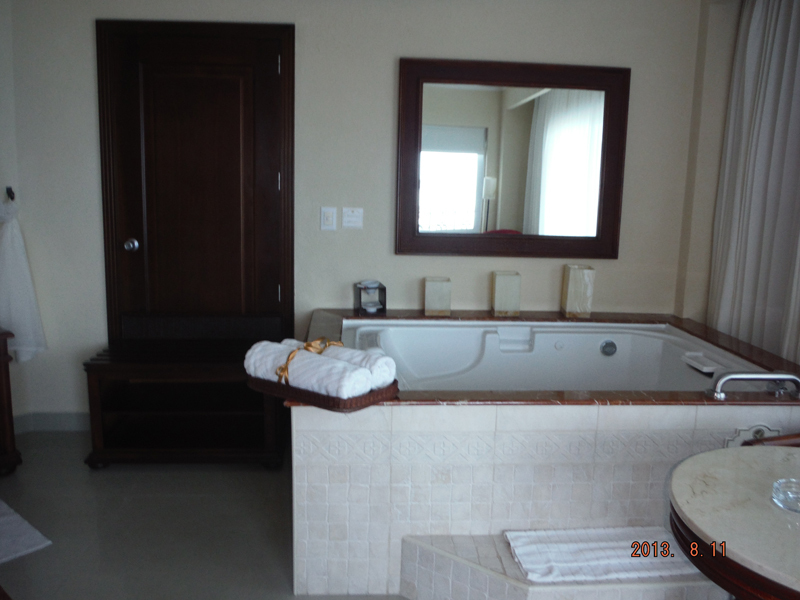 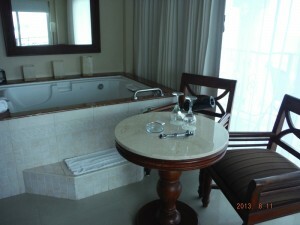 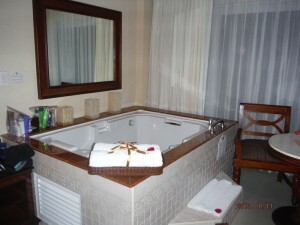 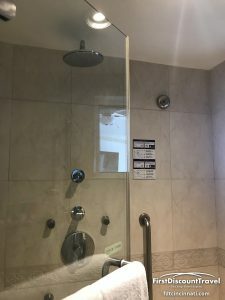 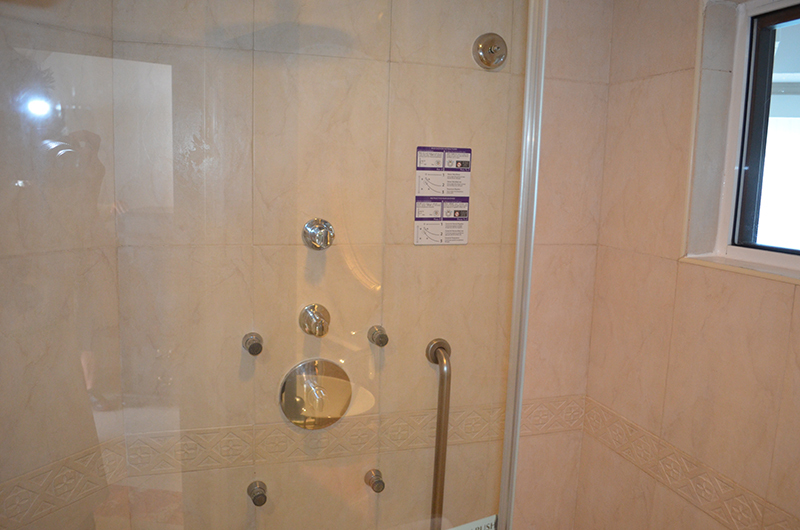 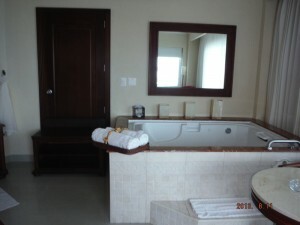 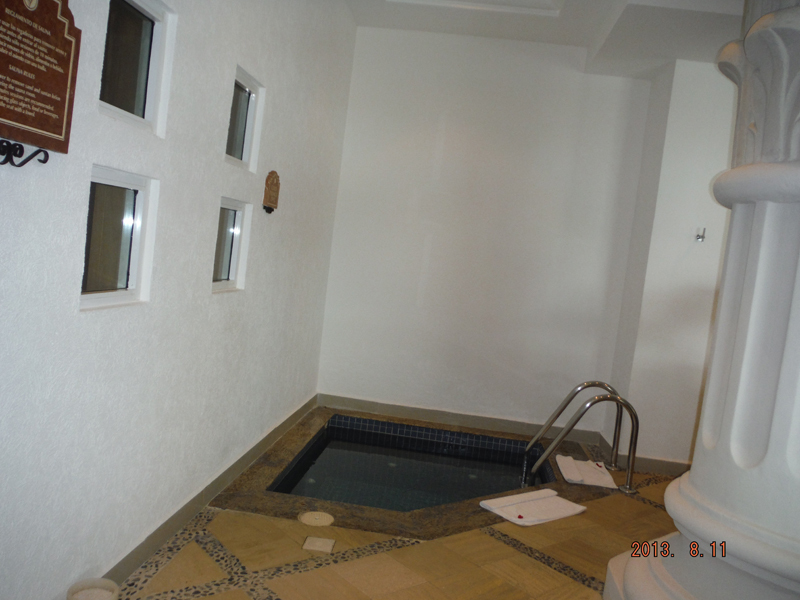 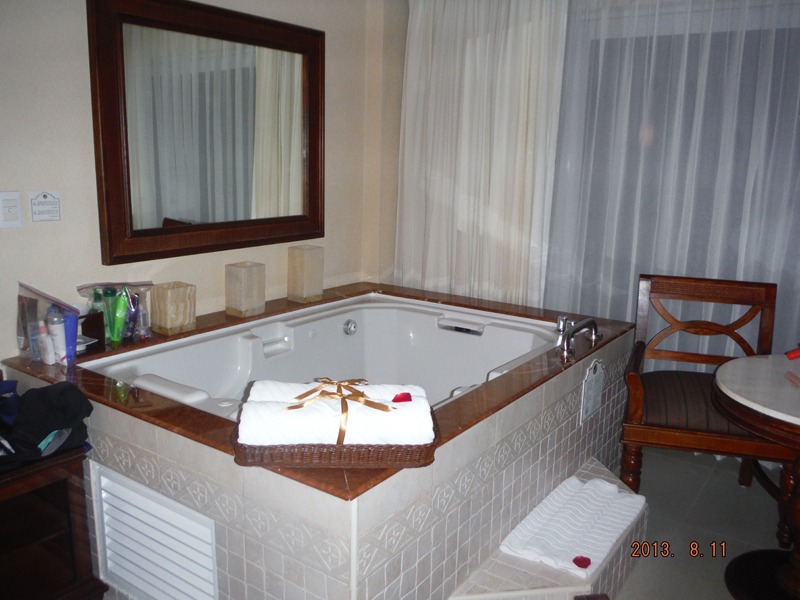 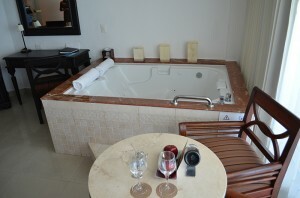 The rooms are about 600 square feet with a large Jacuzzi in the living room area. 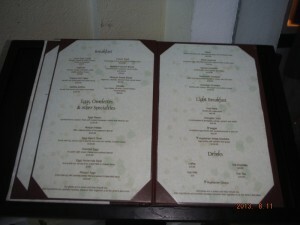 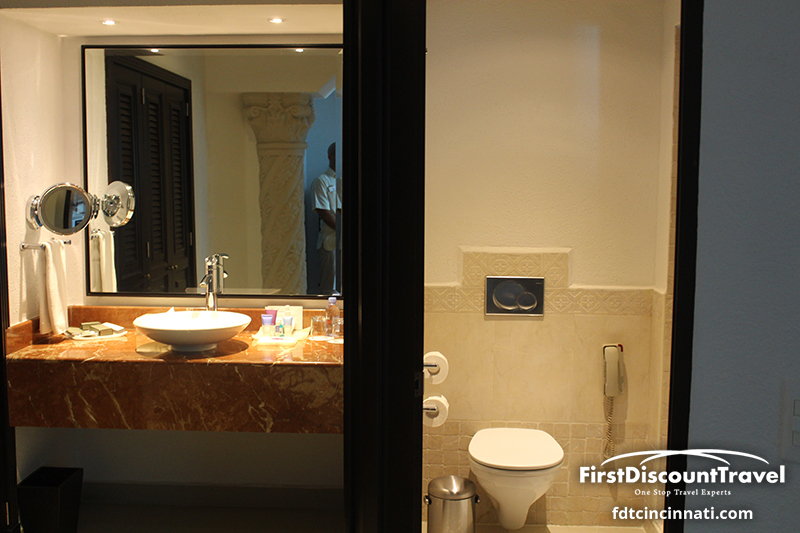 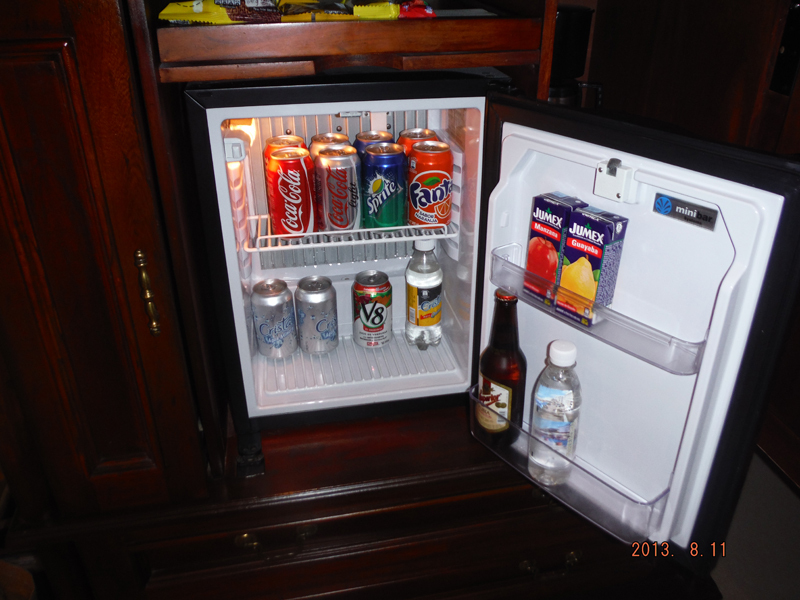 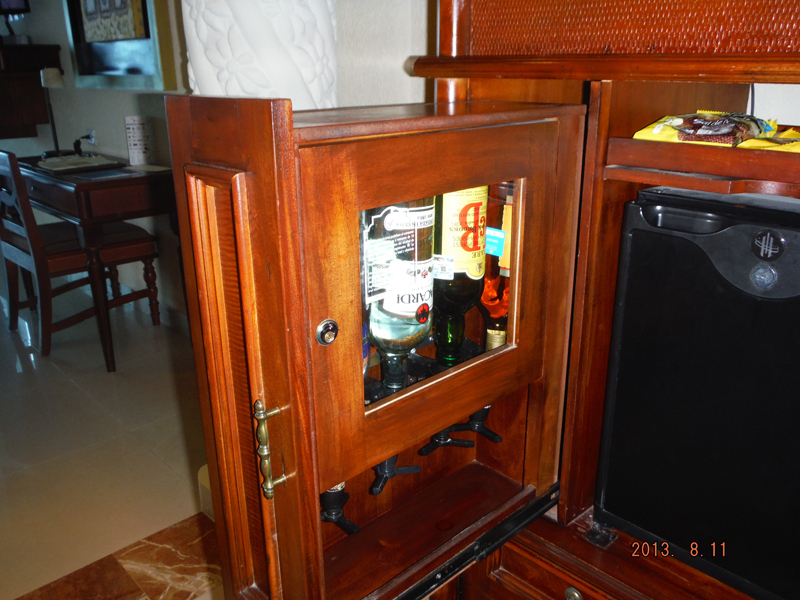 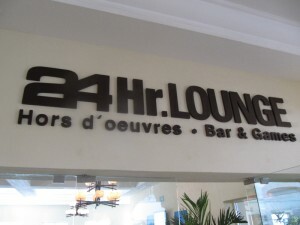 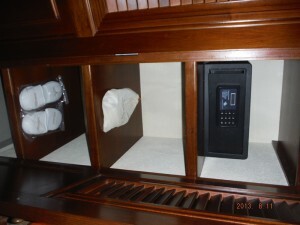 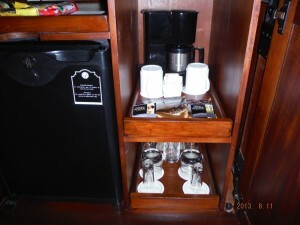 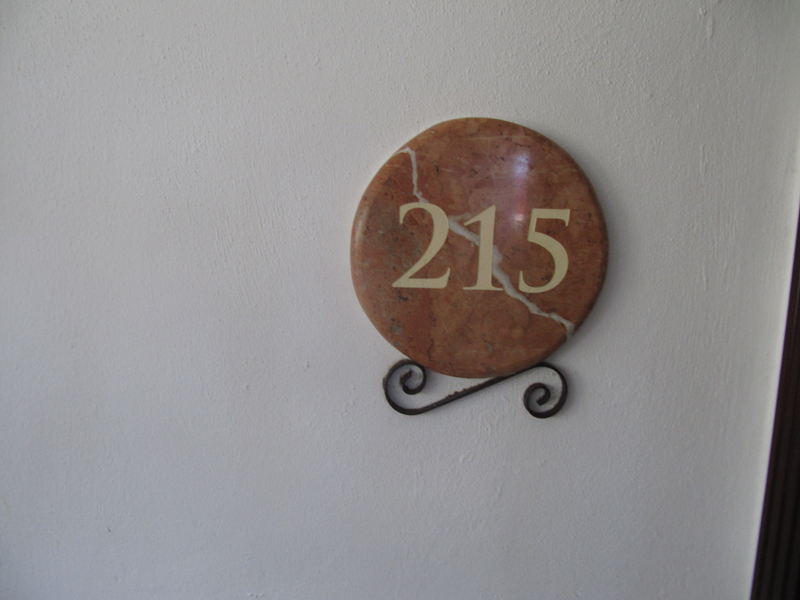 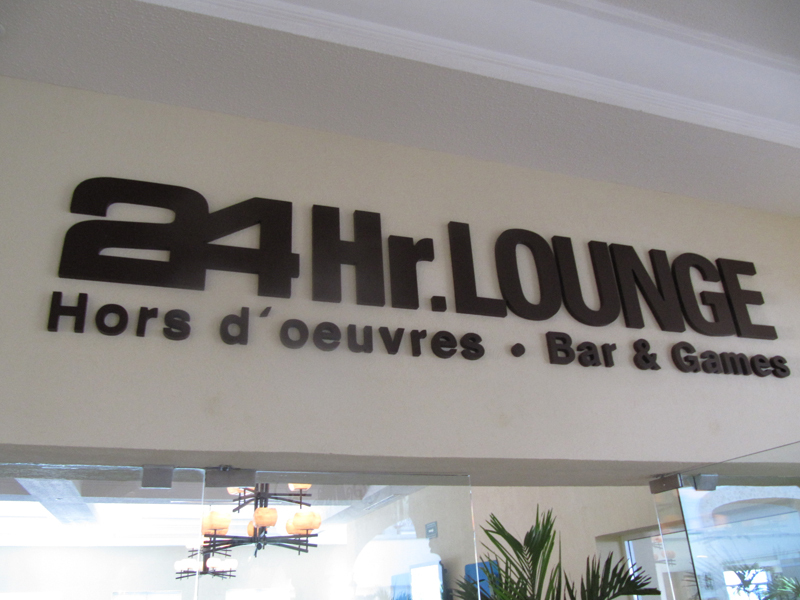 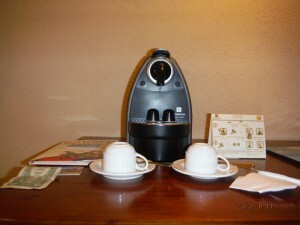 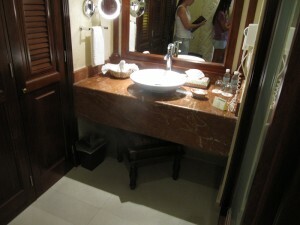 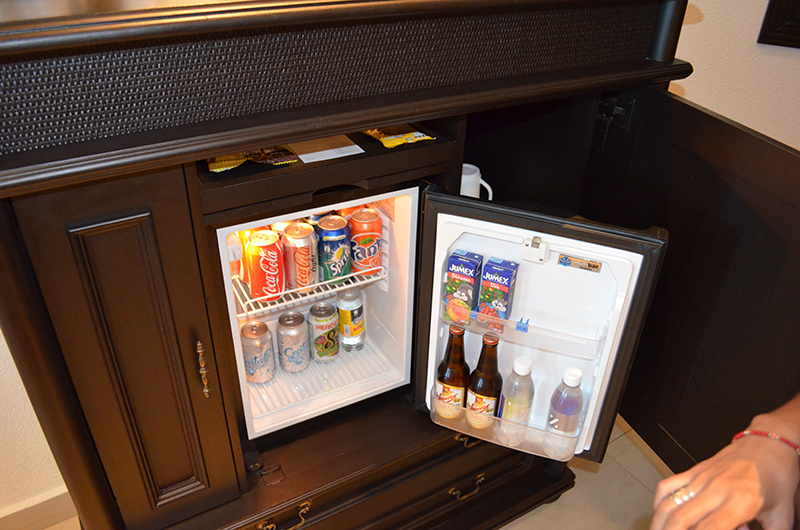 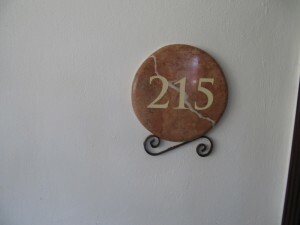 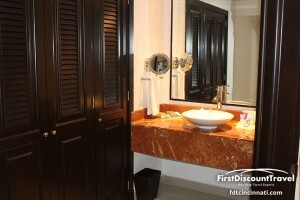 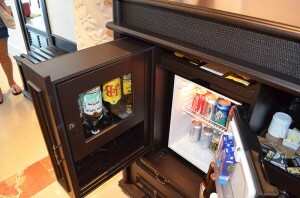 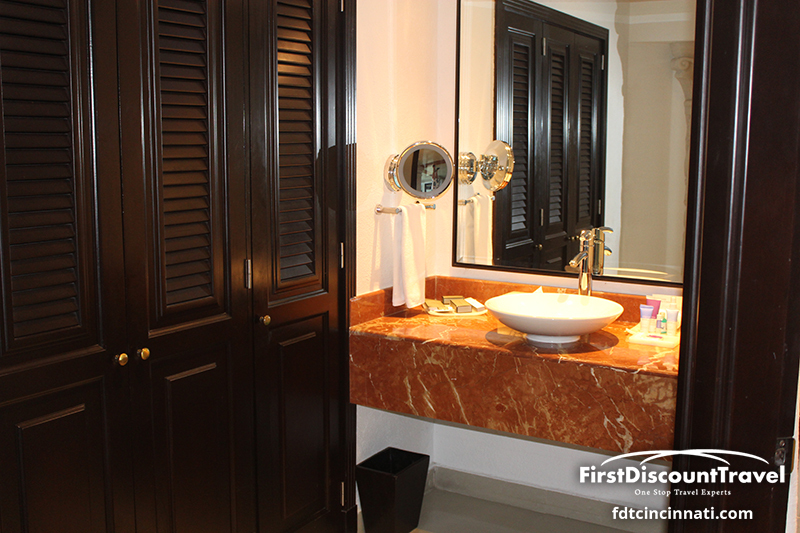 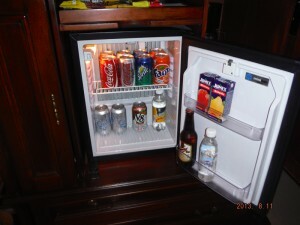 All of the rooms have a magic box for the complimentary 24 hour room service (snack bar + menu). 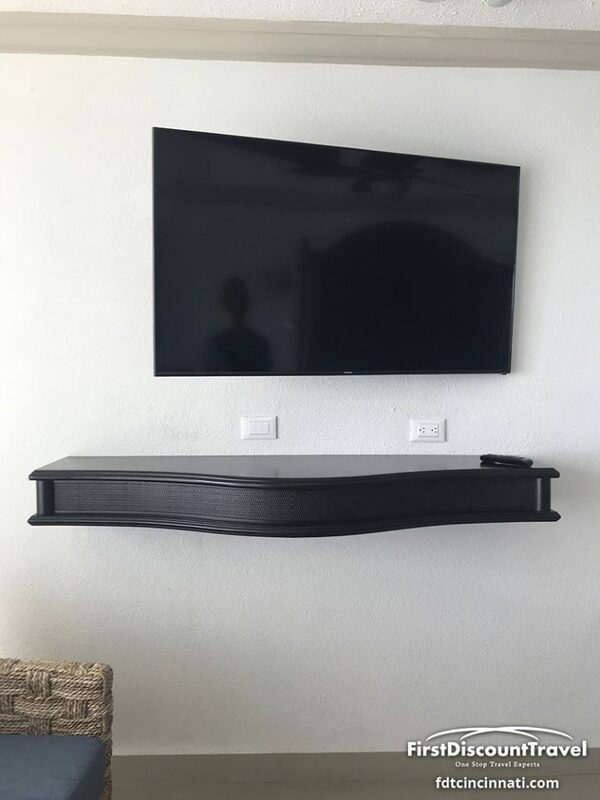 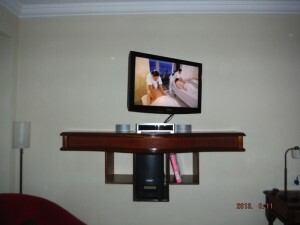 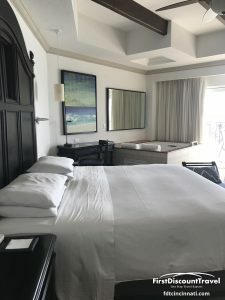 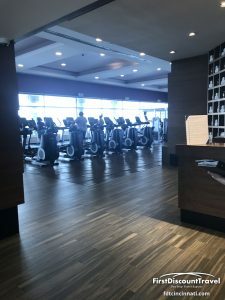 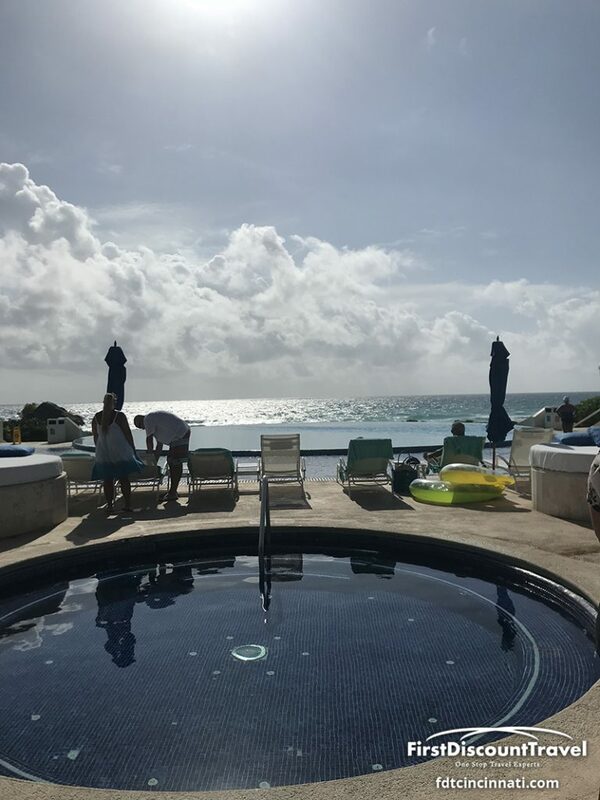 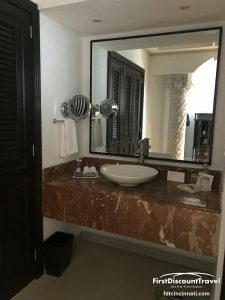 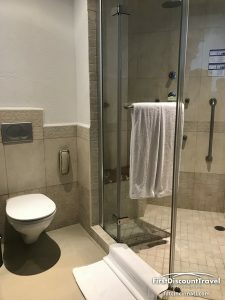 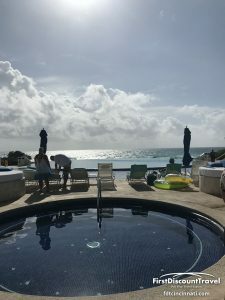 The rooms have a 37” plasma television and Royal Ocean View Jr. Suites and higher have Bose Sound system, IPOD docking station, and DVD players. 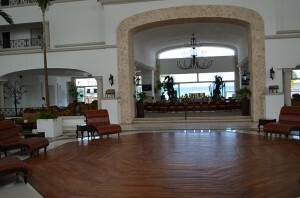 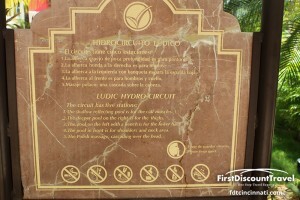 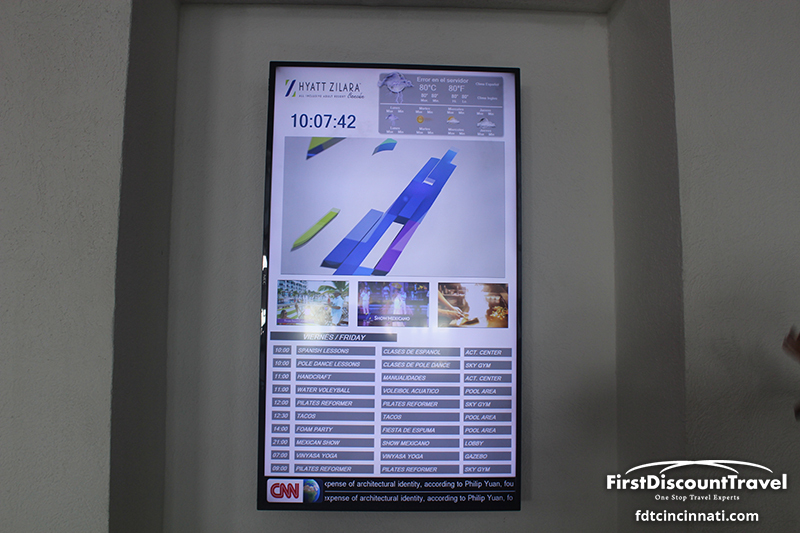 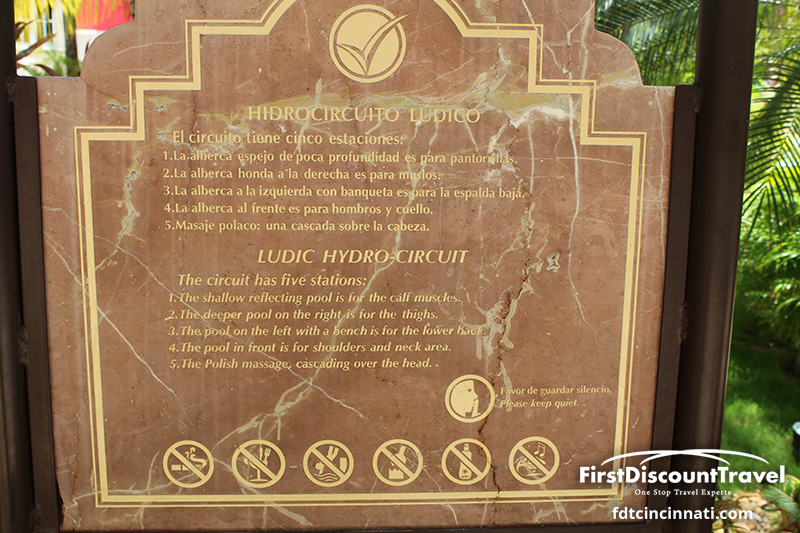 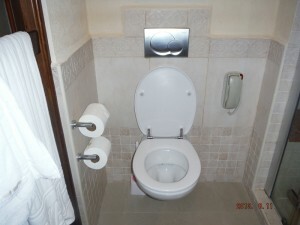 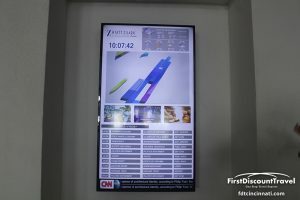 The resort has complimentary Wifi for all guests. 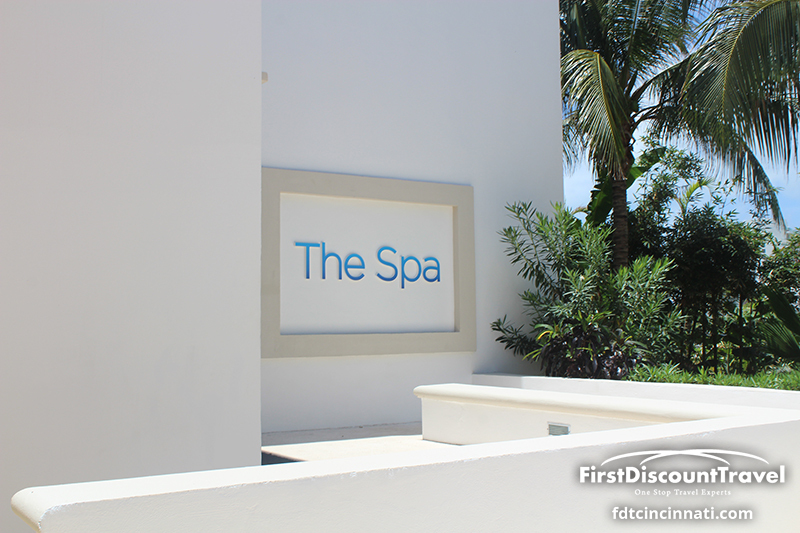 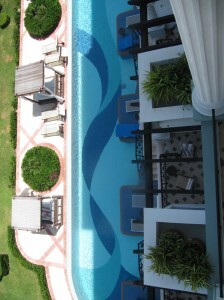 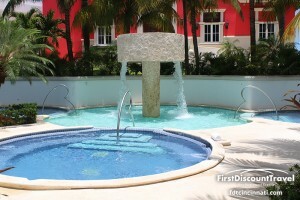 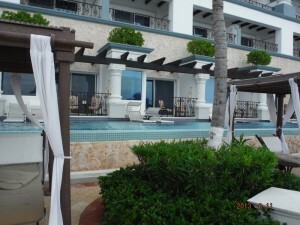 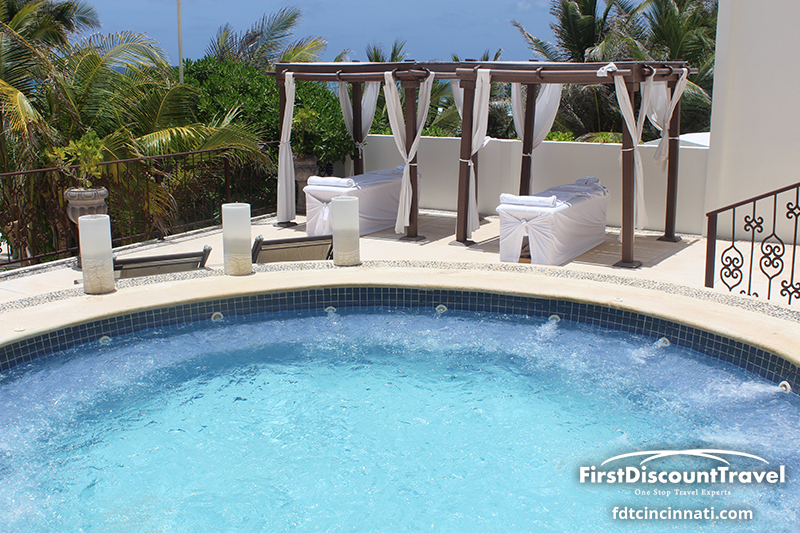 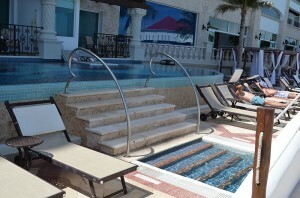 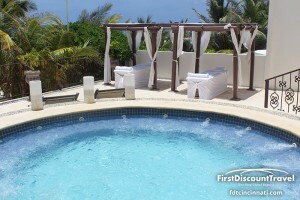 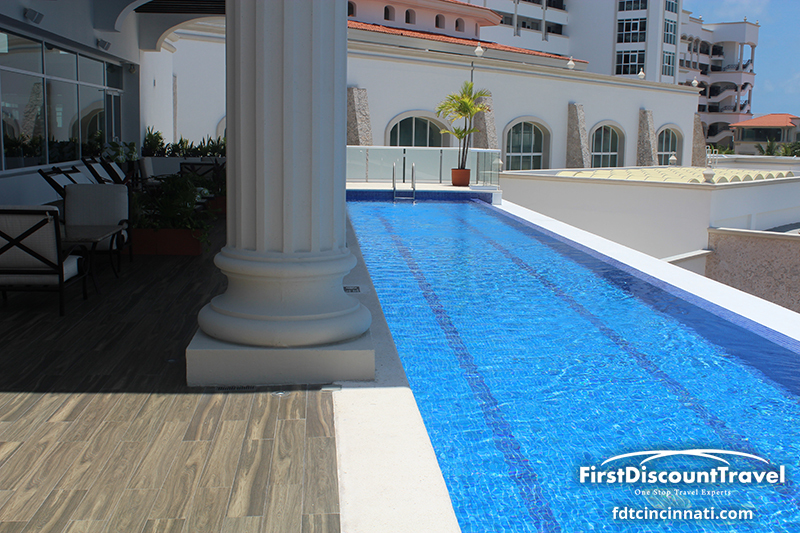 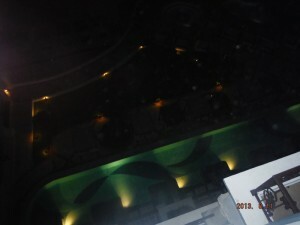 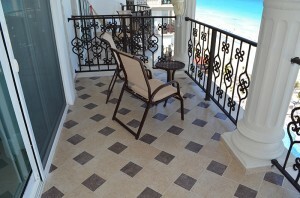 There are swim up suites available with direct access into the pool from their patio. Overall, I love the Royal. 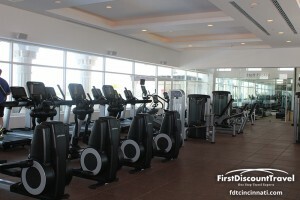 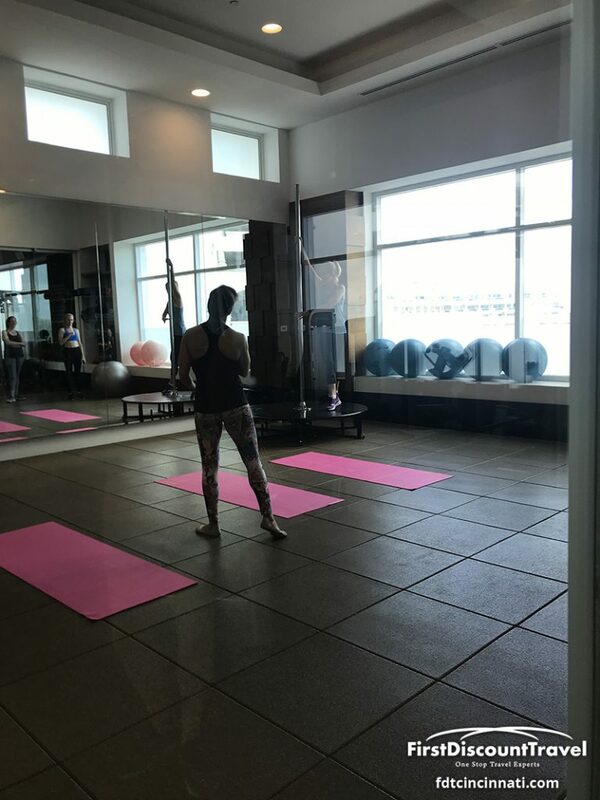 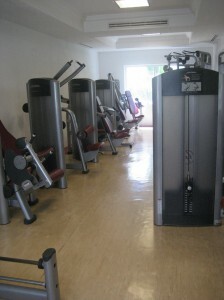 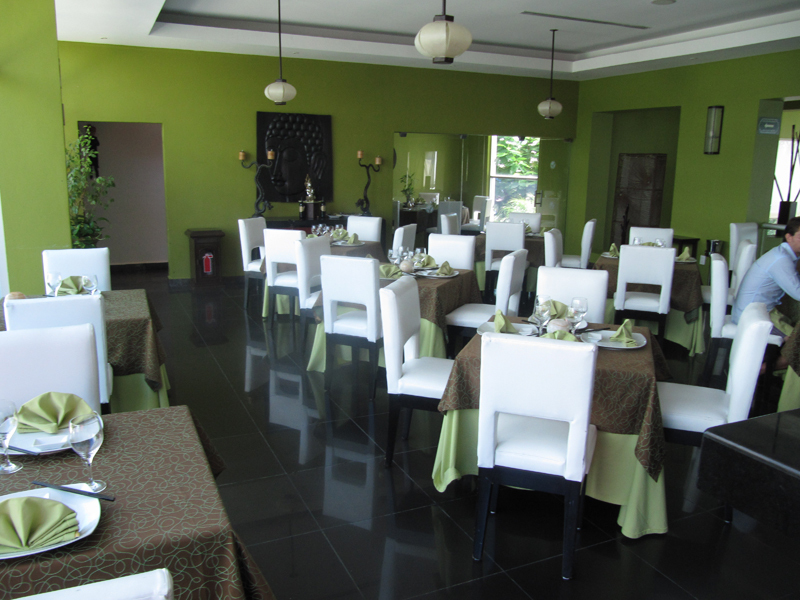 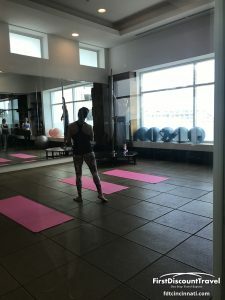 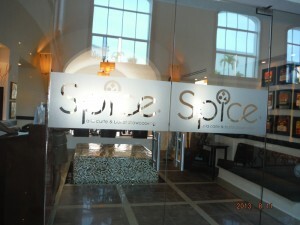 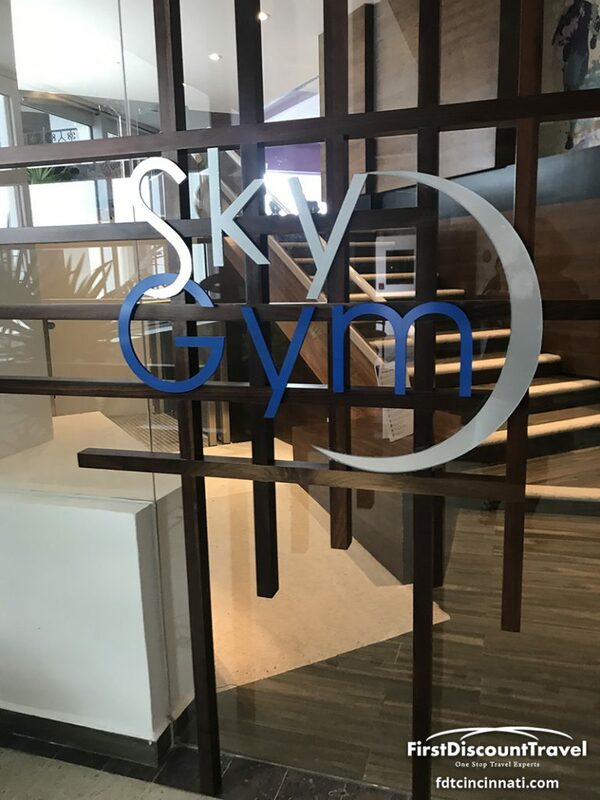 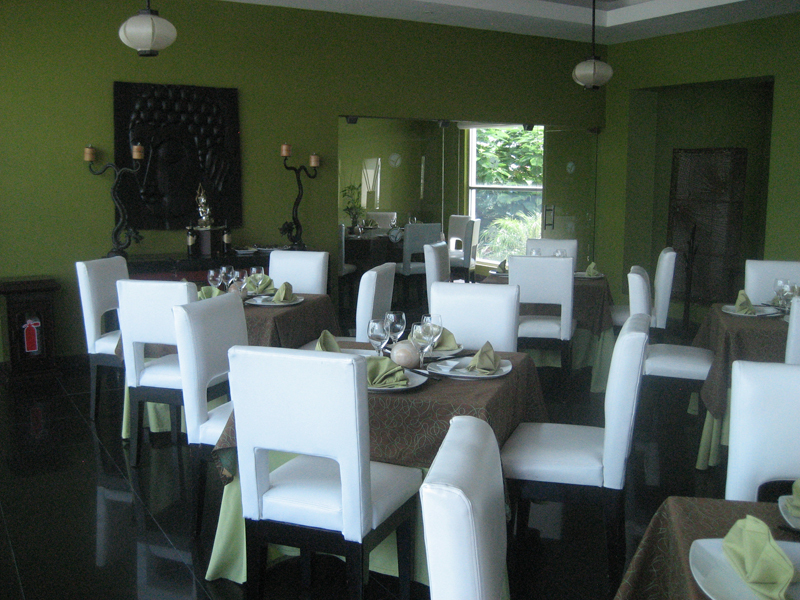 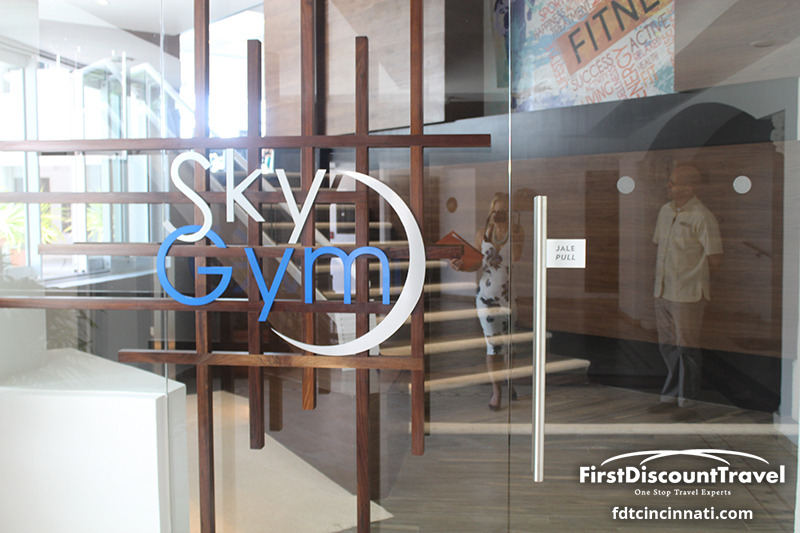 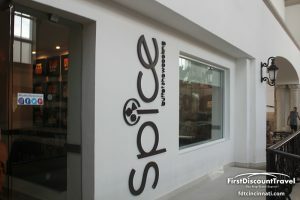 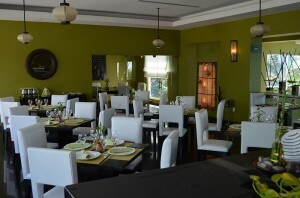 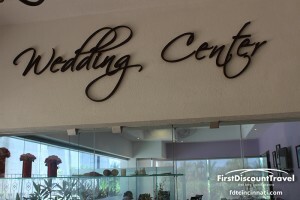 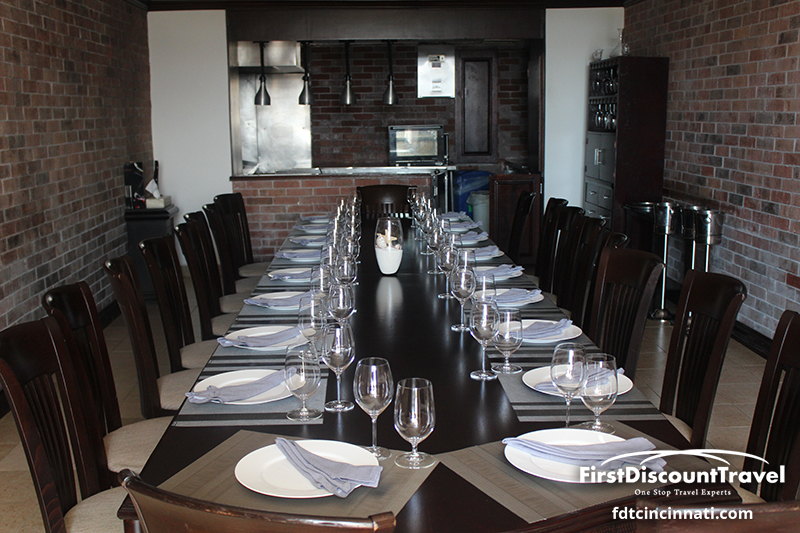 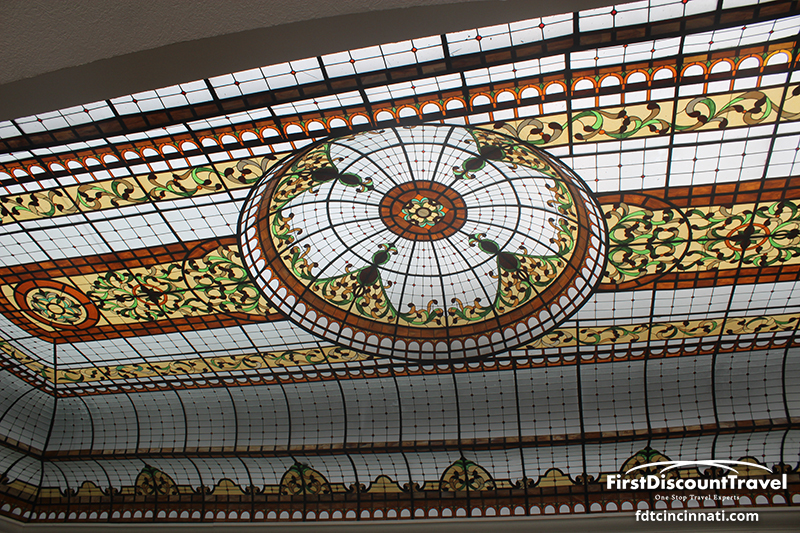 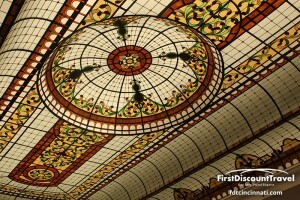 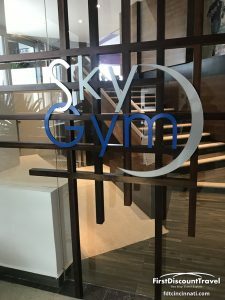 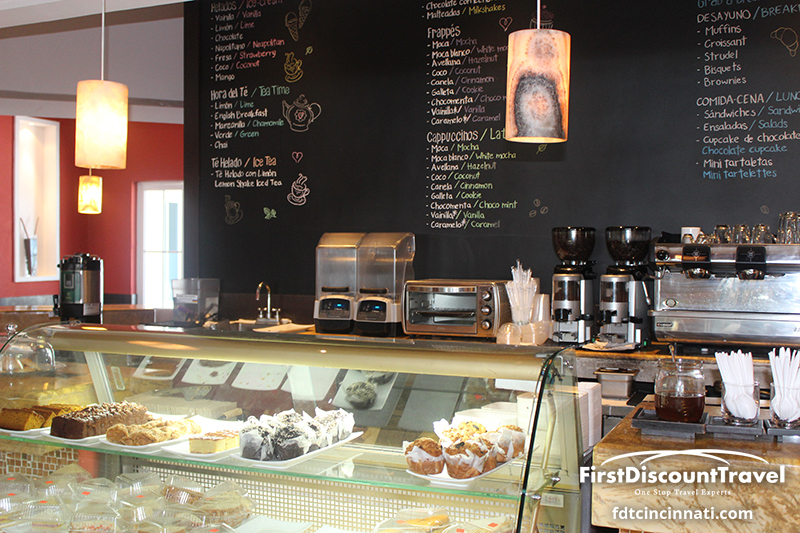 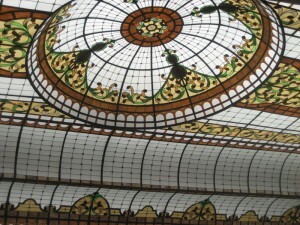 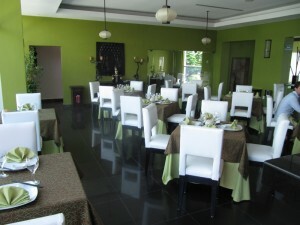 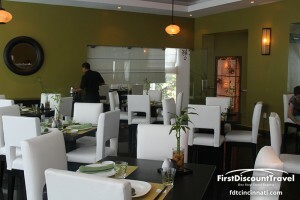 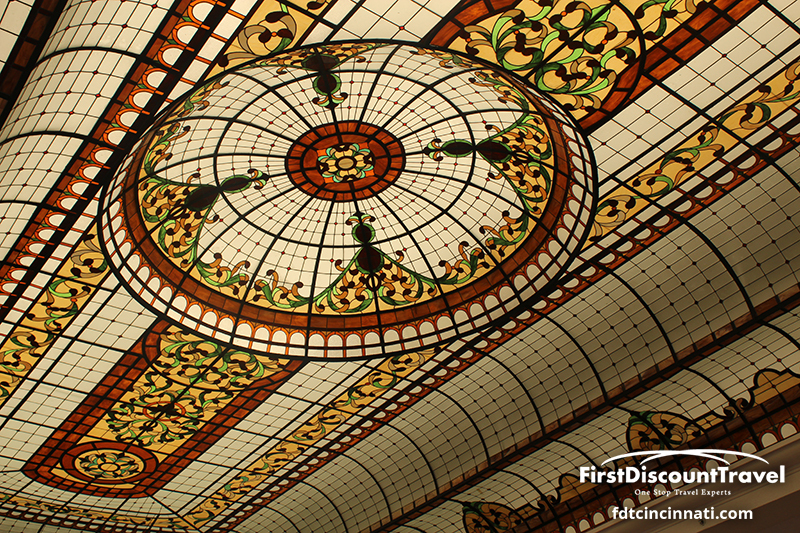 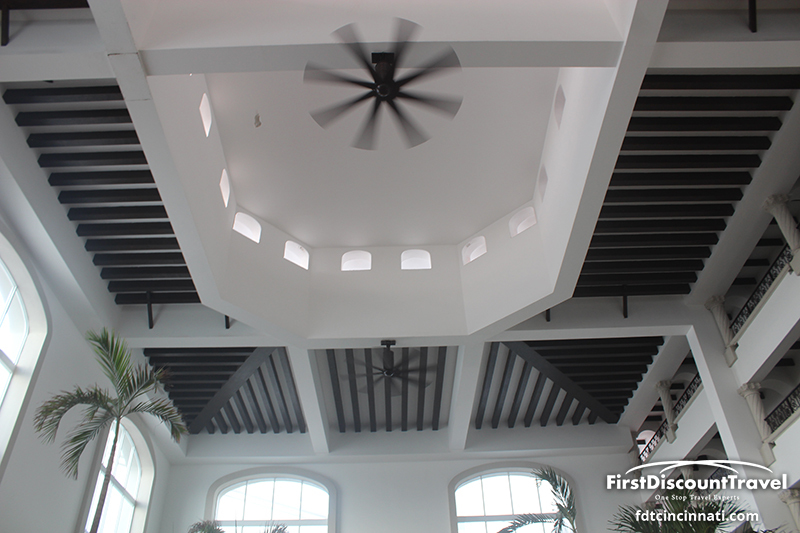 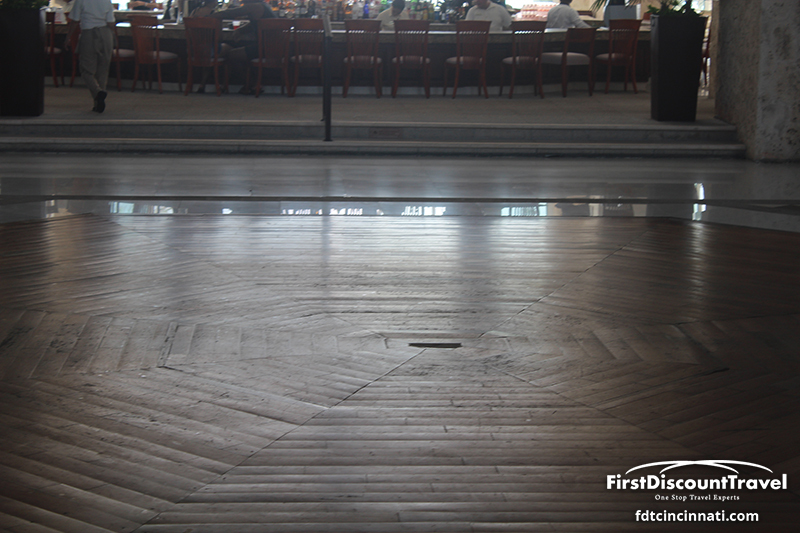 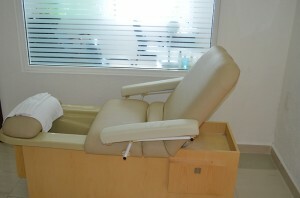 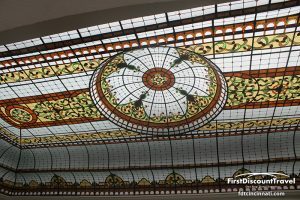 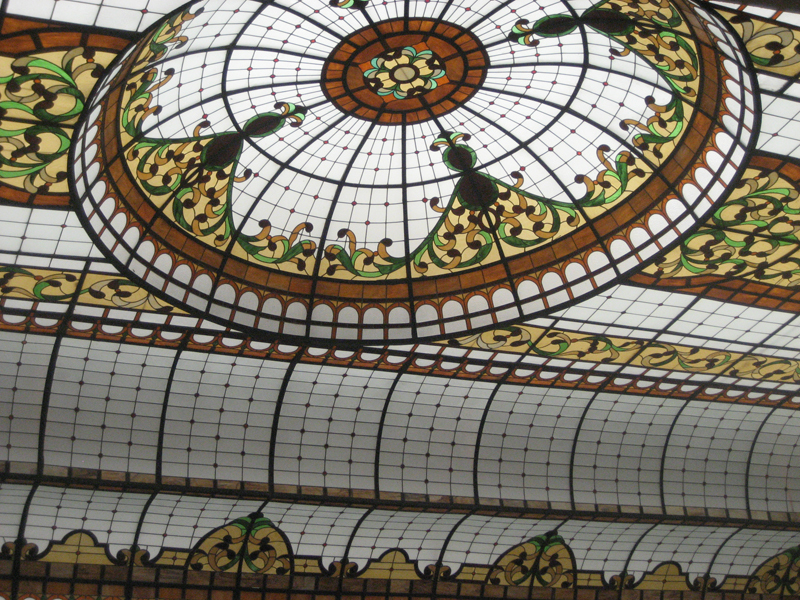 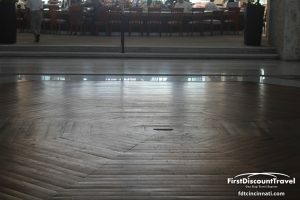 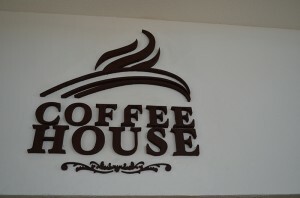 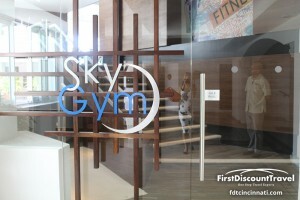 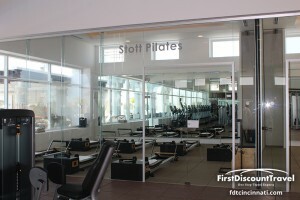 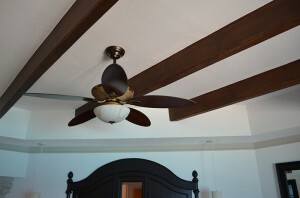 It would be a great choice for upscale clients looking for great food, nice rooms, and an active fun environment. 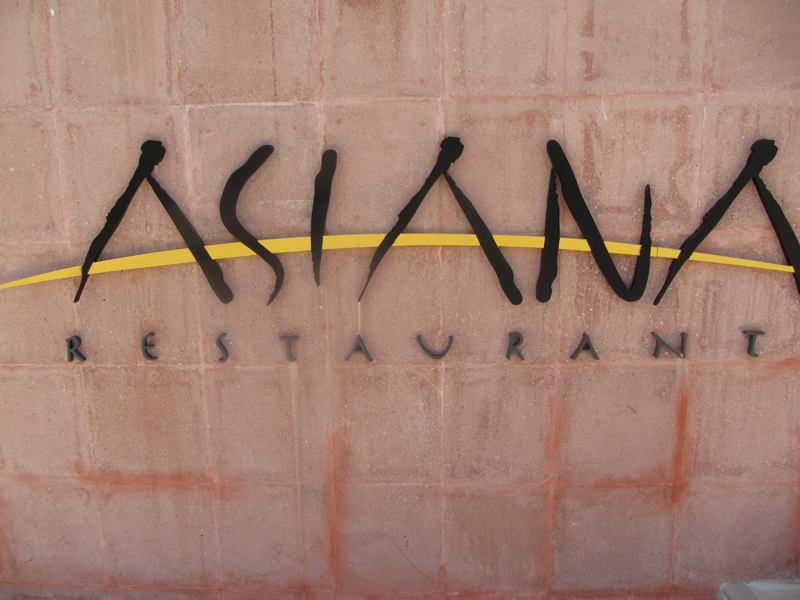 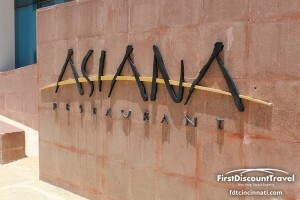 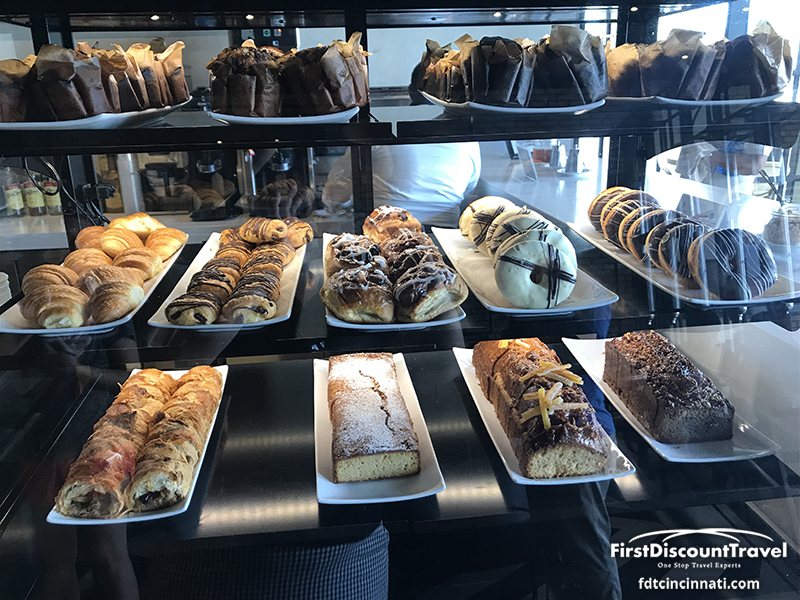 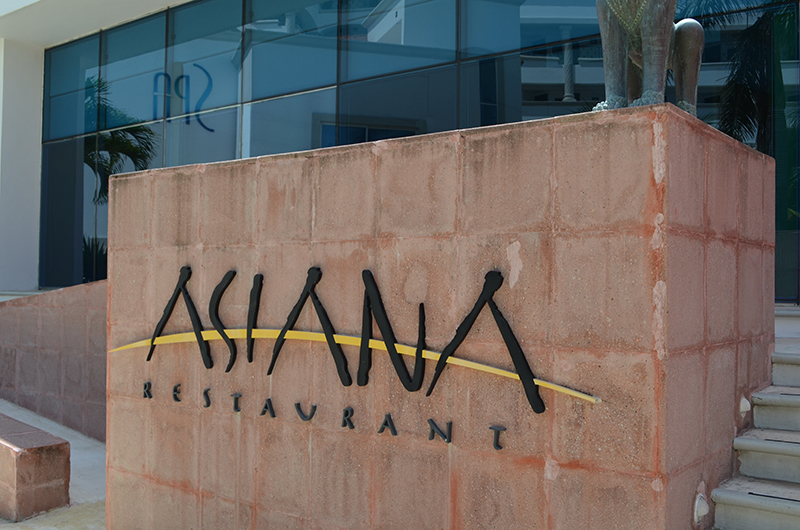 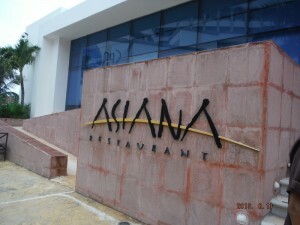 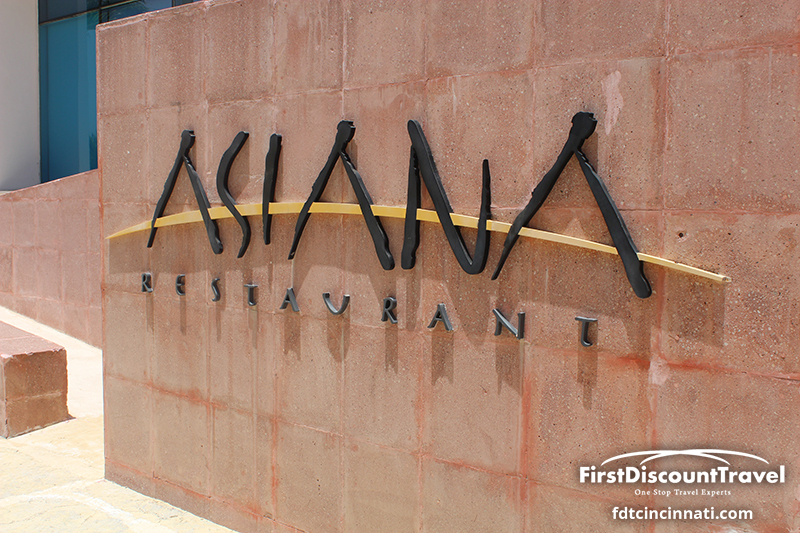 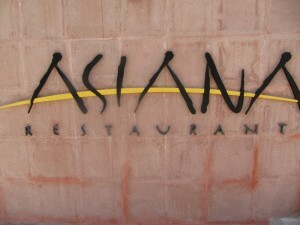 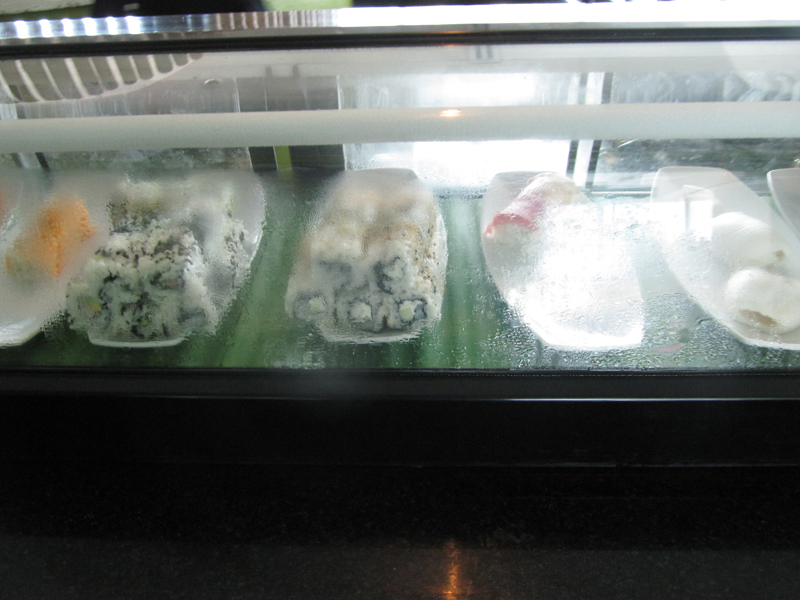 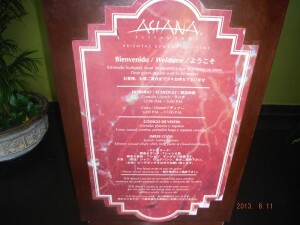 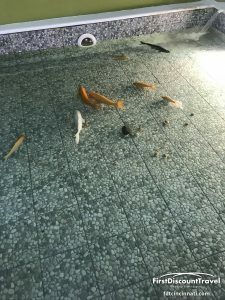 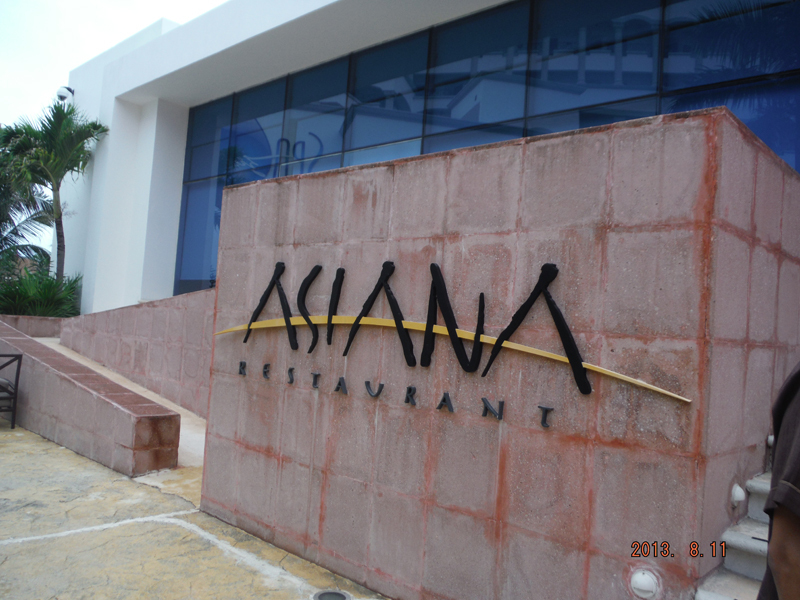 I ate at Asiana and it was wonderful.